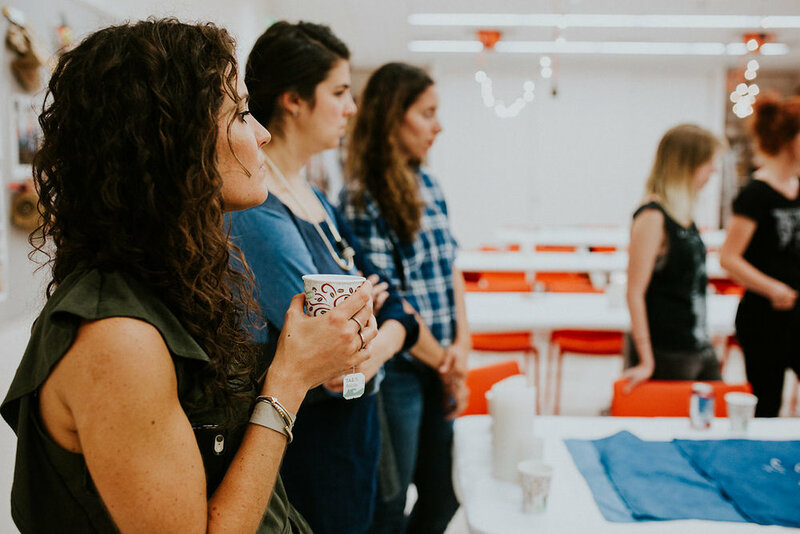 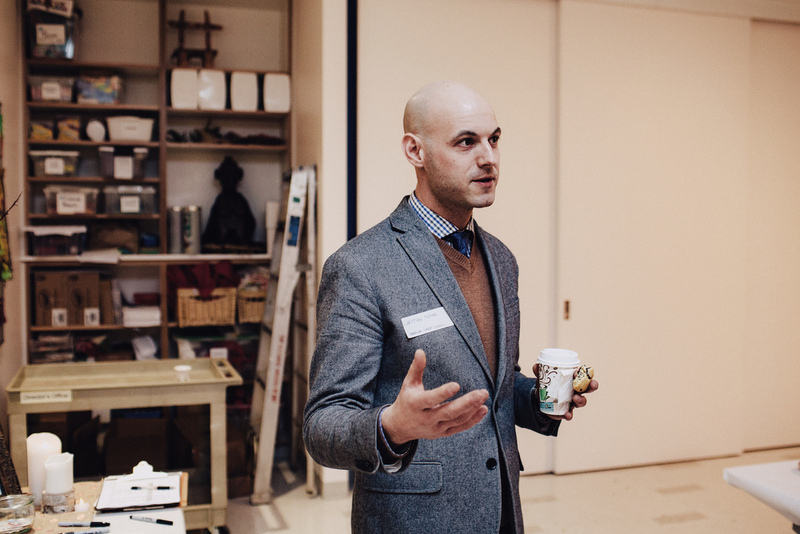 Our first event of 2018 focused on process rather than final product, and was all about tapping into your inner consciousness. 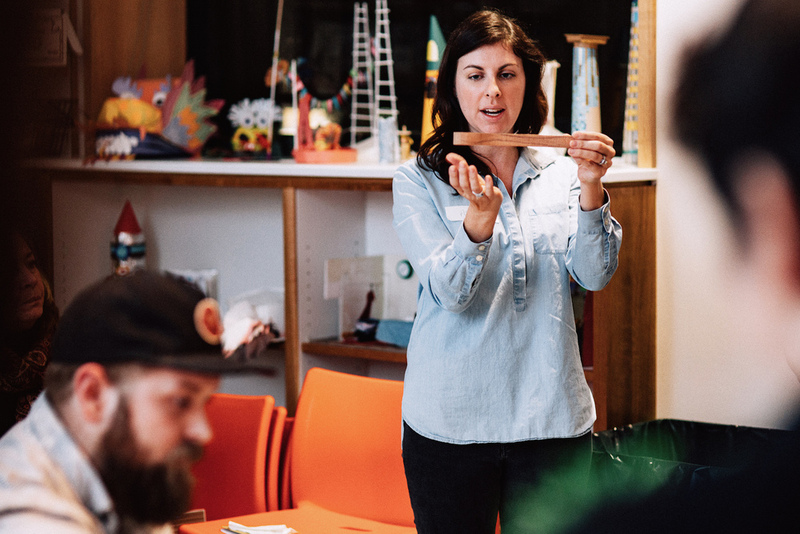 We teamed up with visionary artist Buckley to present a workshop on accessing your automatic creativity and reaching that elusive flow state. 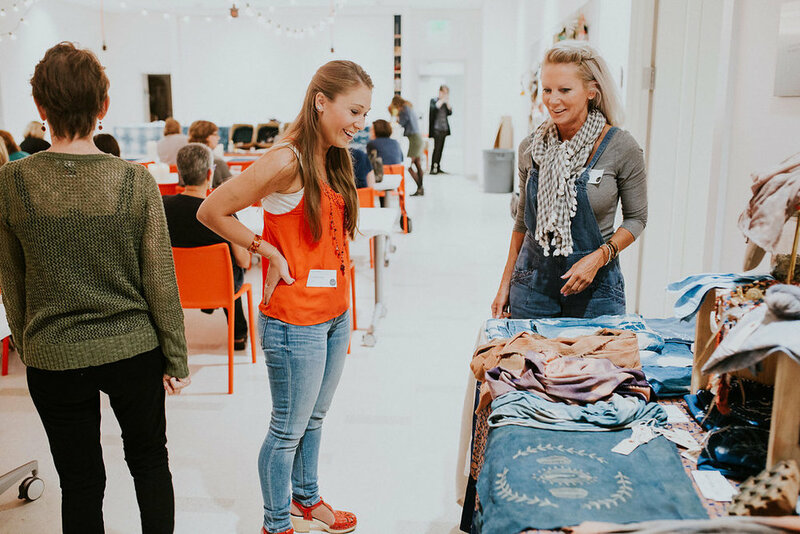 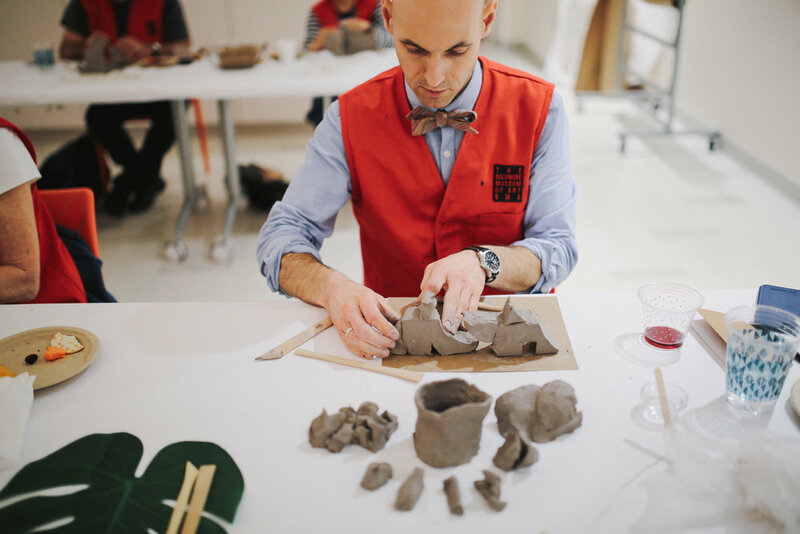 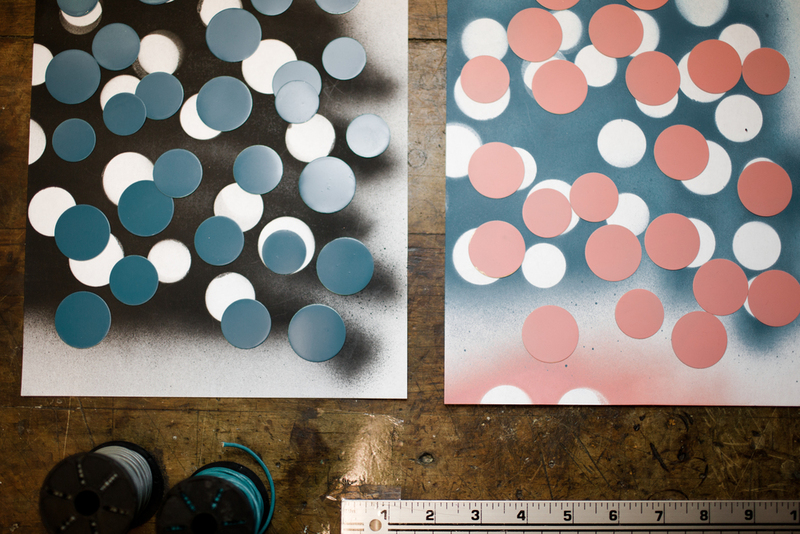 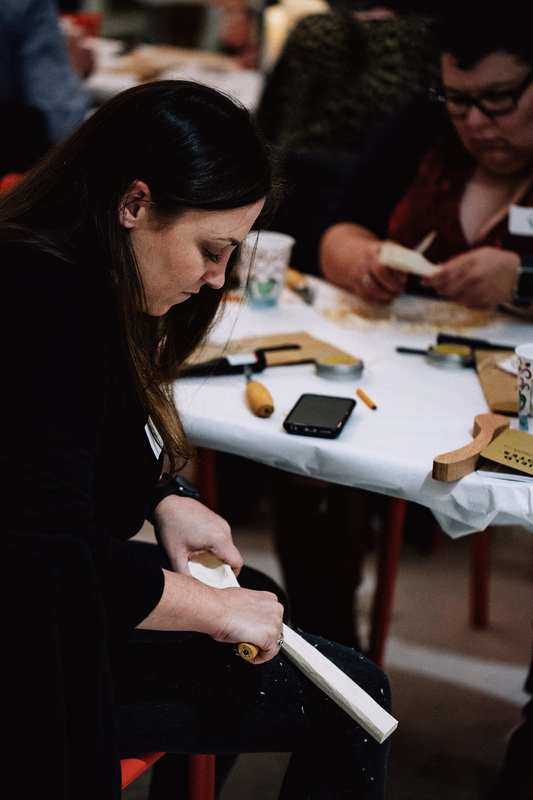 We were honored to partner for the third year running with the American Craft Council in advance of their annual show of super creative craftspeople and artisans. 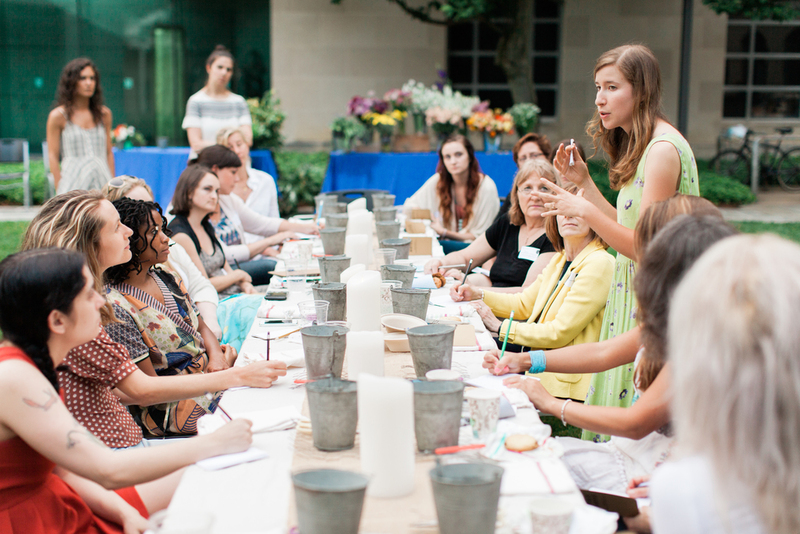 The event included a thorough (and illuminating, if you ask us!) 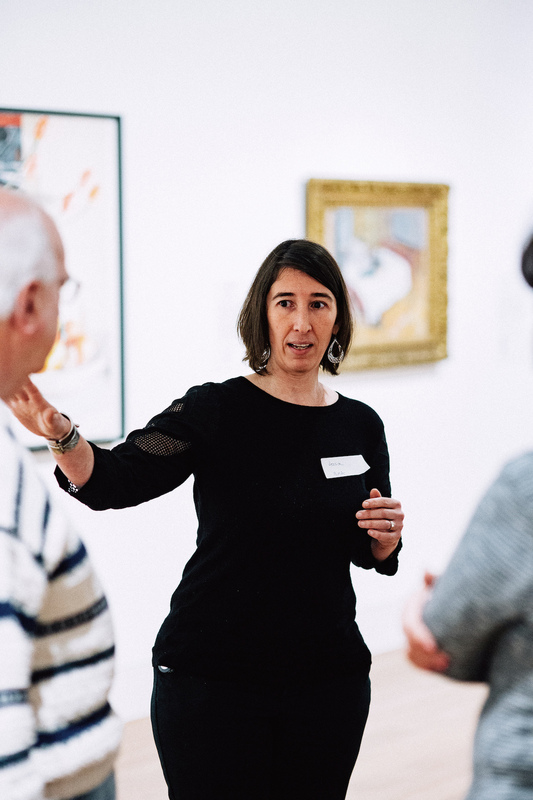 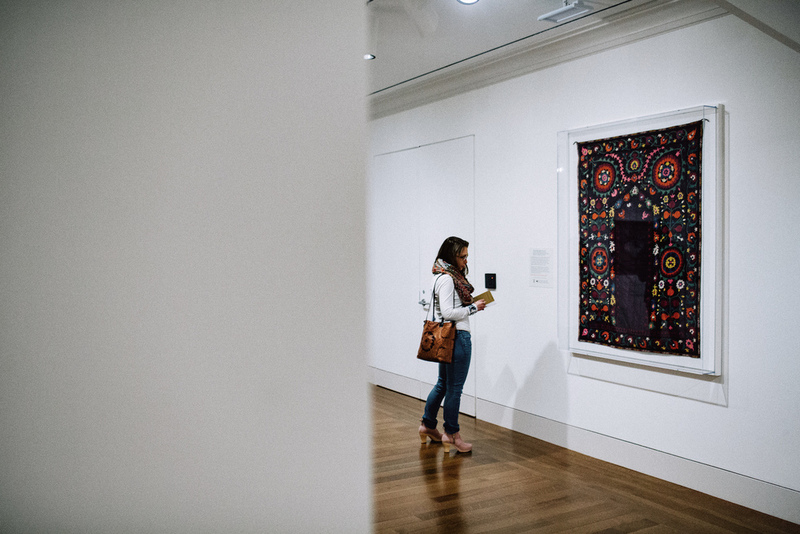 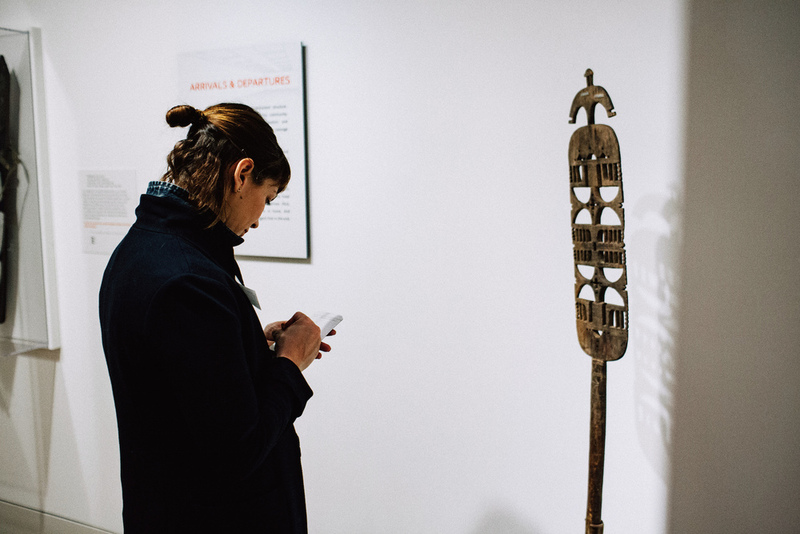 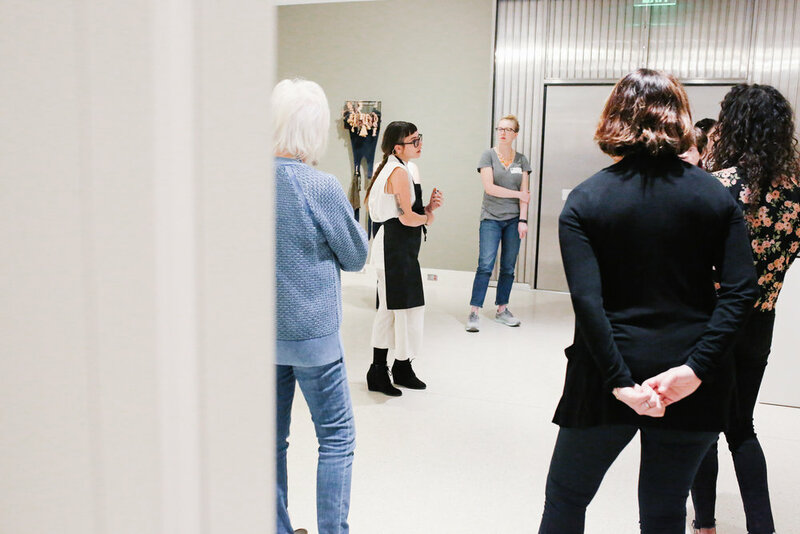 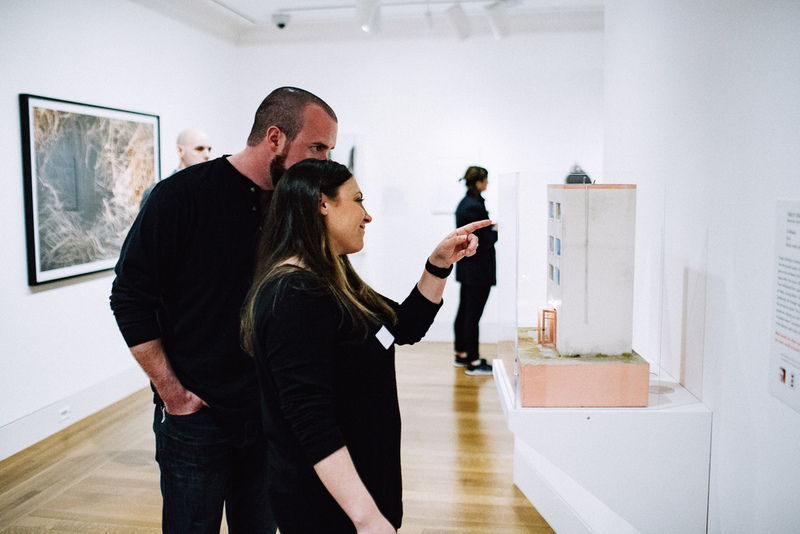 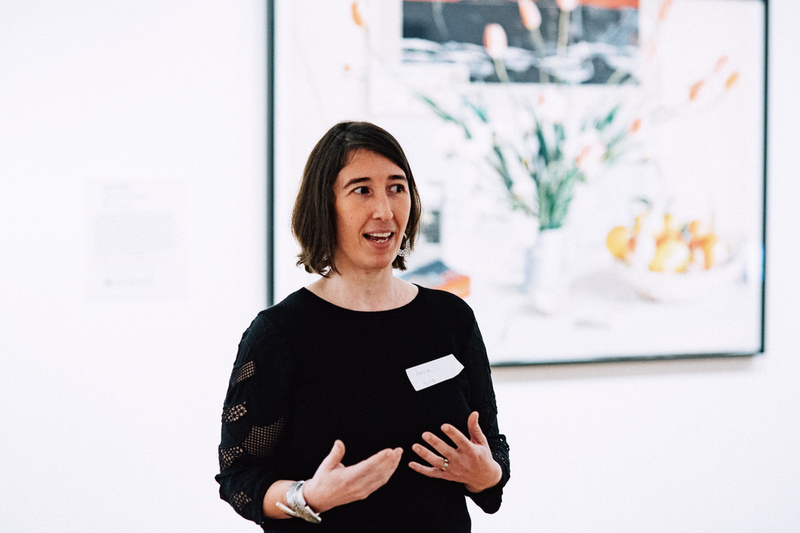 gallery talk of the BMA's Senga Nengudi and Njideka Akunyili Crosby exhibitions, before diving headfirst into a guided meditation and workshop led by Buckley. 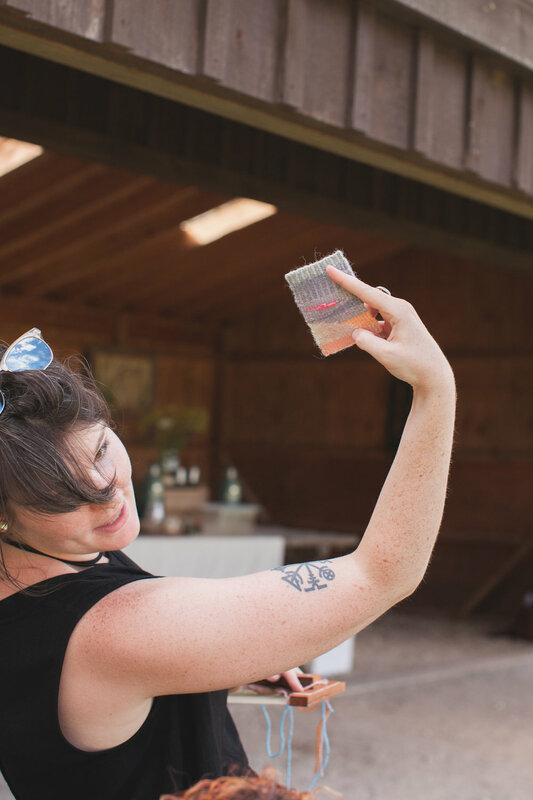 The coolest canned wine provided by Old Westminster Winery. 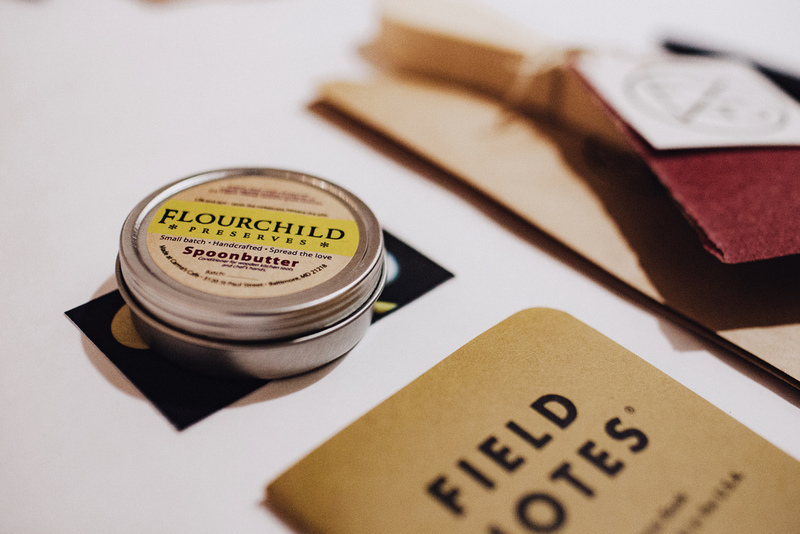 In the mood to flow? 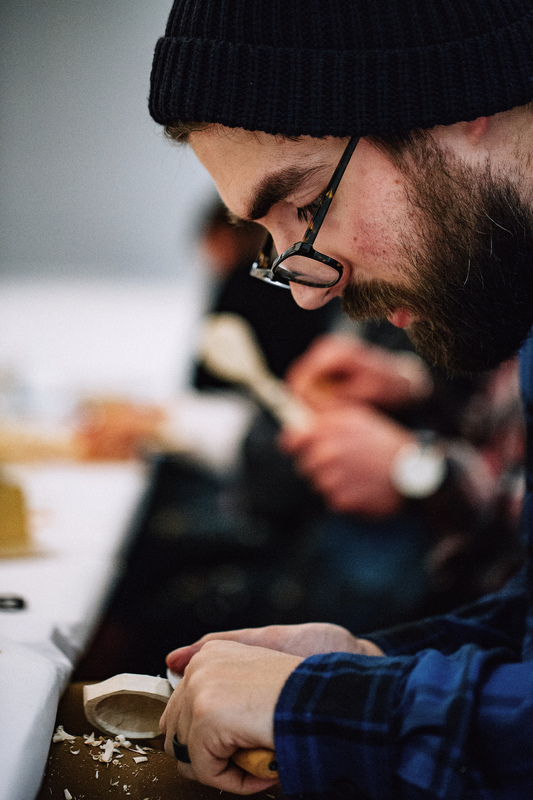 Find the playlist here. 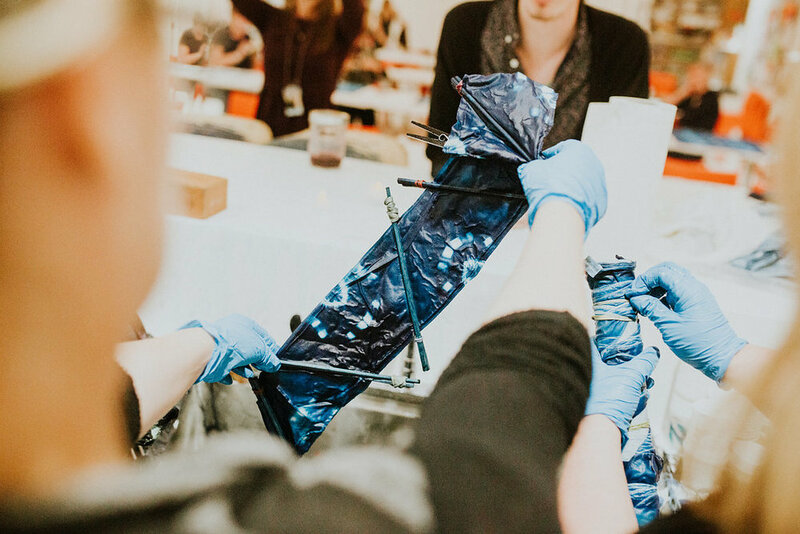 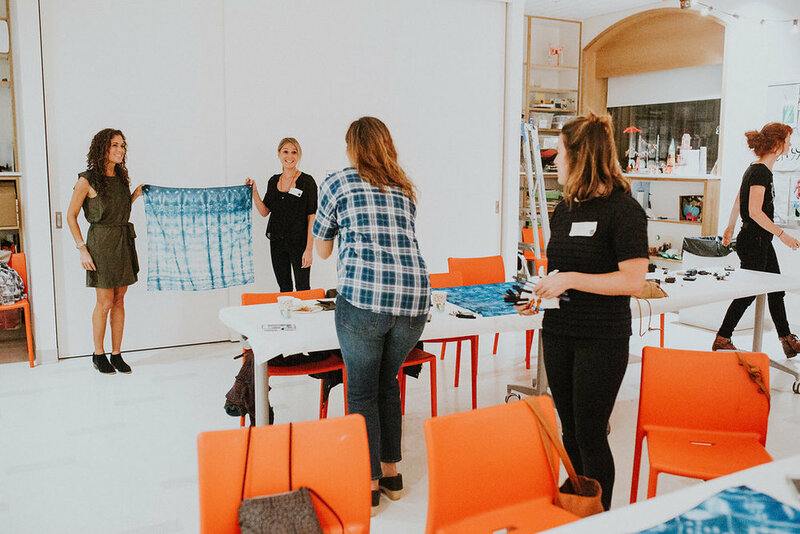 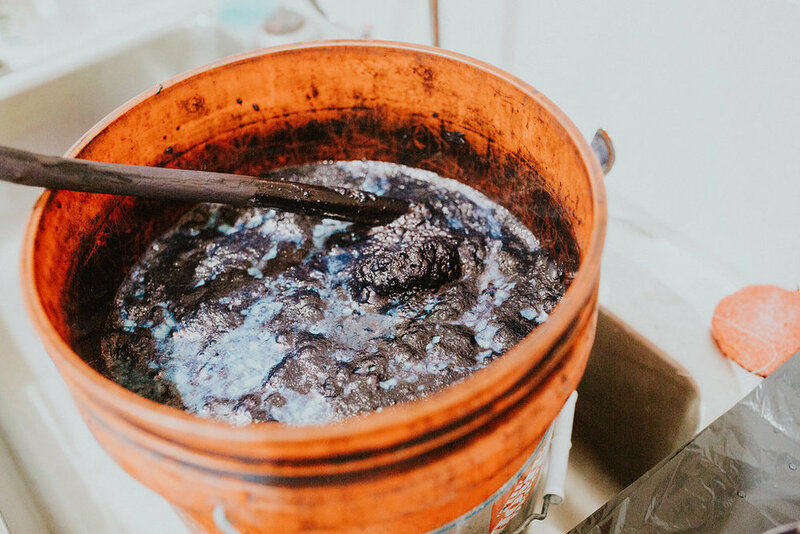 Our final installment of our series at the Baltimore Museum of Art was an indigo-dyeing party hosted in conjunction with Wax & Wane Fiber. 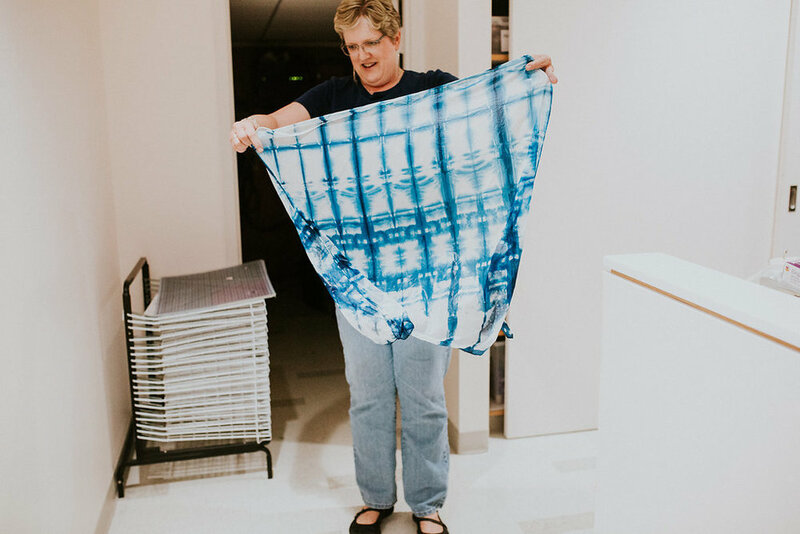 Ashton and Claire schooled us on the secrets of shibori, and then we toured the exquisite Kimono and Obi exhibition for inspiration before trying our hands at the ancient technique. 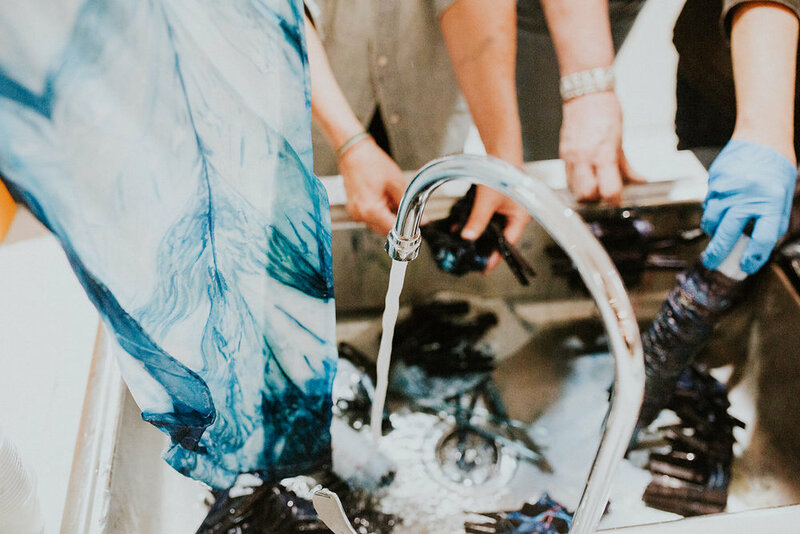 We're still sighing over that pure indigo blue. 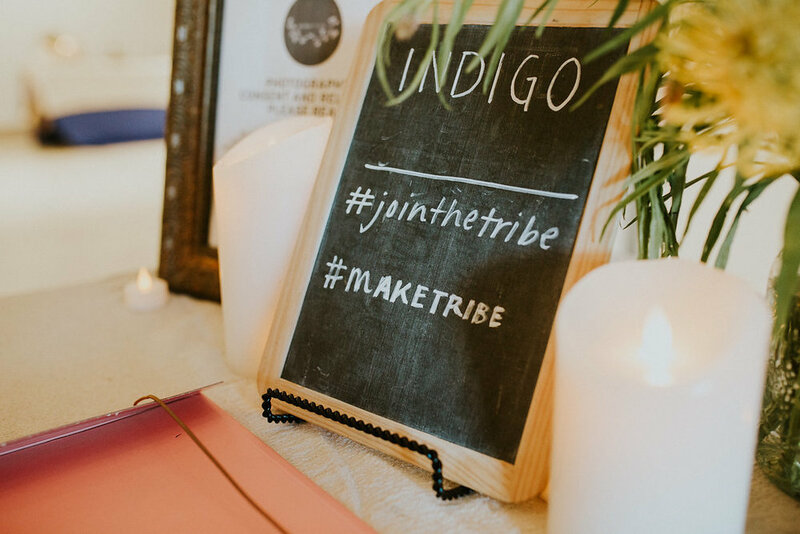 Let's just say this: Once you've seen indigo in action, you won't go back. 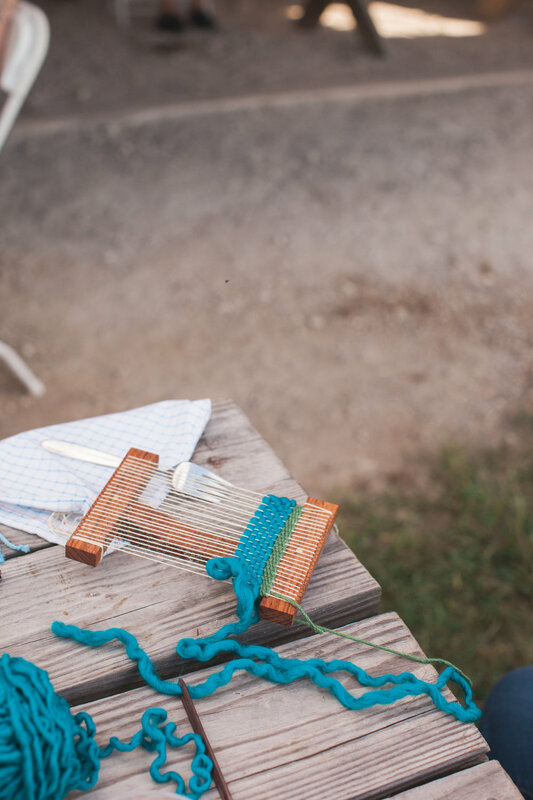 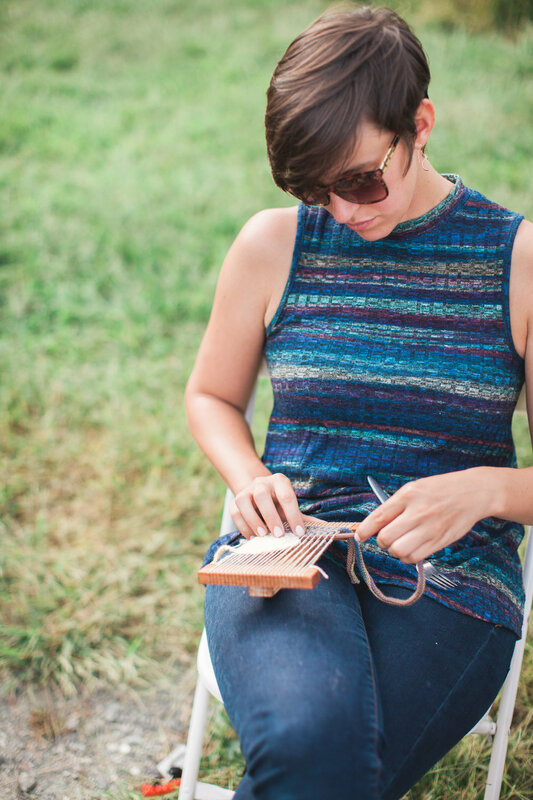 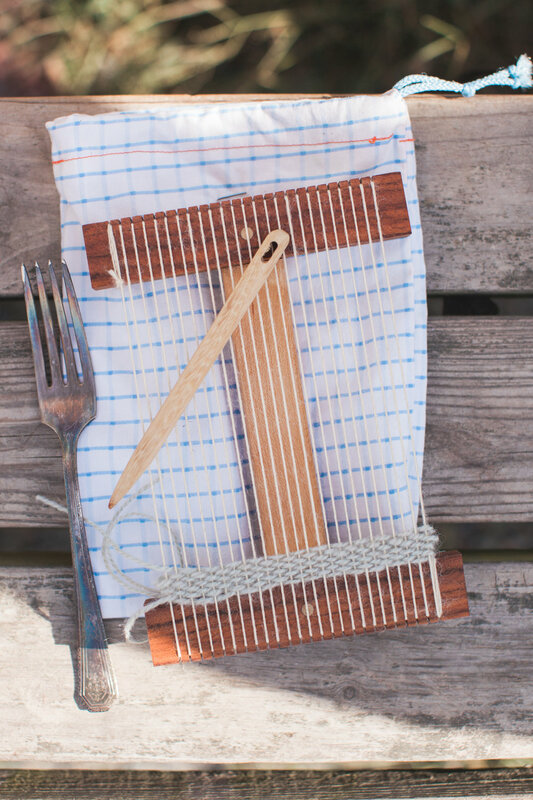 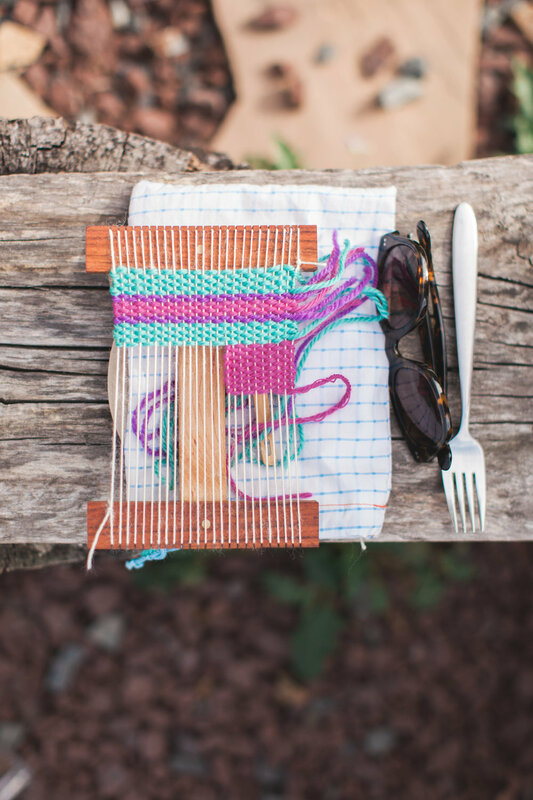 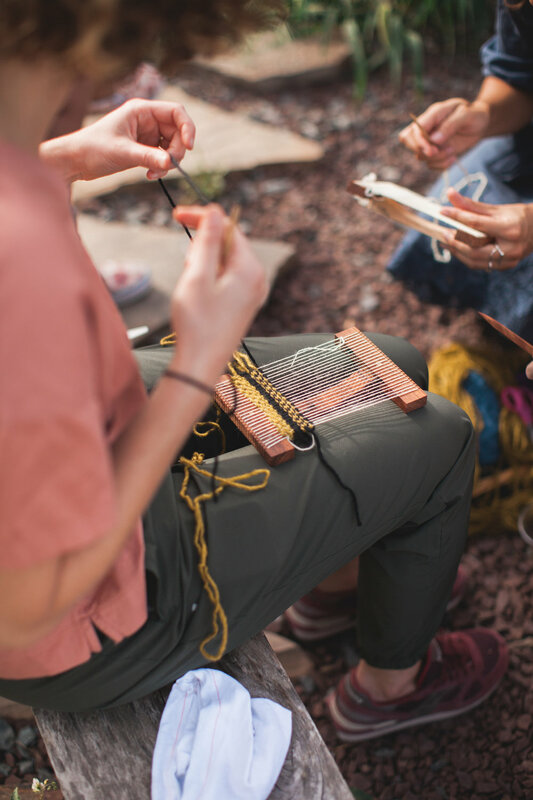 A warm September sun greeted us at Irvine Nature Center for our weaving event with artist Clare Nicholls. 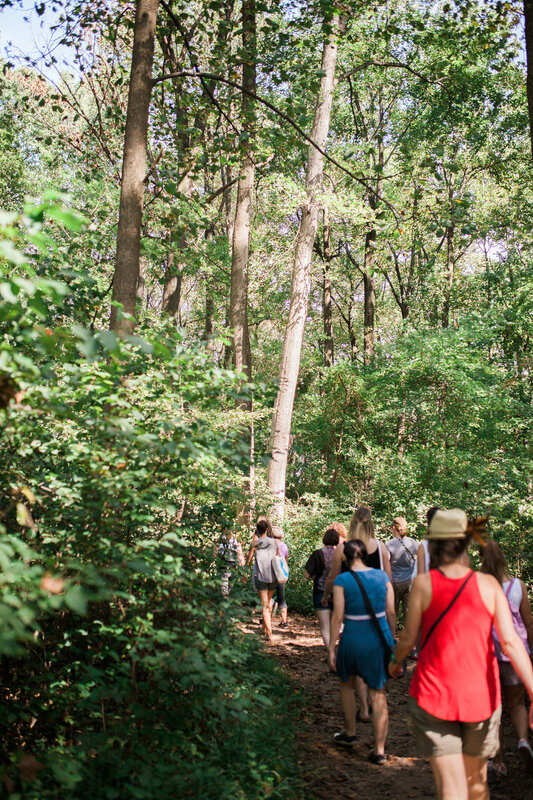 We set off on a brief nature walk, strolling through lush woods to a clearing in the meadow, where we then embarked on a maze of warp and weft. 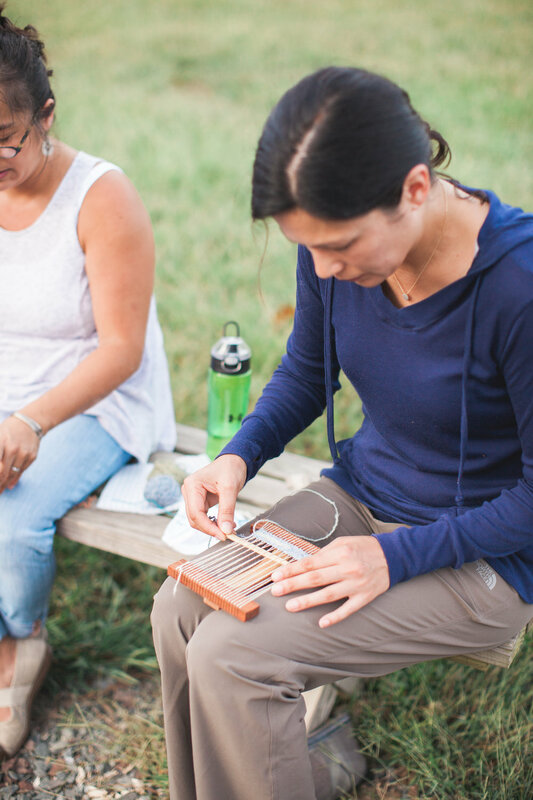 Gathering around the fire circle, we learned the basics of the tapestry weaving, and soaked up the last of summer. 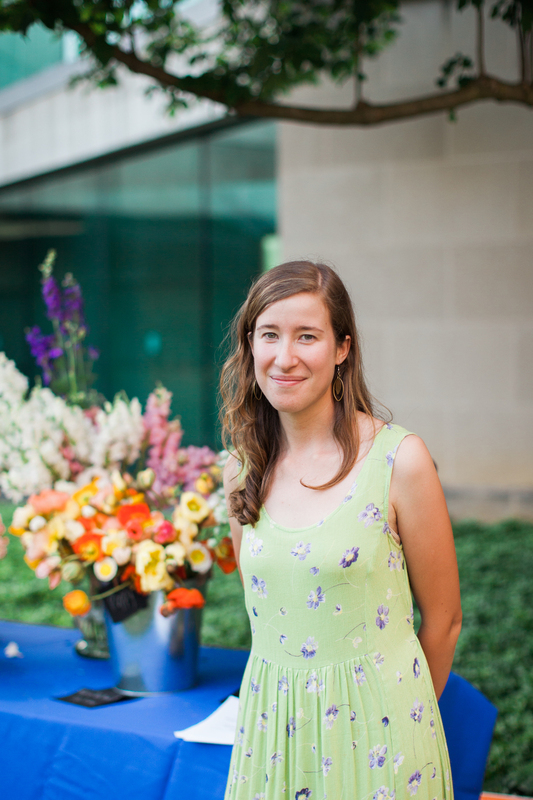 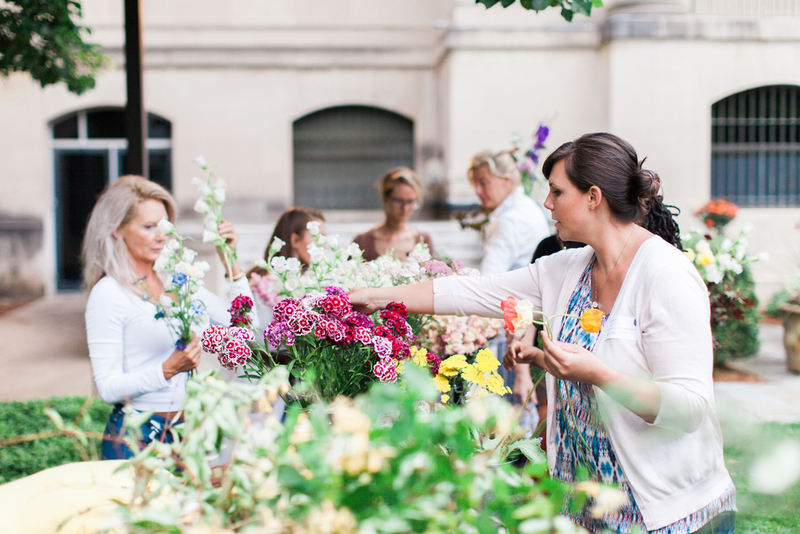 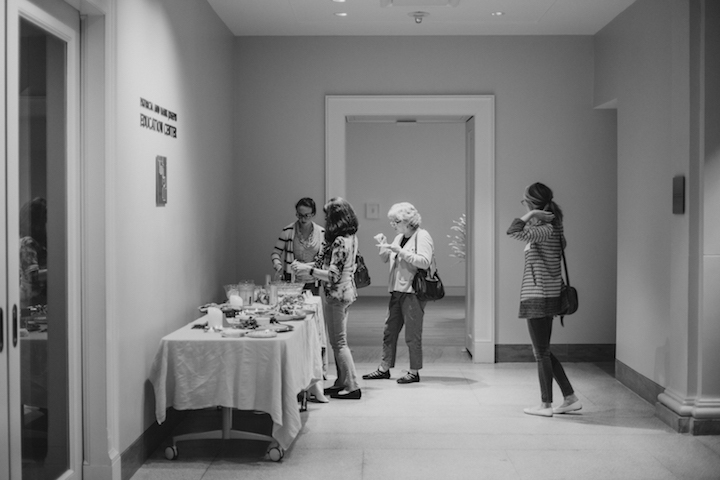 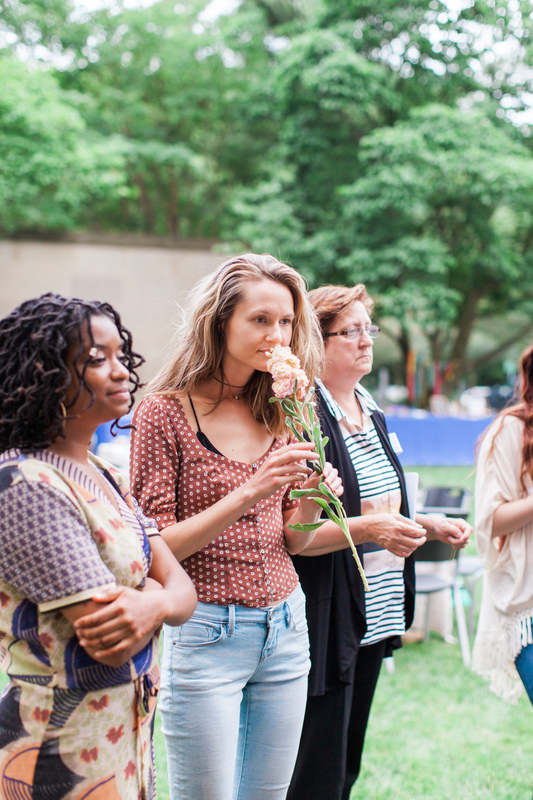 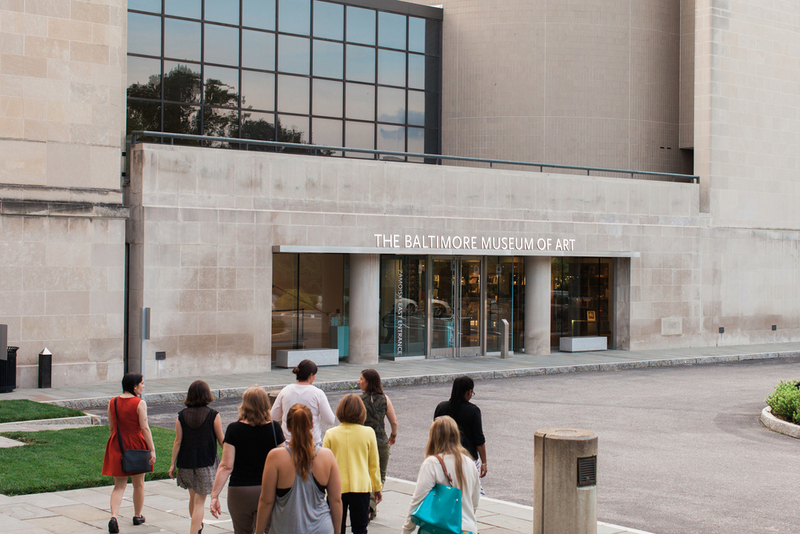 The third event in our partnership with the Baltimore Museum of Art celebrating the Imagining Home exhibition was focused on floral arranging and edible blooms. 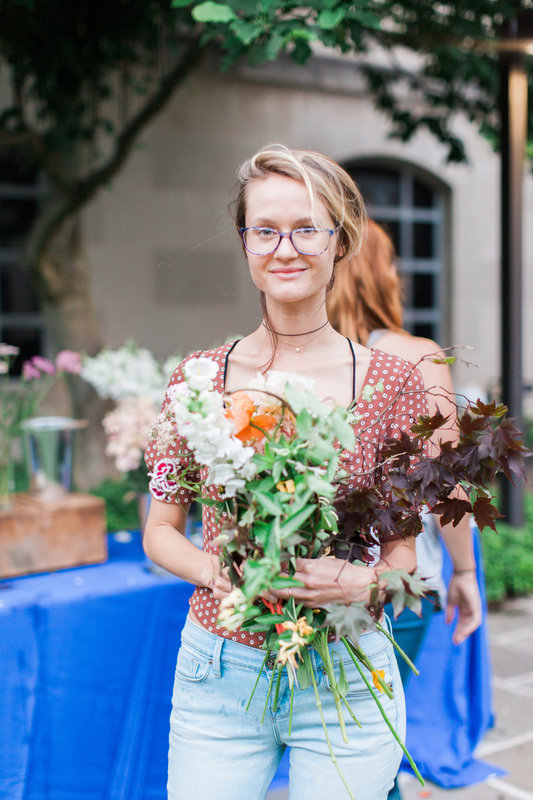 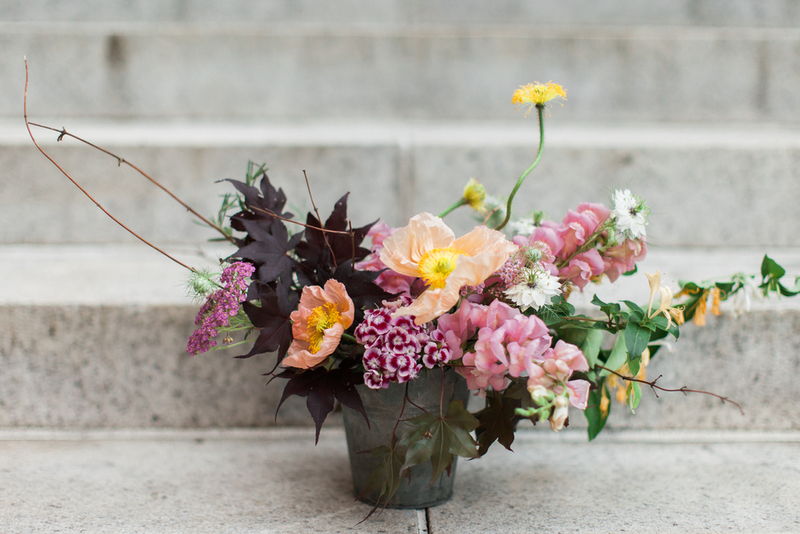 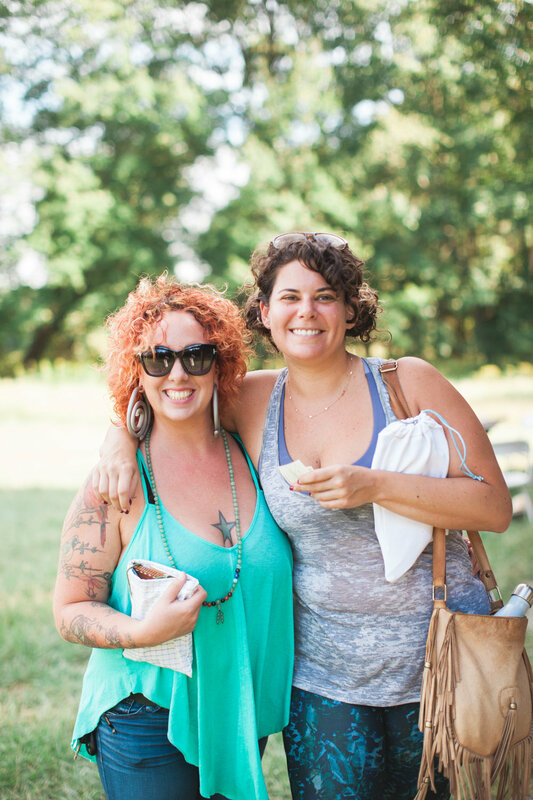 Laura Beth of Butterbee Farm shared organic gardening secrets and Mary Ellen of Steelcut Flower Co. showed us the steps to crafting an artful arrangement (hint: focus on movement and trust your eye!). 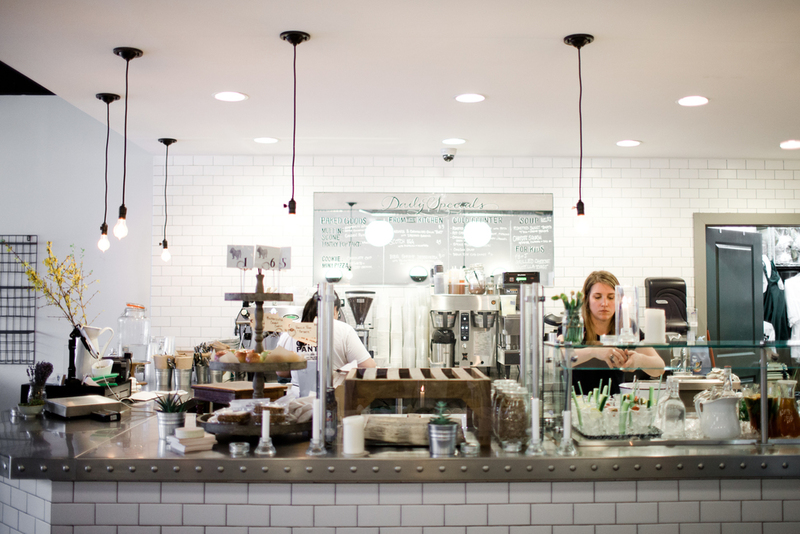 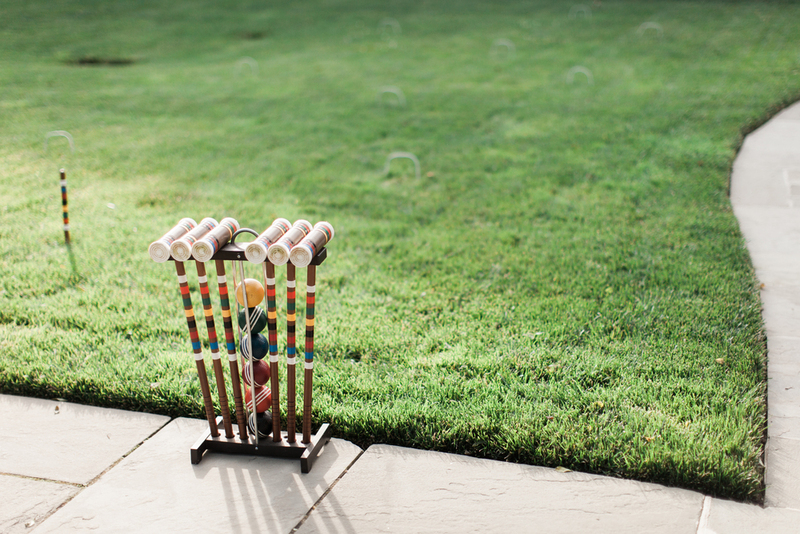 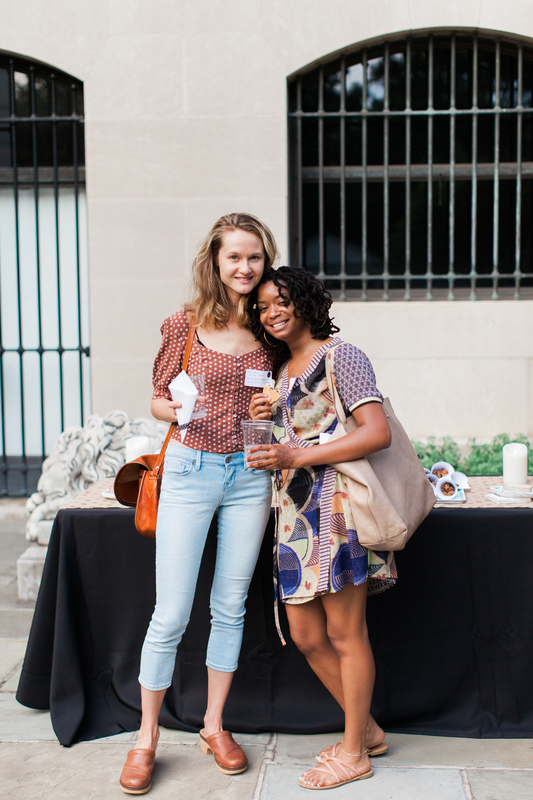 We capped things off with scoops of Little Baby's Ice Cream and some summery sounds. 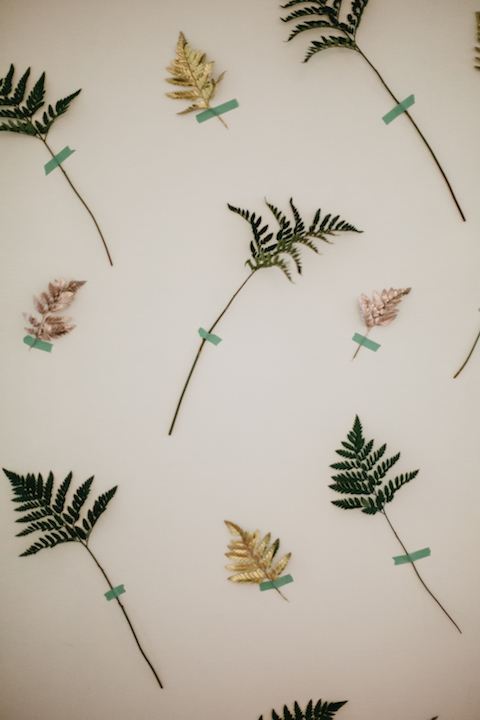 Playlist, below! 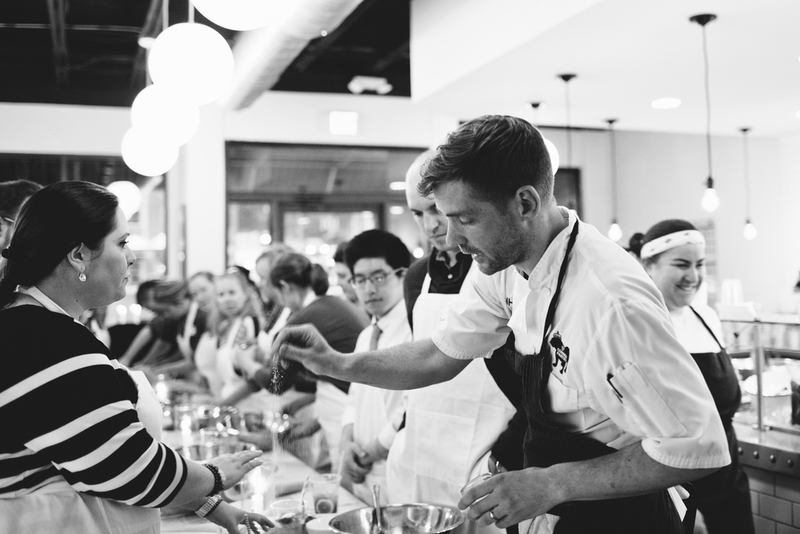 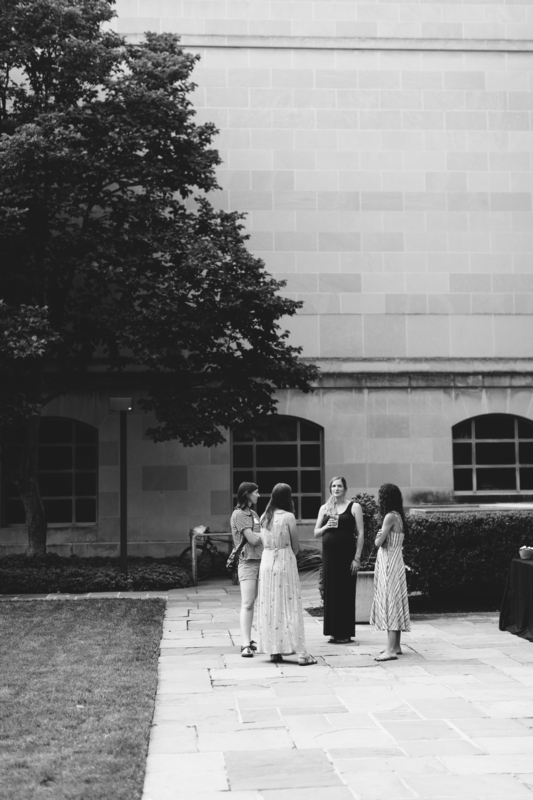 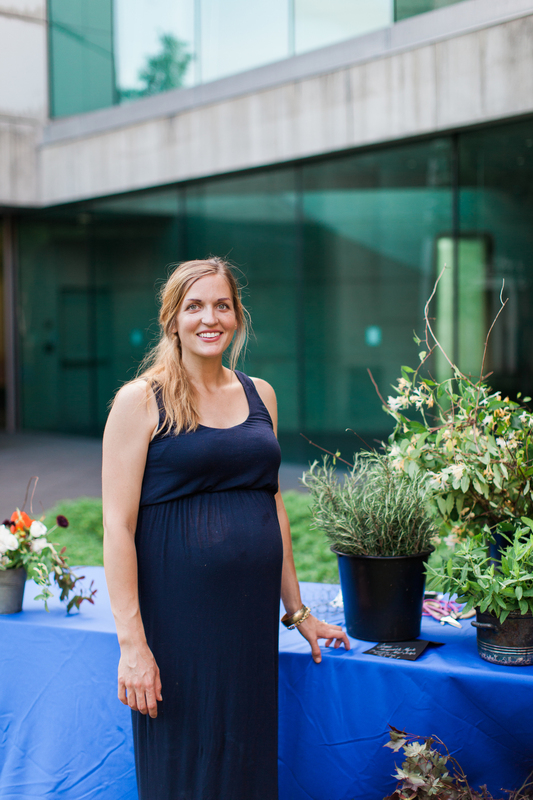 A spring- and soap-centric event at the BMA in April meant that the evening was awash with sweet smells and fresh greens. 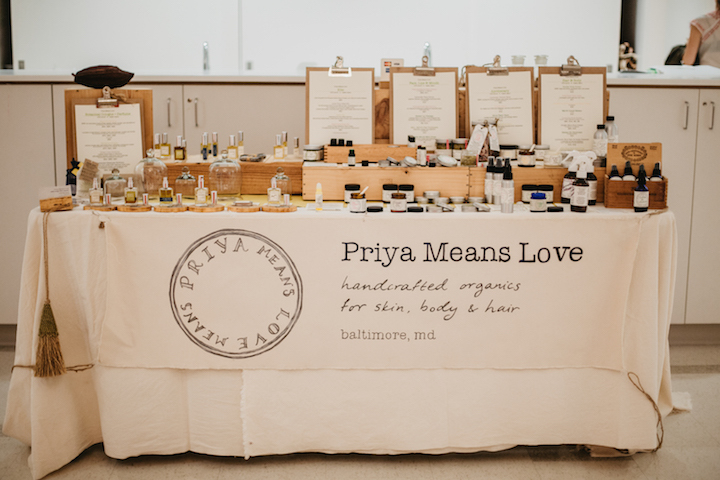 Priya Means Love taught us the age-old skill of soapmaking using a mix of cold process and rebatching techniques. 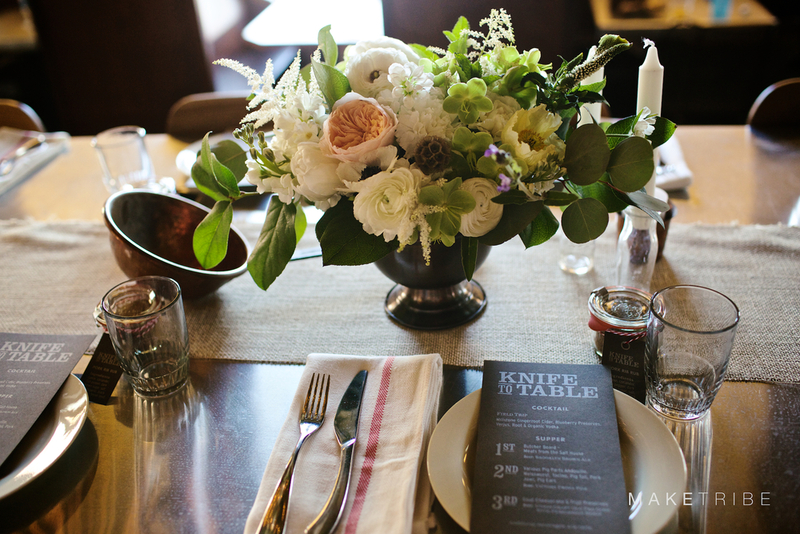 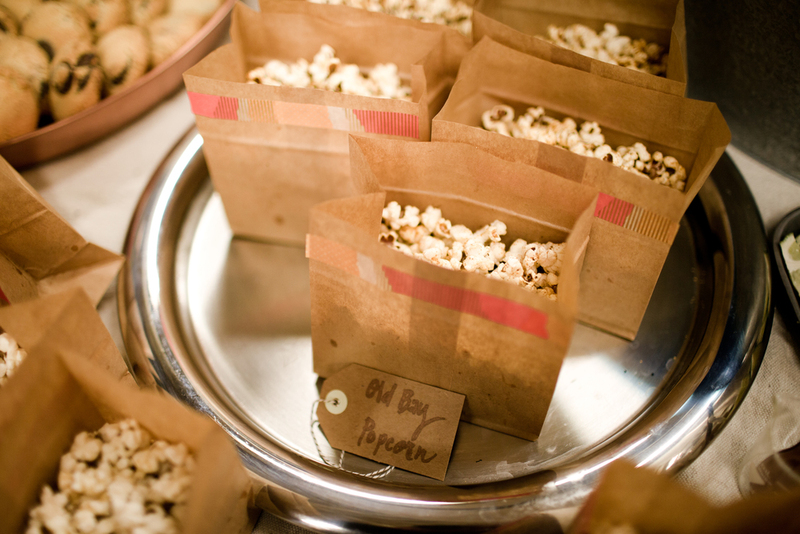 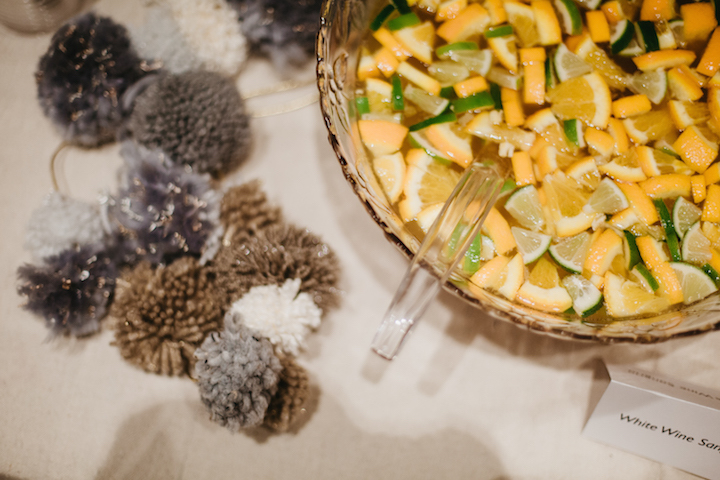 The Corner Pantry provided the snacks, Steelcut Flower Co. brought the blooms, and Gertrude's kept the punch bowls full. 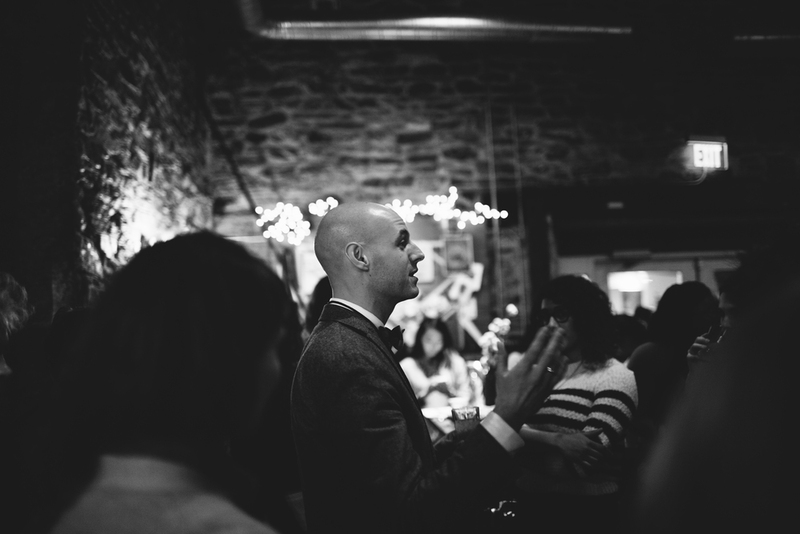 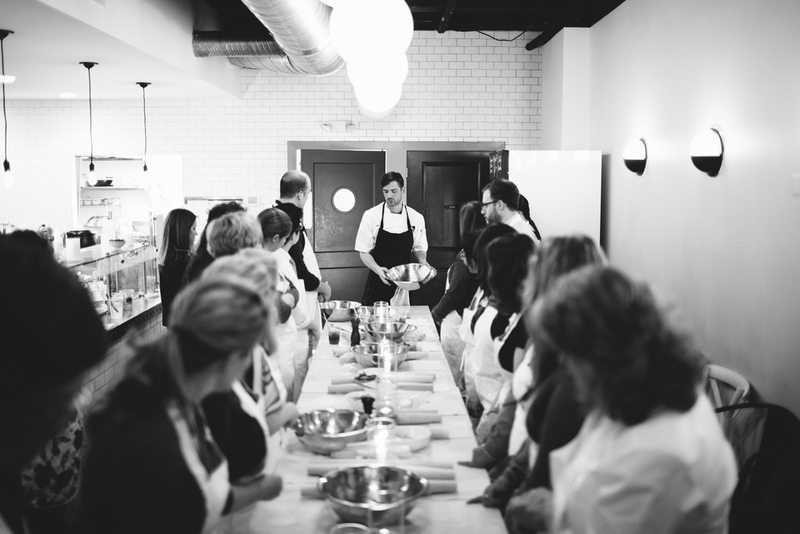 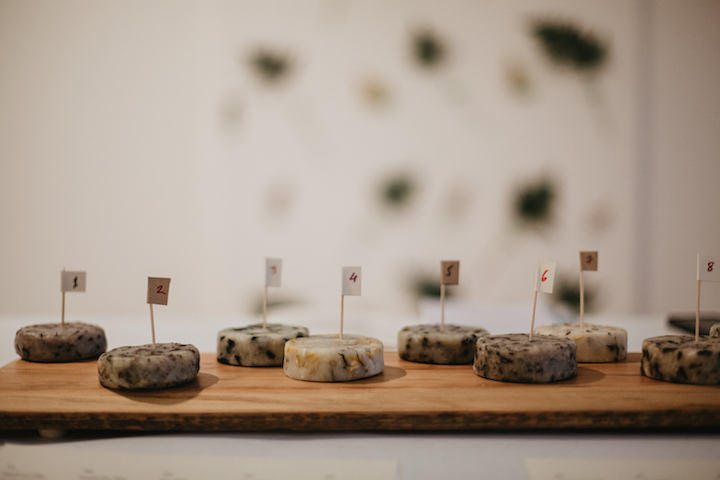 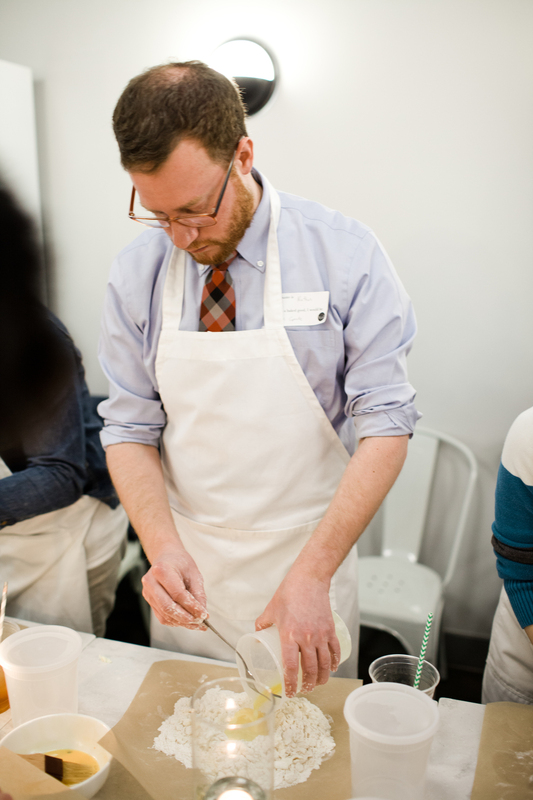 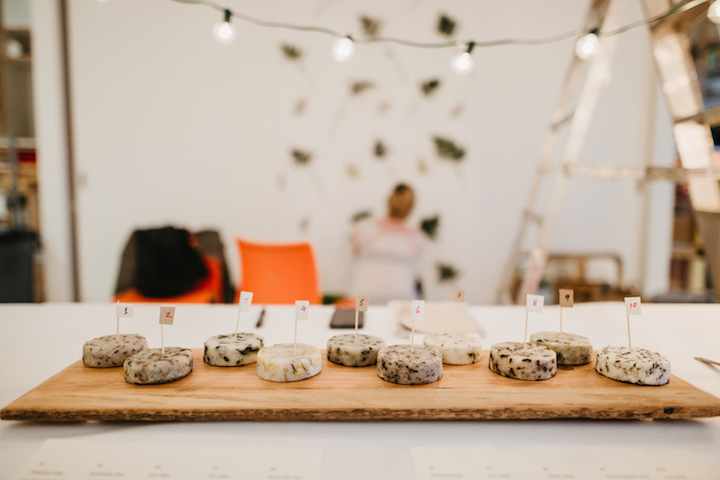 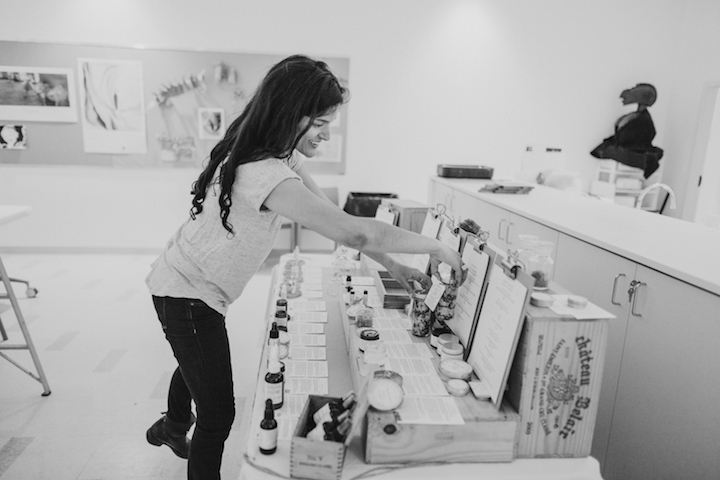 Guests were up to their elbows in herbs, oils and clays in the quest for the perfect custom soap blend. 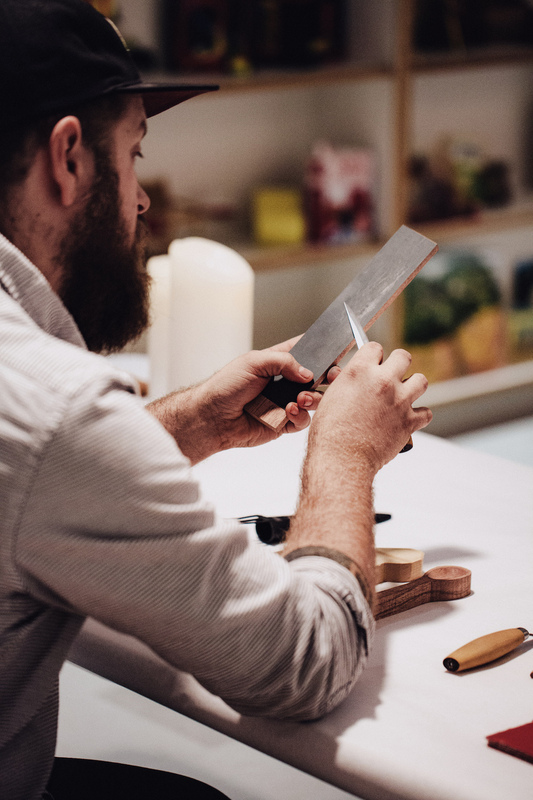 What better way to spend a February weekday evening than with a block of wood and a carving knife? 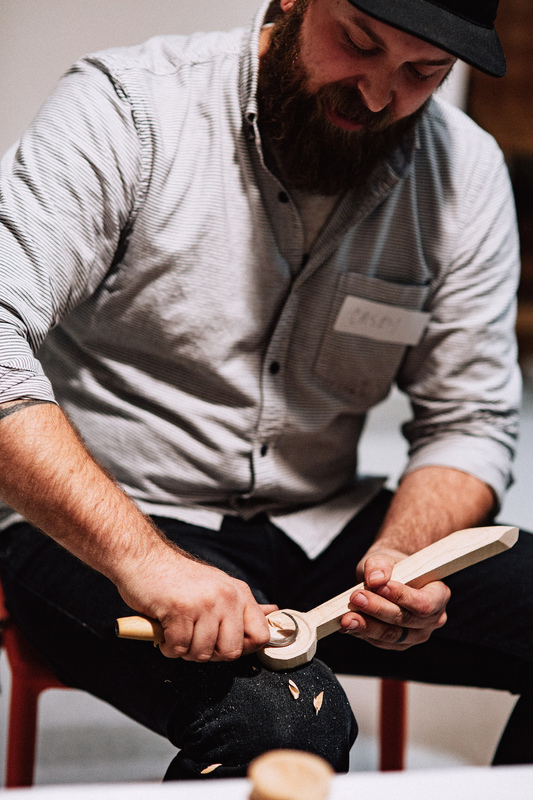 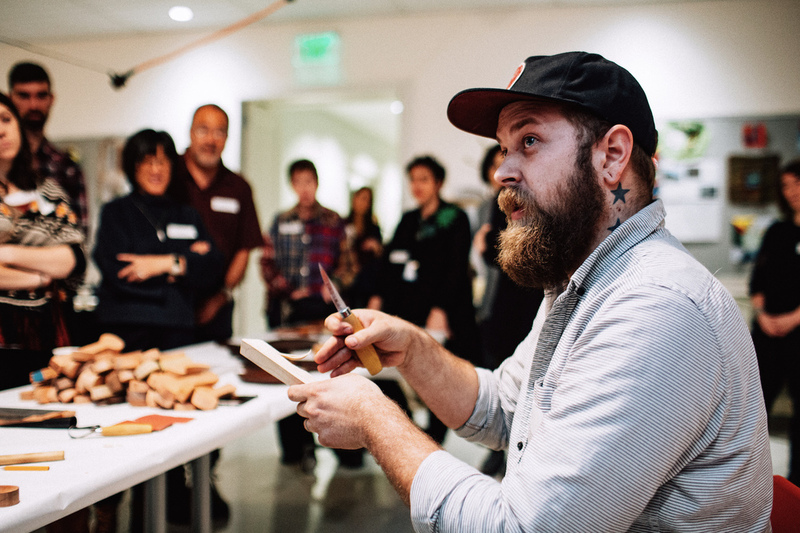 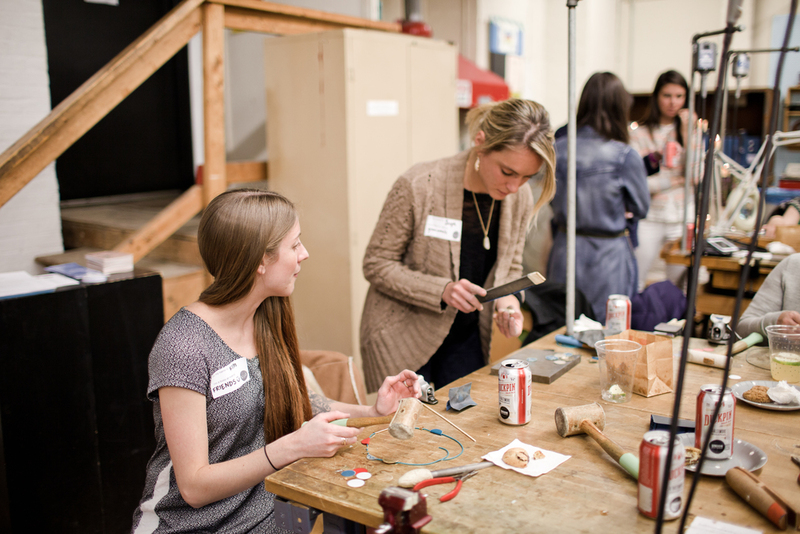 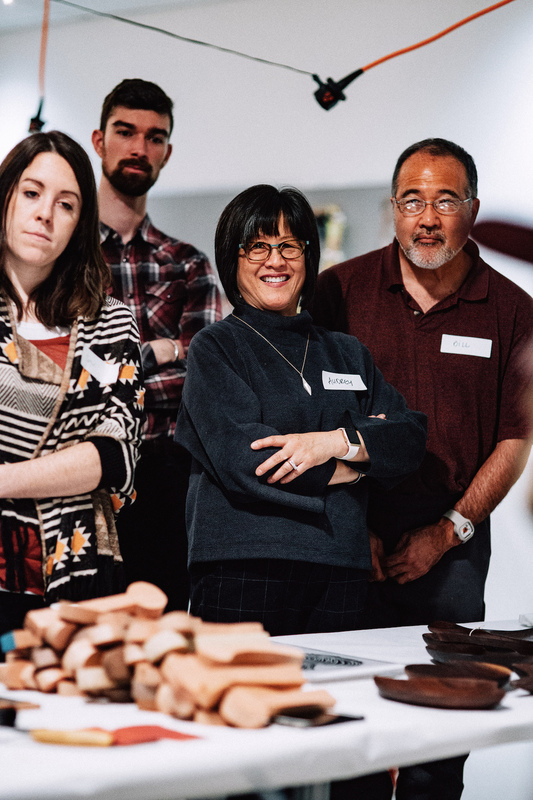 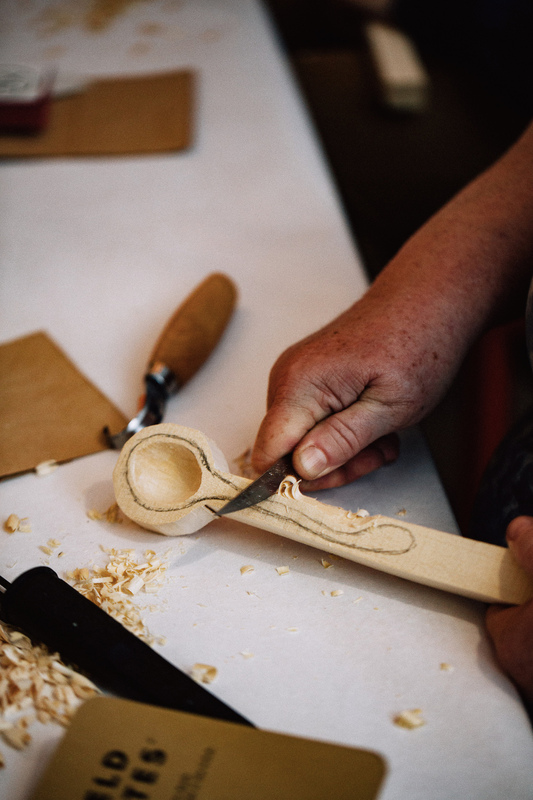 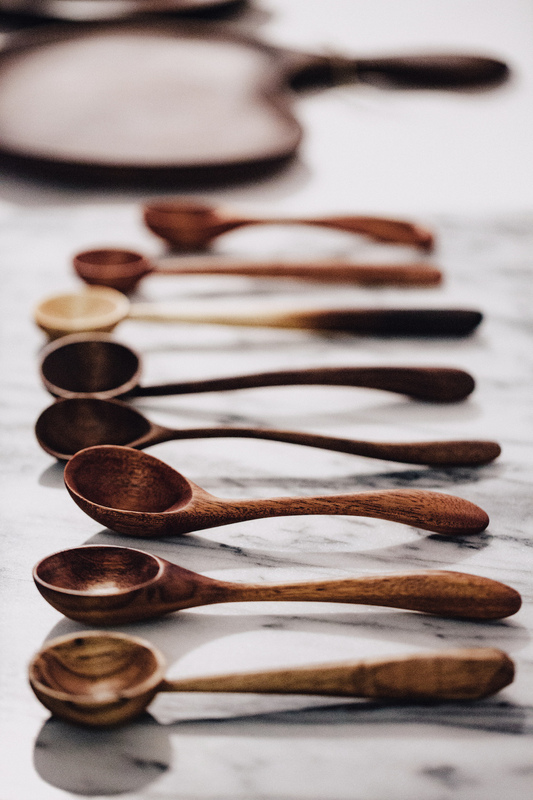 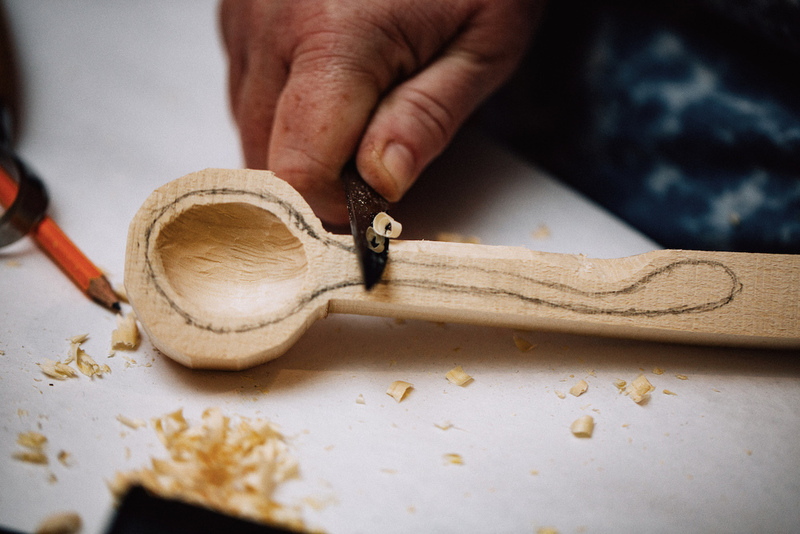 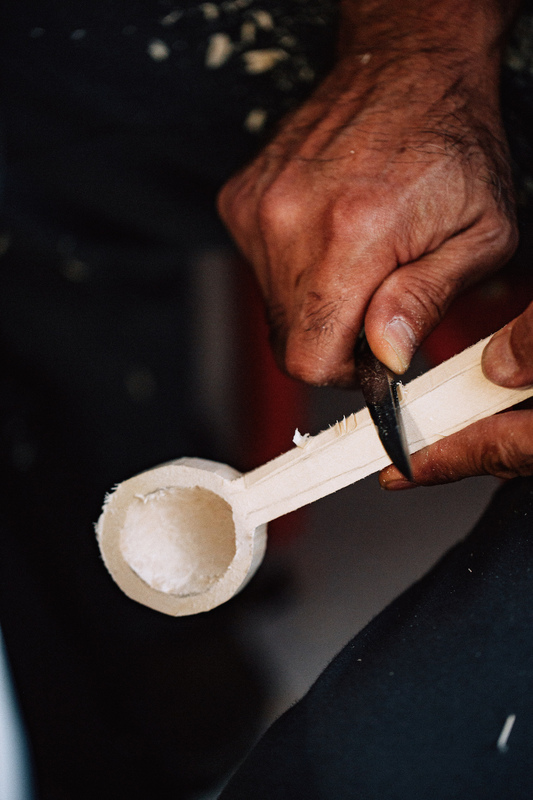 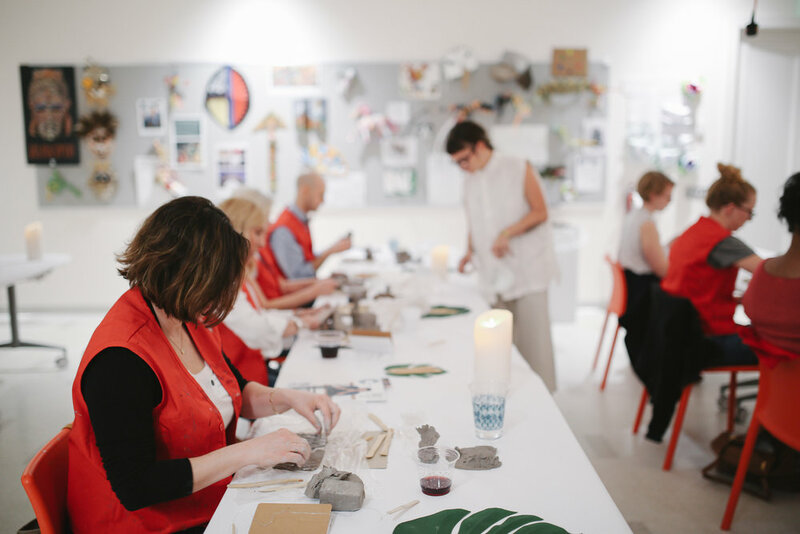 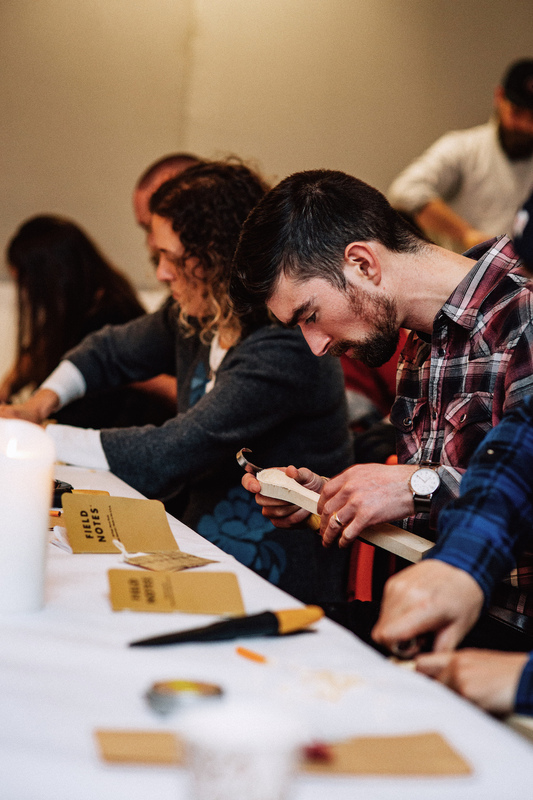 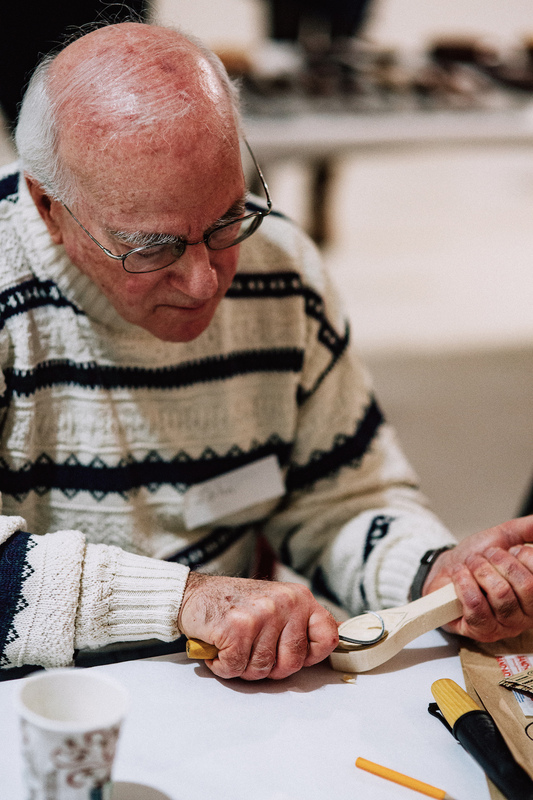 The fine folks of Foxwood Co. shared their expertise on wooden spoon carving at our event with the American Craft Council and the Baltimore Museum of Art. 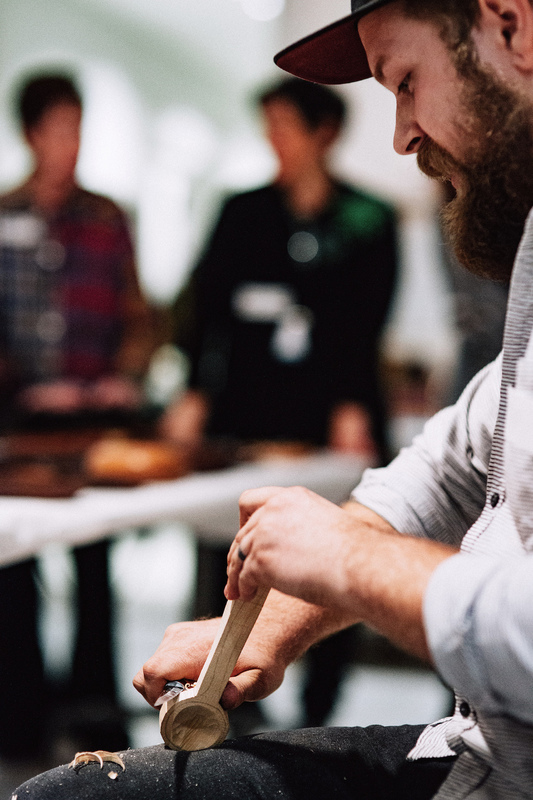 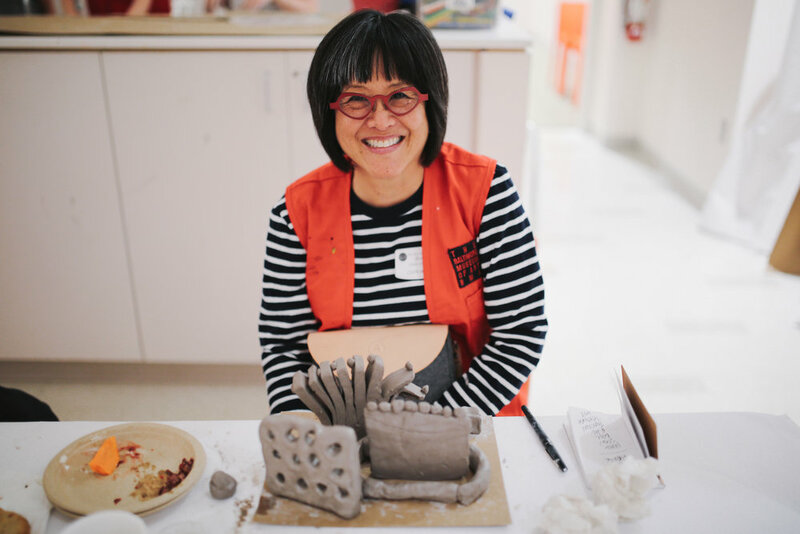 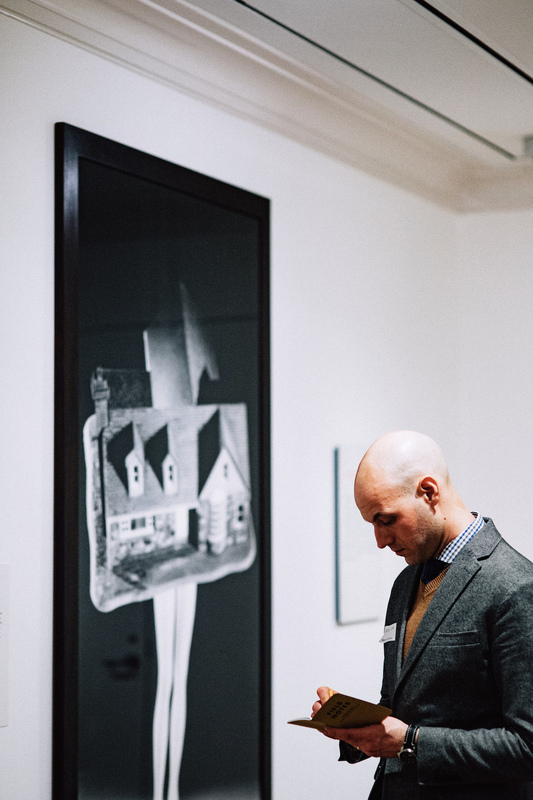 Guests got a behind-the-scenes glimpse into the Imagining Home exhibition, and sipped coffee and snacks while practicing their knife skills. 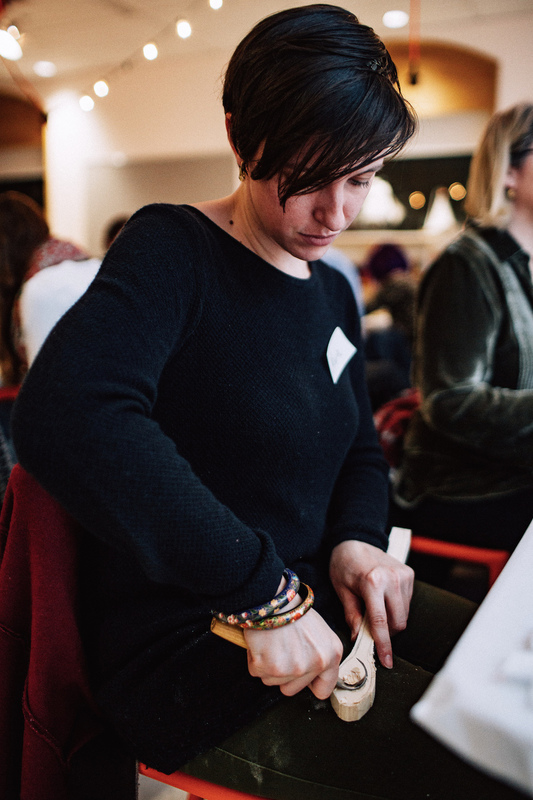 Calligraphy has been at the top of our dream workshop list forever, so it was a true treat to host a class with Emily Hein of Anchor Point Paper Co. We set up at Trohv with boozy hot cocoa and Kinderhook Snacks on a blustery January day and got right to work, practicing the ascending and descending strokes of each alphabet letter. 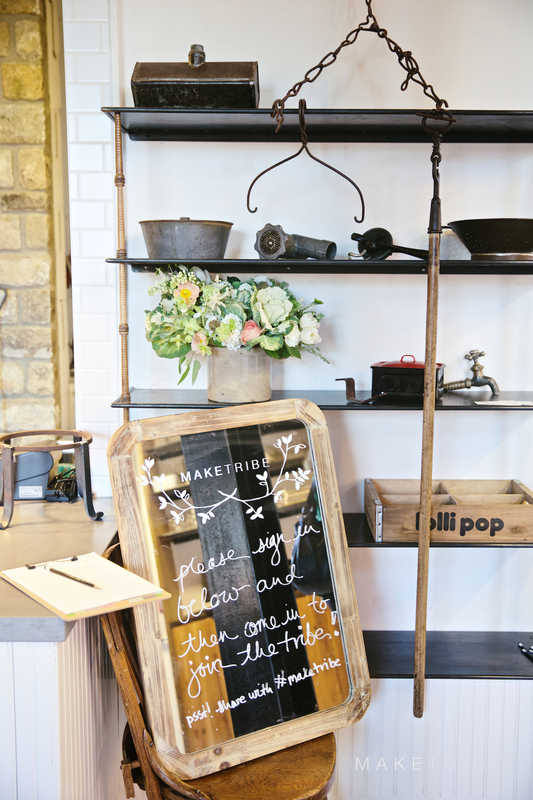 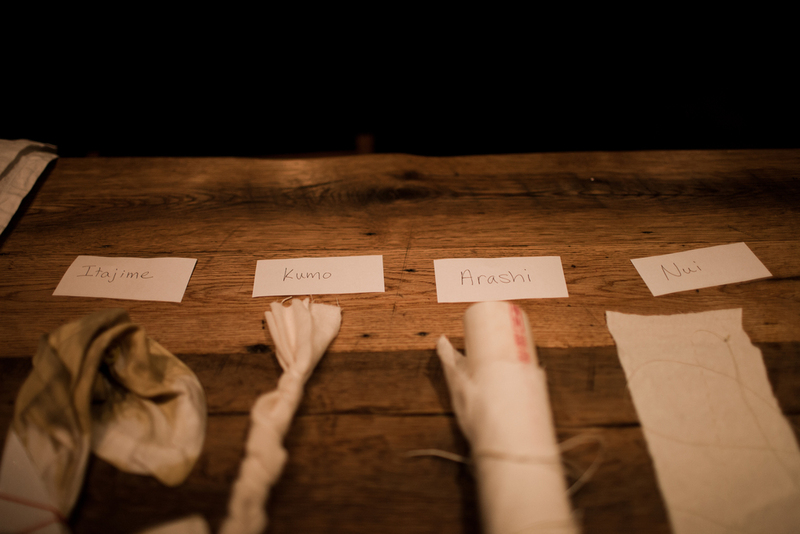 Guests left with their own nibs and ink and a new understanding of how to master the swash. 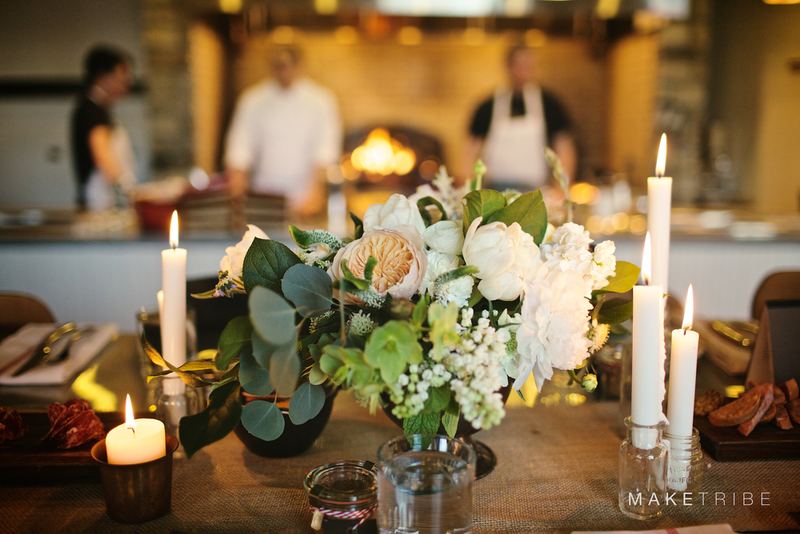 Photos by Horace and Mae Photography. 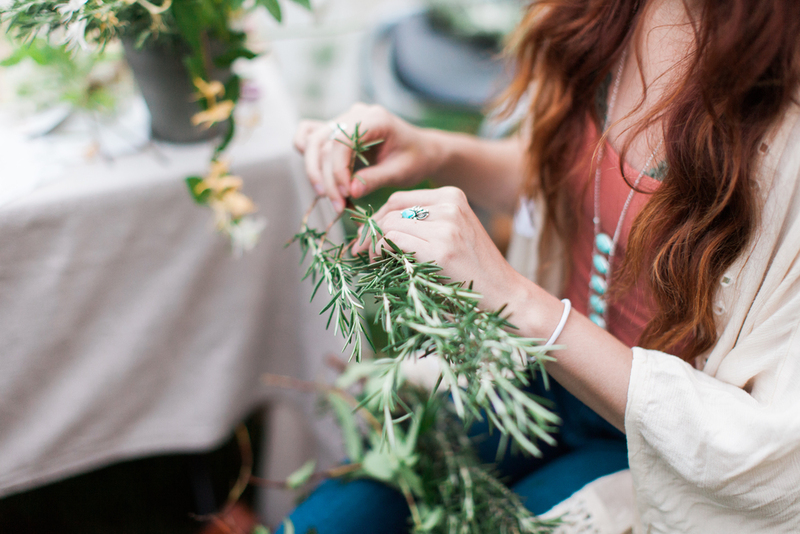 Herbal medicine has a certain magic to it. 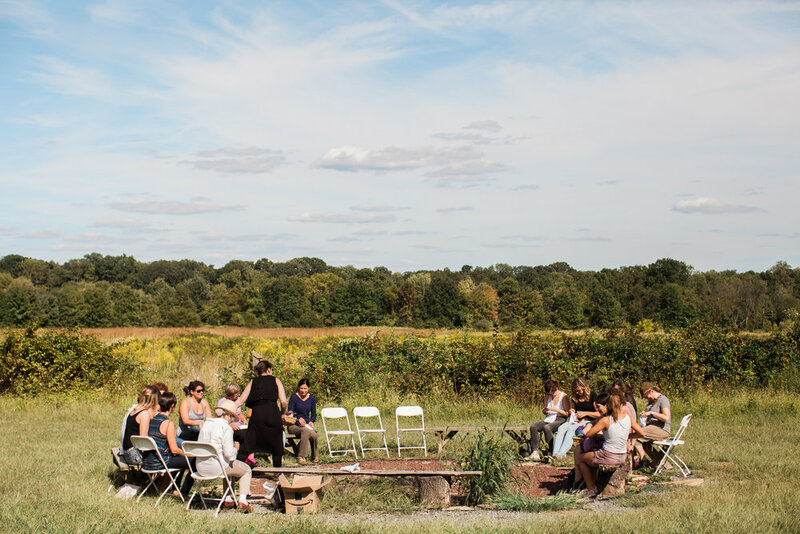 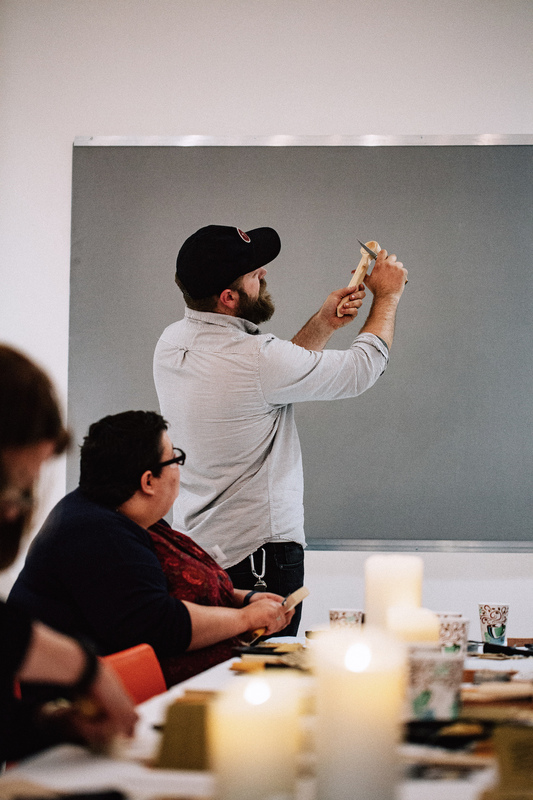 And that's why Jess Schreibstein (aka The Kitchen Witch) was the perfect fit to lead this workshop on making fire cider and black elderberry syrup. 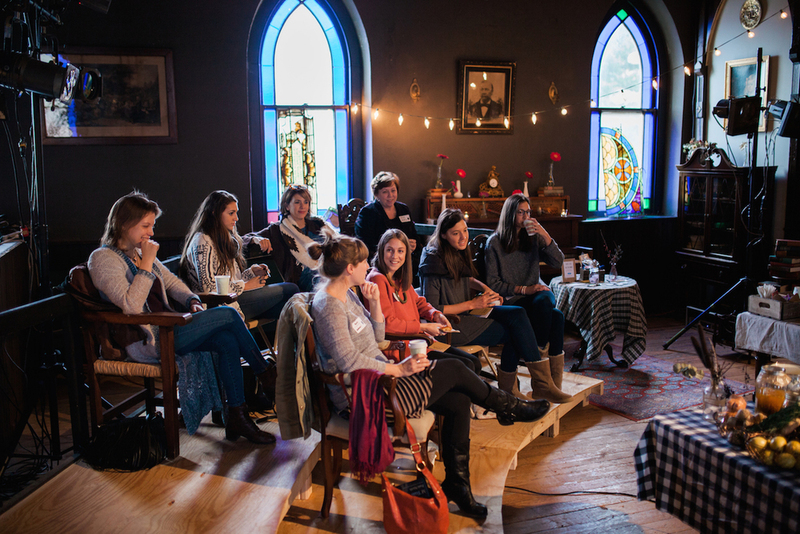 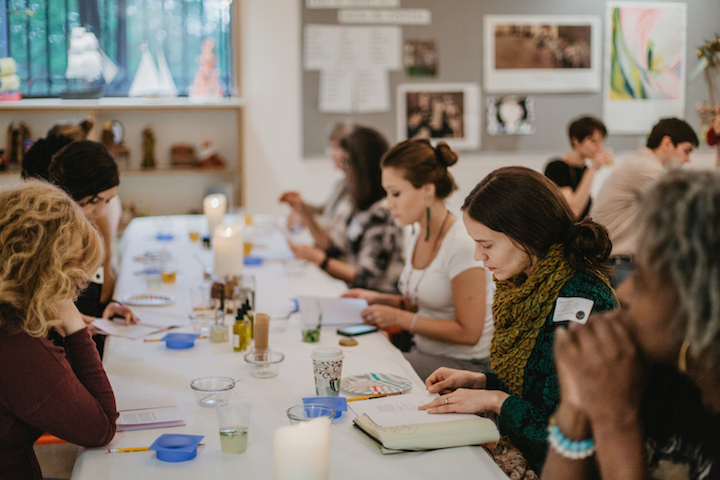 Guests took copious notes on herbalism basics, kept winter chills at bay with Artifact Coffee's finest brews (and donuts), and got to work on making medicine magic, all under the gorgeous roof at Church & Company. 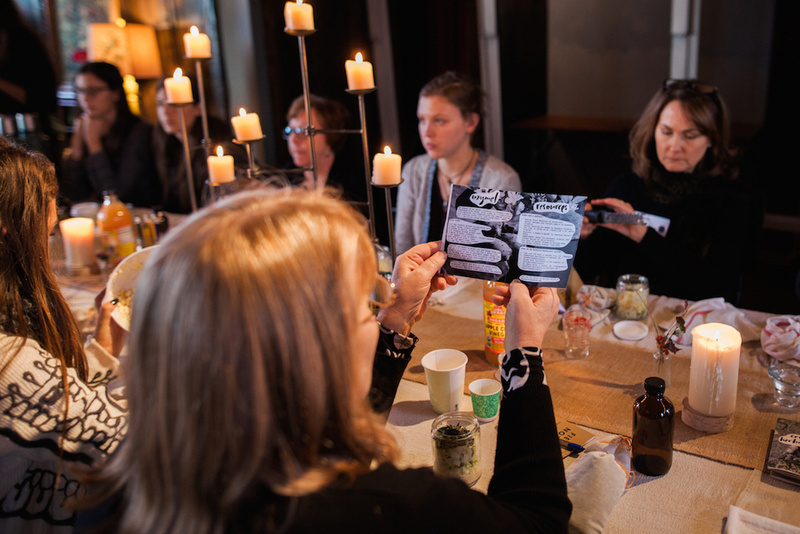 Stream the witchin' event playlist here. 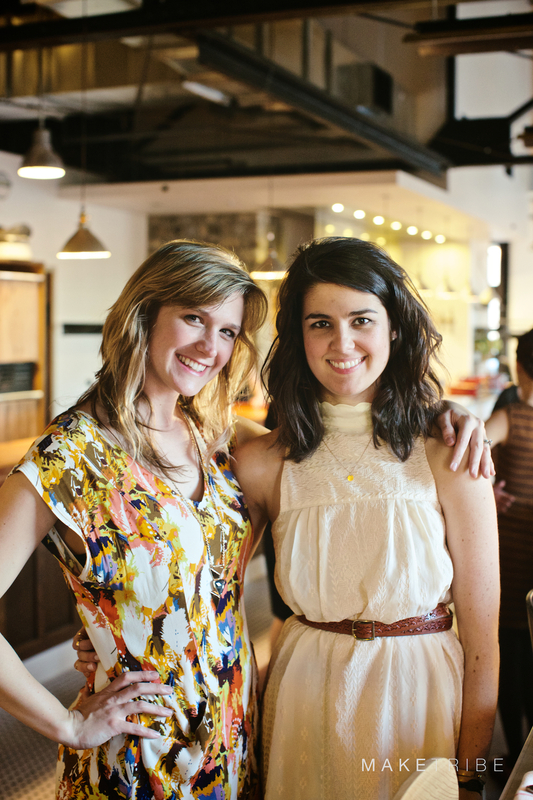 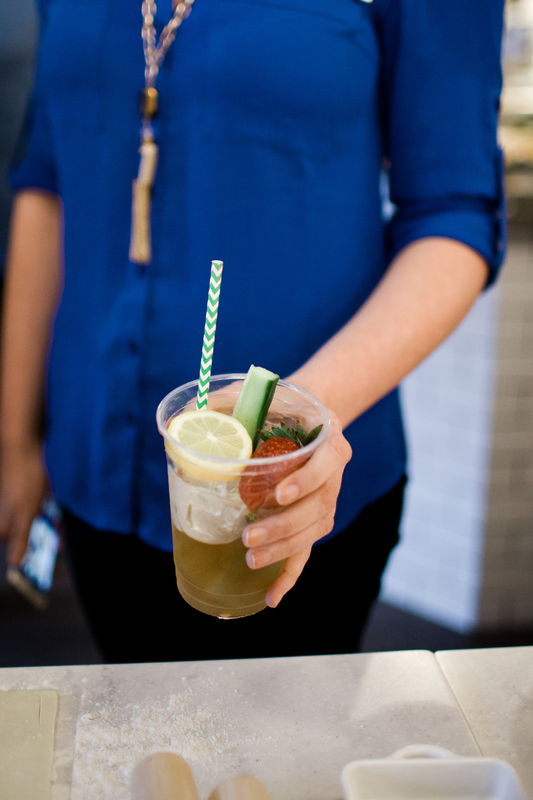 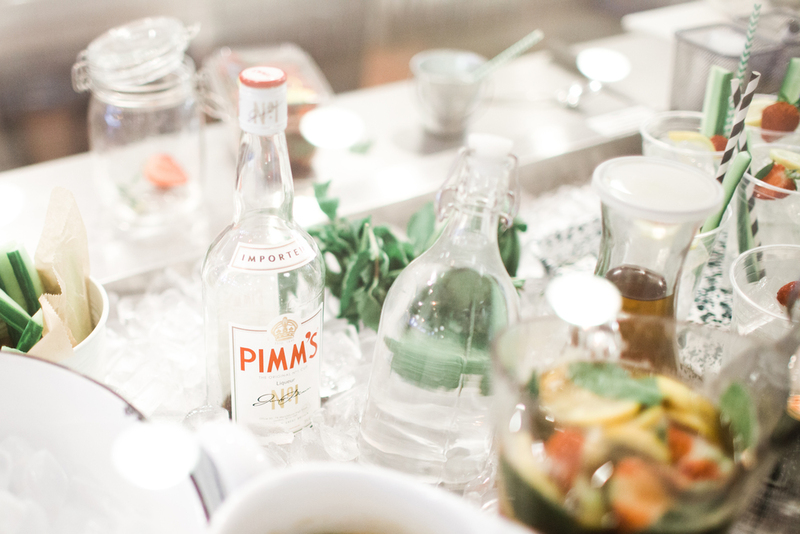 For our British Baking event, Emily and Neill Howell of The Corner Pantry welcomed us with Pimm's Cups at the ready. 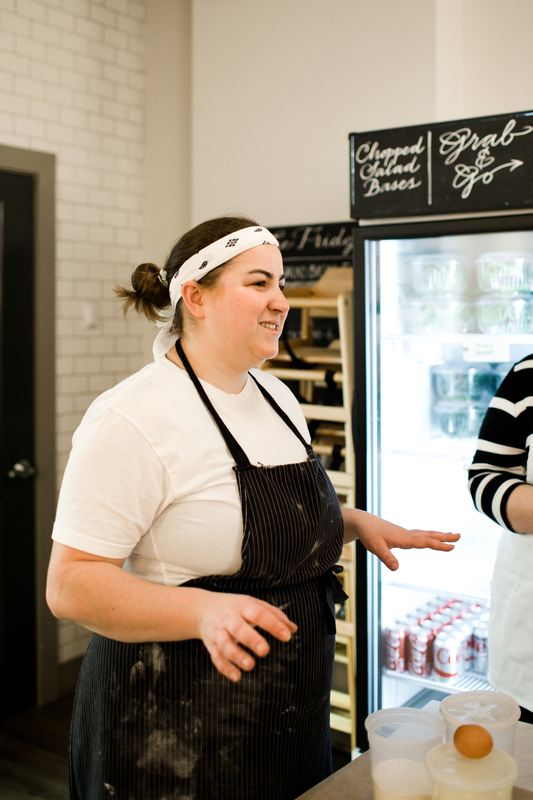 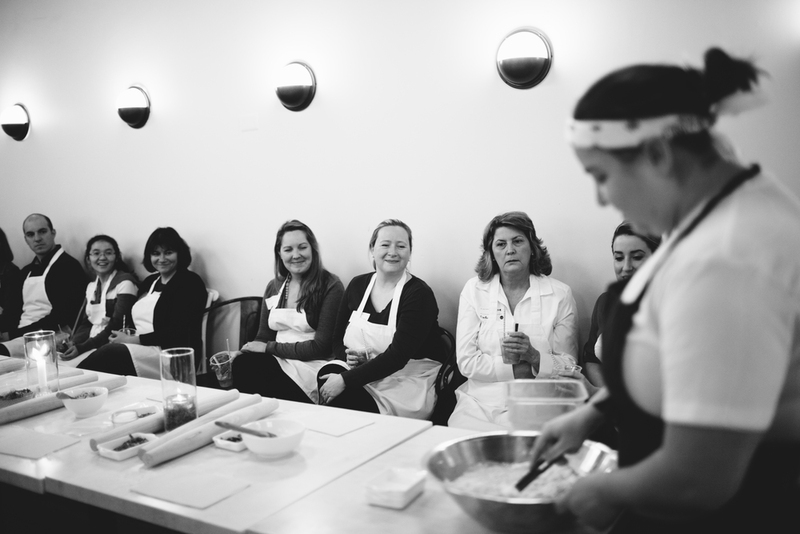 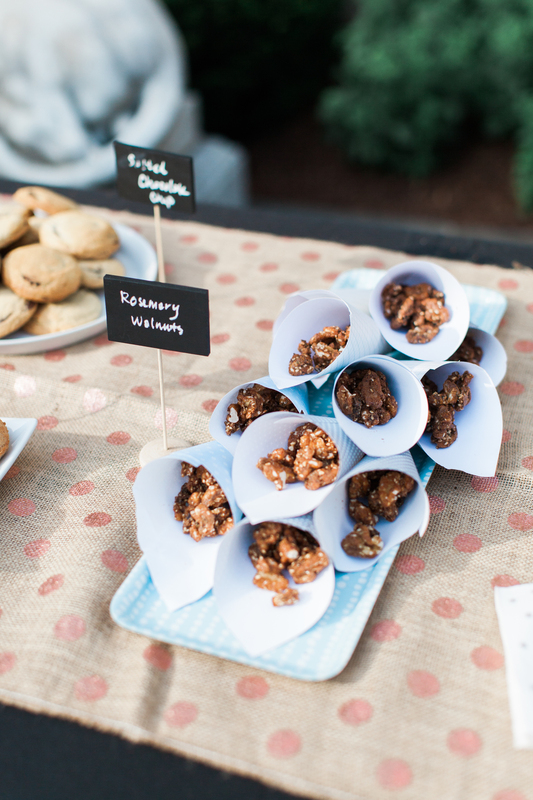 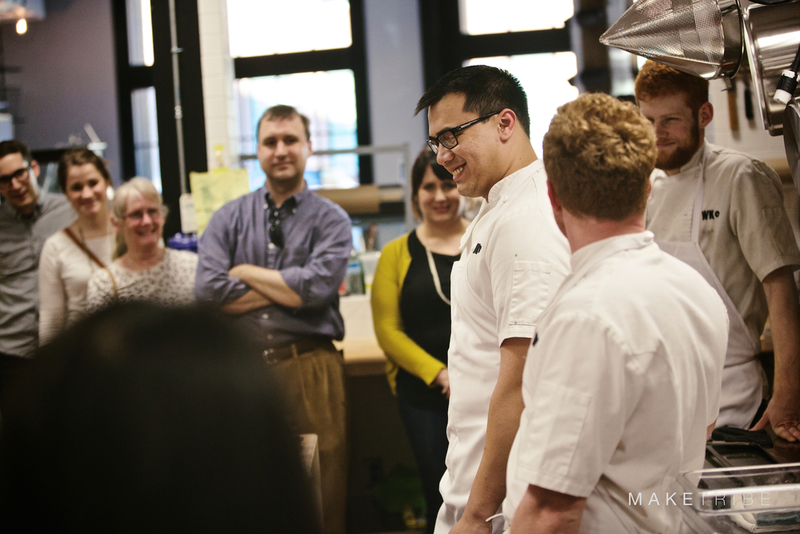 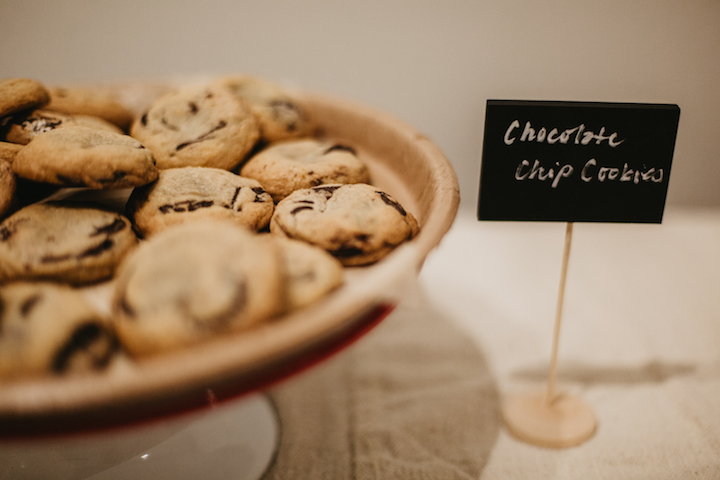 After a bit of mingling and munching, guests donned their aprons, rolled up their sleeves, and dove right into a mound of dough. 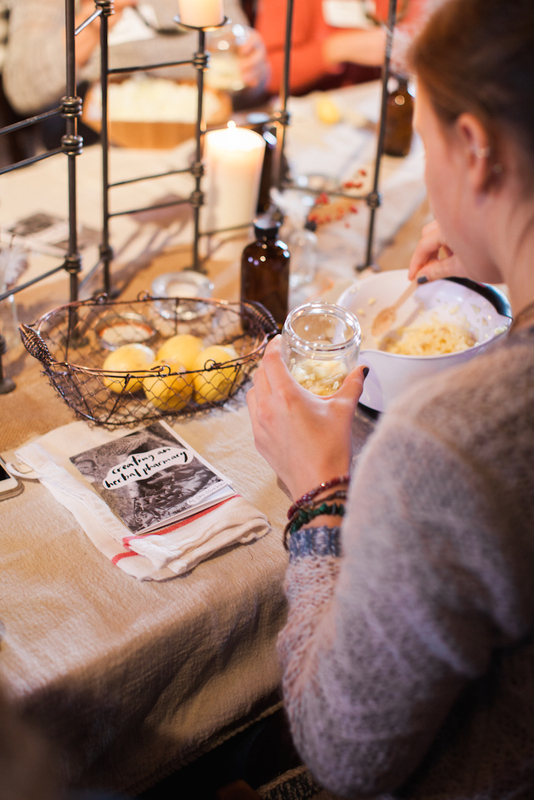 Crumpets were first on the list, then sausage rolls, followed by Cornish pasties. 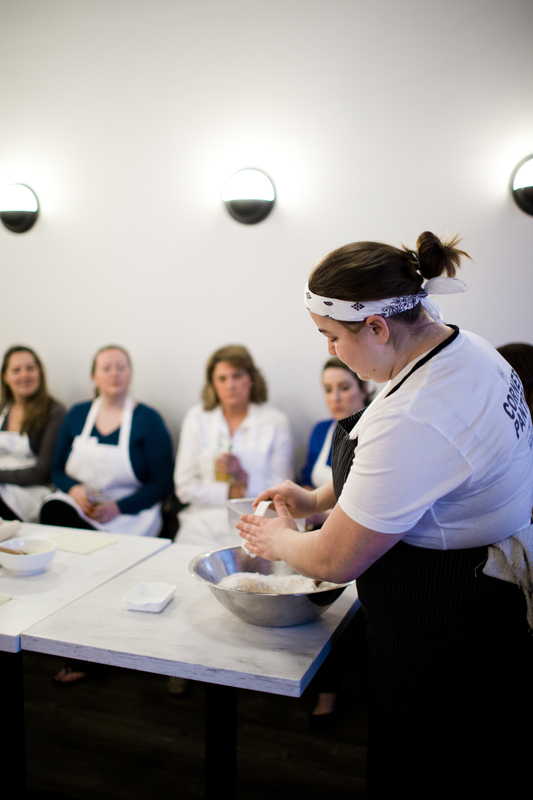 Resident pastry chef Julie Sutula helped lead the rolling and flouring, and the oven-baked final products both smelled and tasted nothing short of delicious. 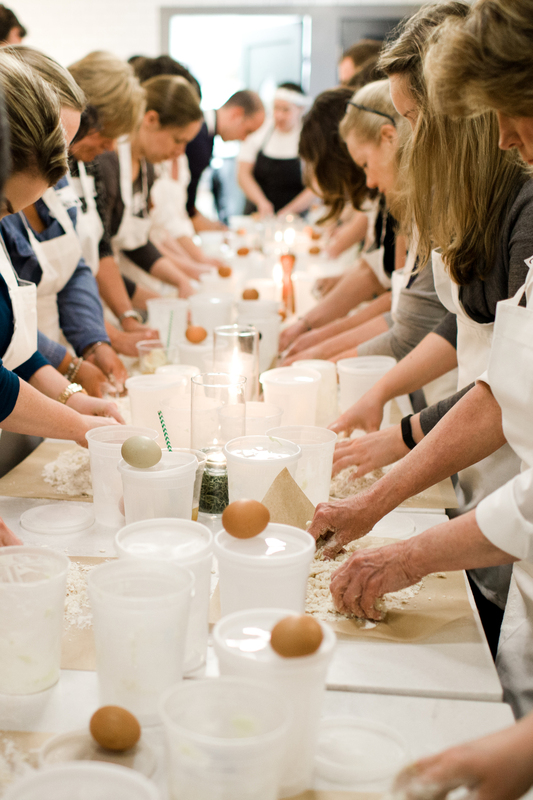 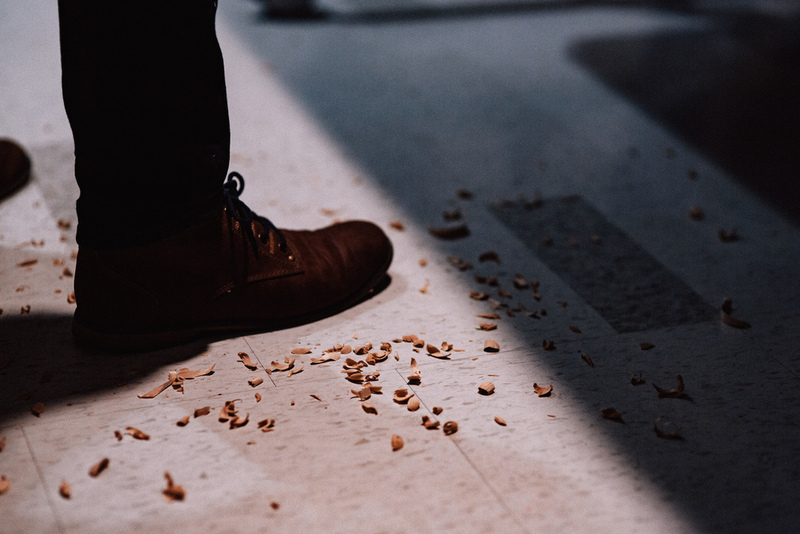 If we learned one thing from this event, it's not to be scared of salt--or butter. 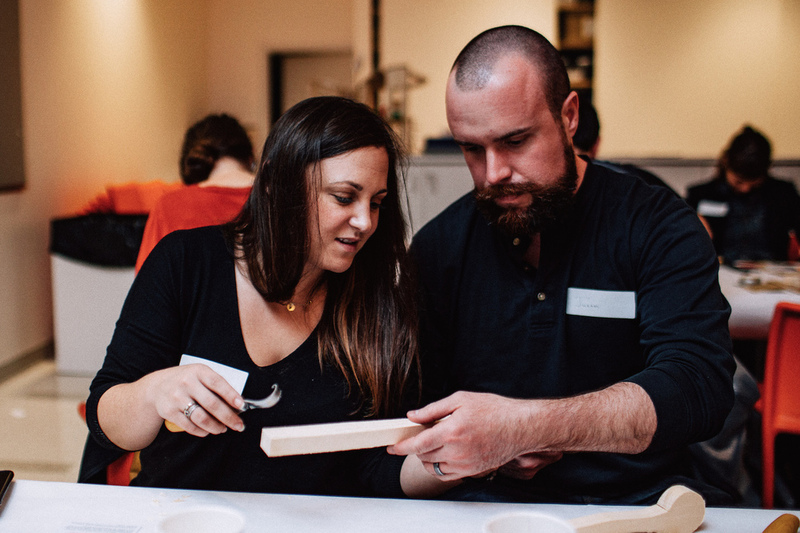 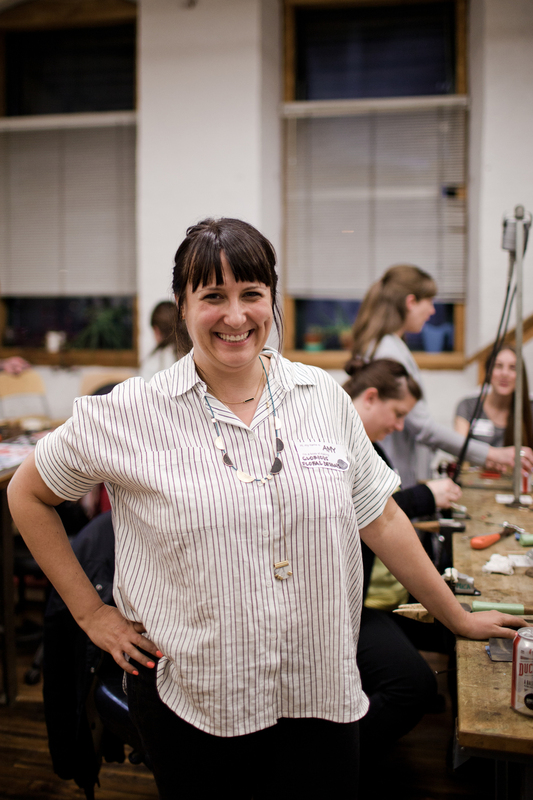 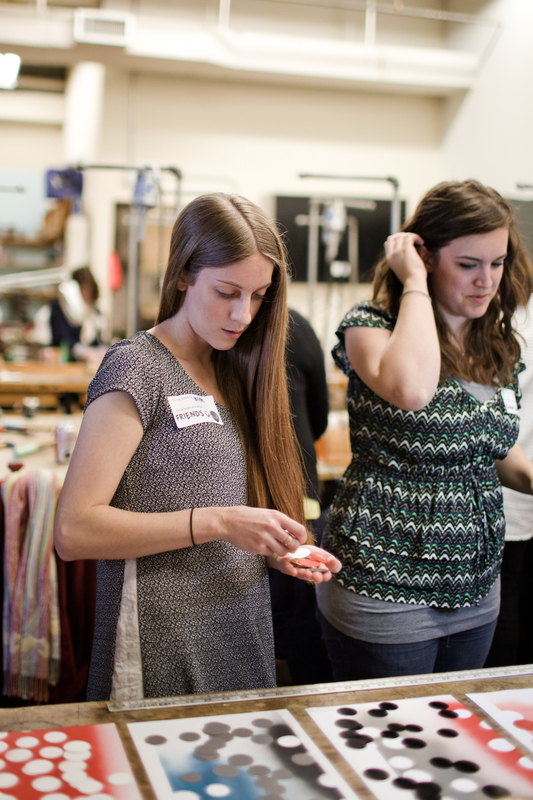 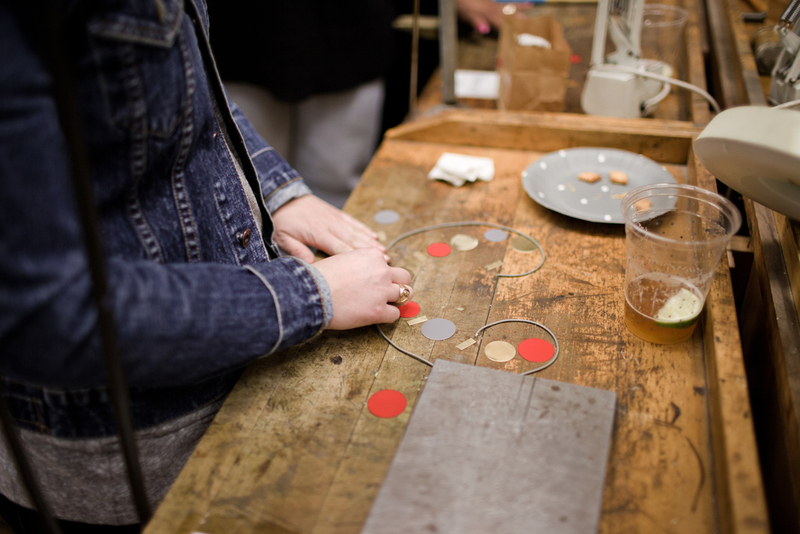 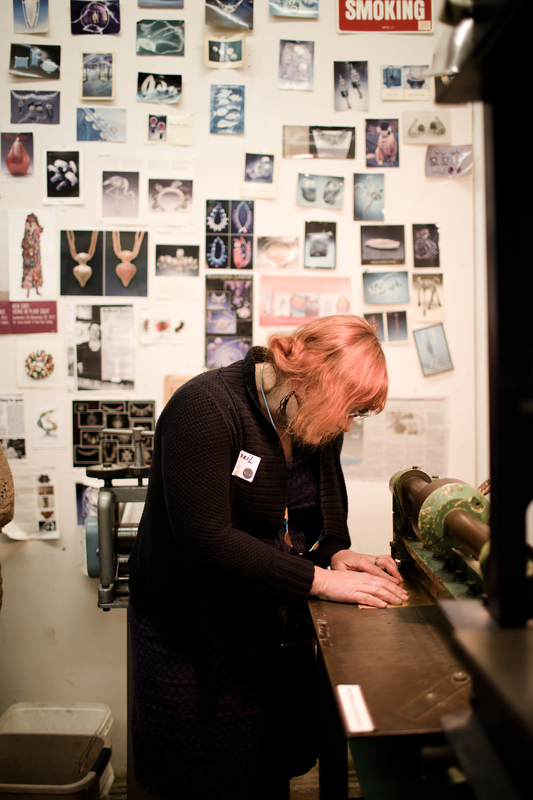 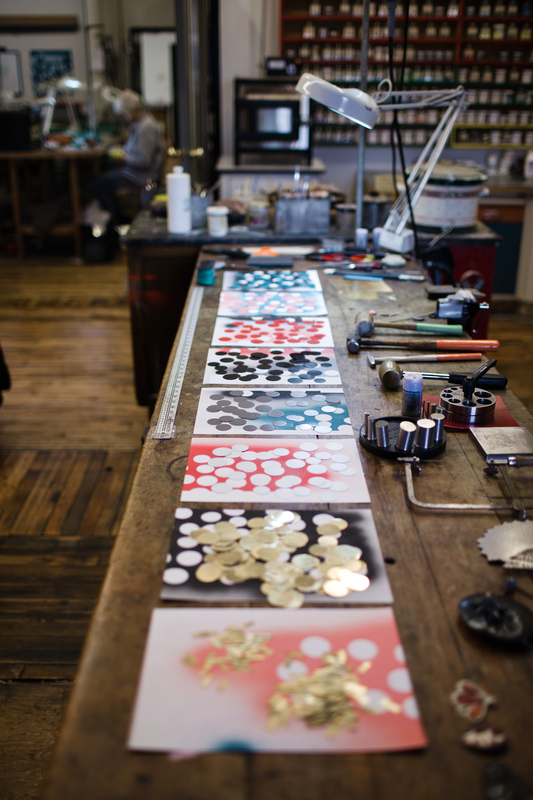 We gathered at the Baltimore Jewelry Center studio to learn the finer points of necklace making, which, weirdly enough, occasionally involves very large hammers. 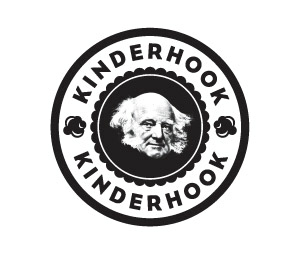 April and Shane led us on a tour of the space while the gang munched on Kinderhook Snacks and sipped really good beer. 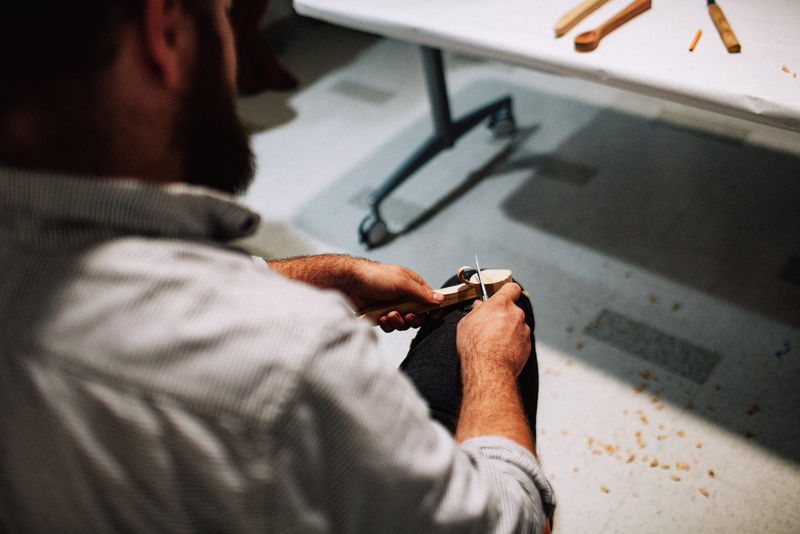 Brass paillettes and leather cording were the basis for our project, though everyone's final masterpiece looked completely and utterly different. 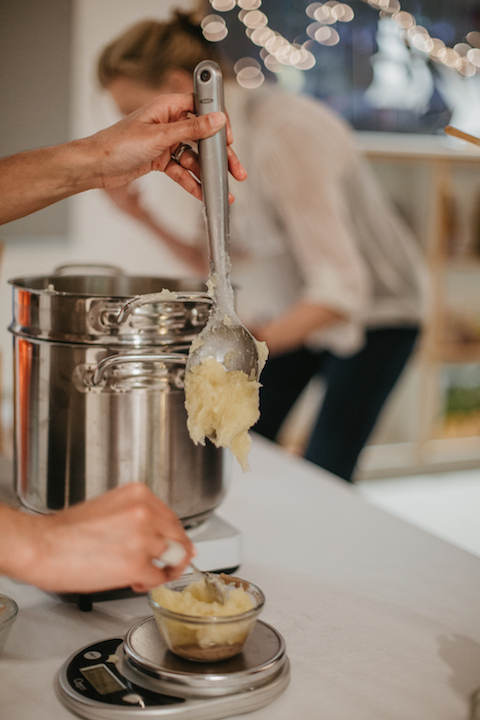 We love when that happens. 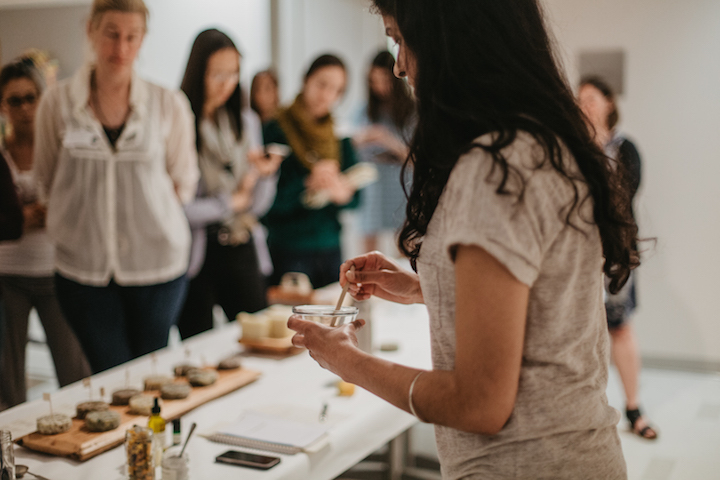 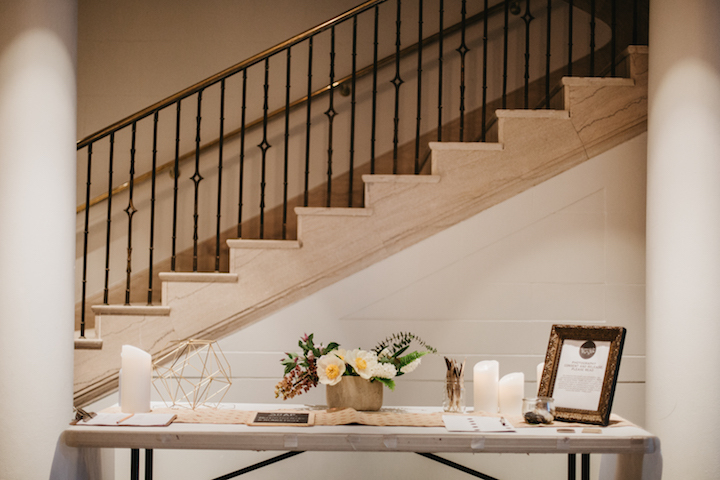 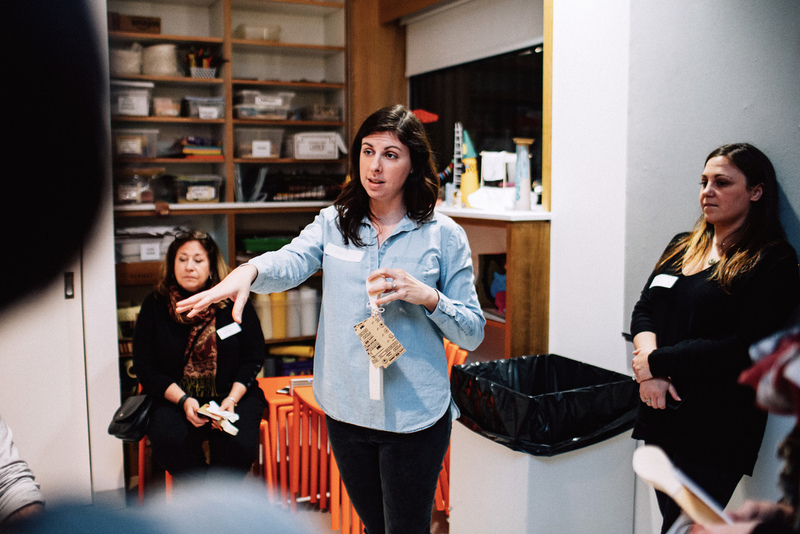 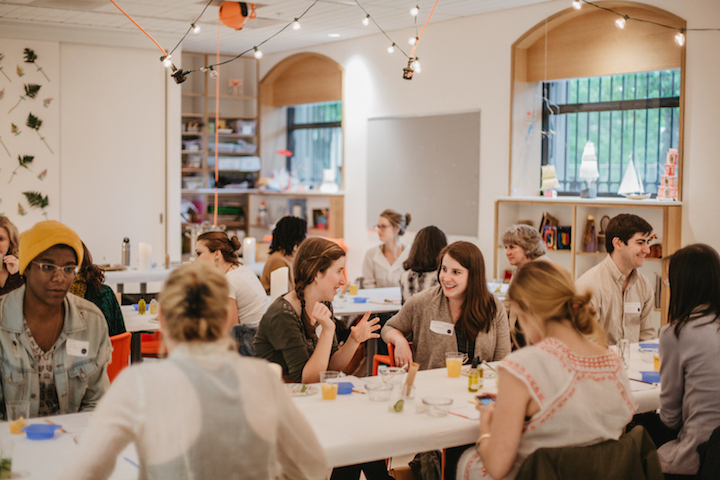 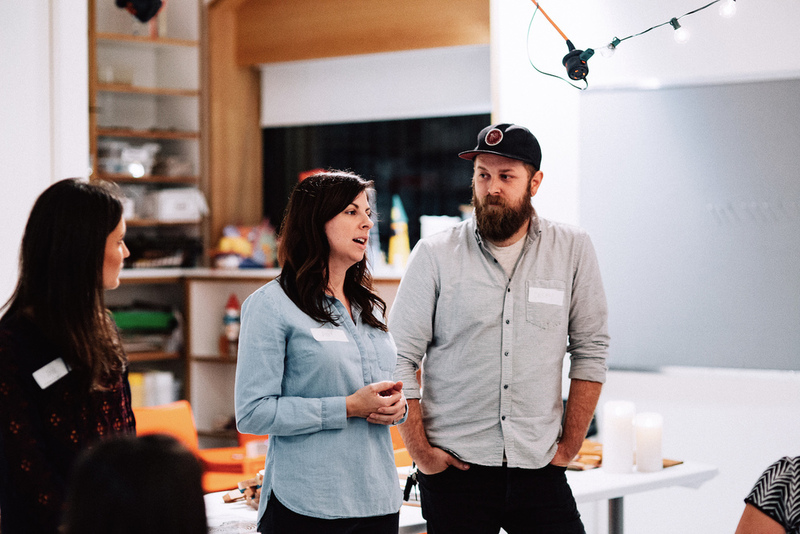 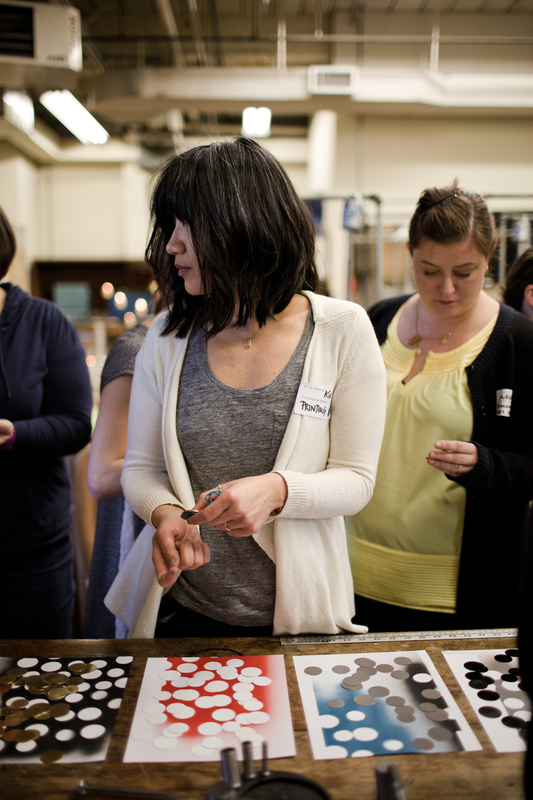 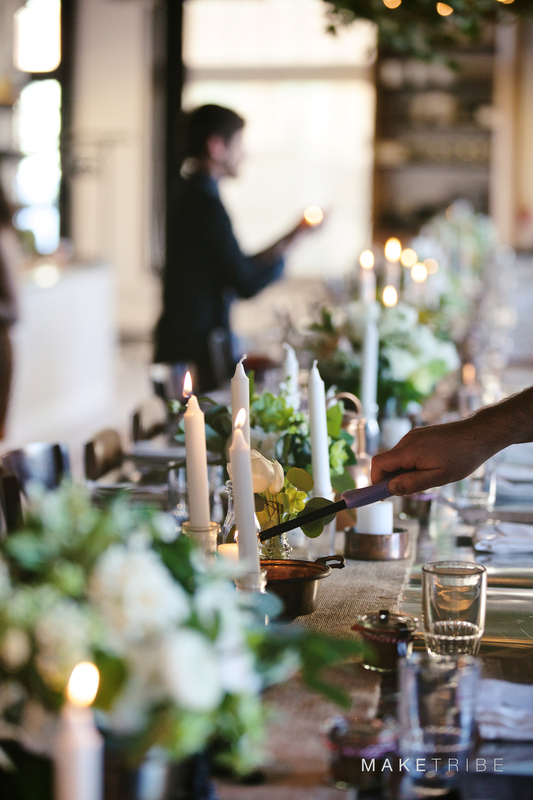 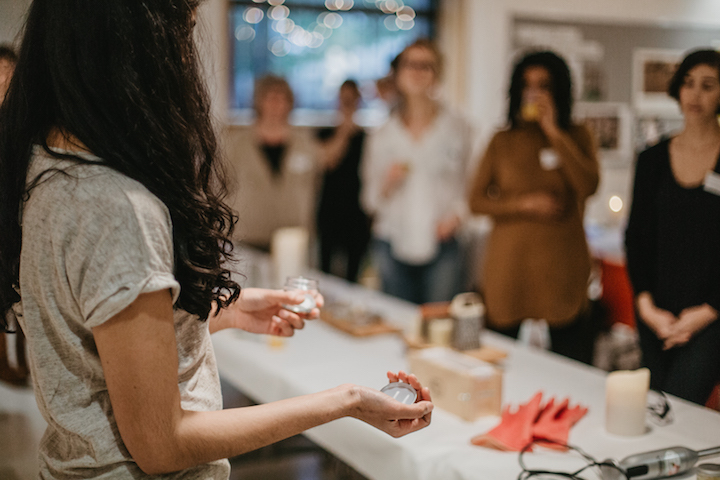 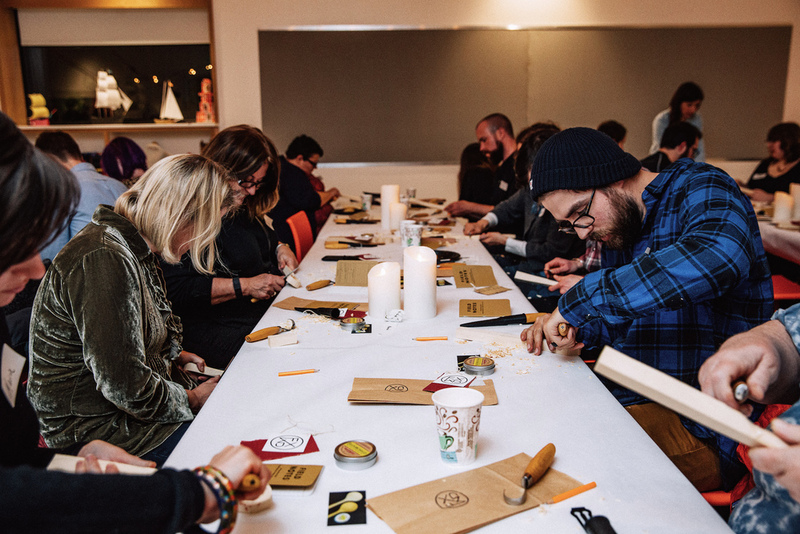 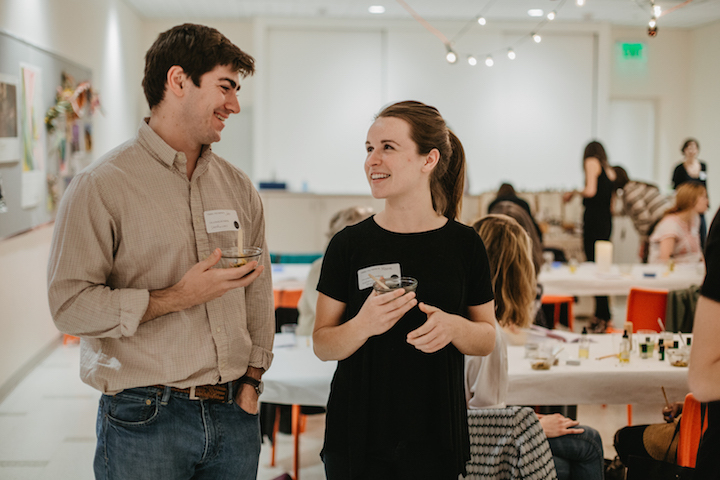 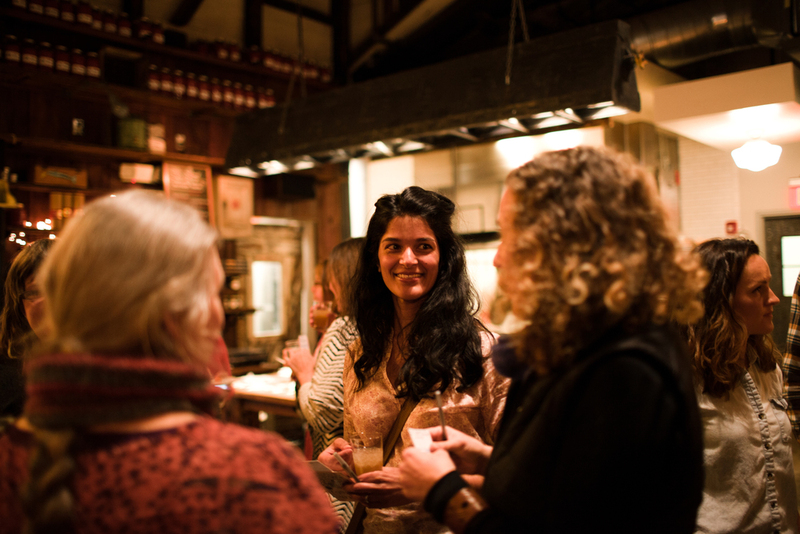 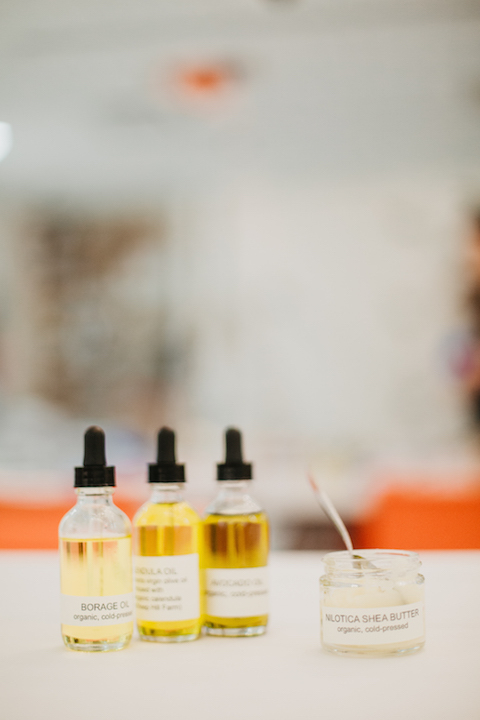 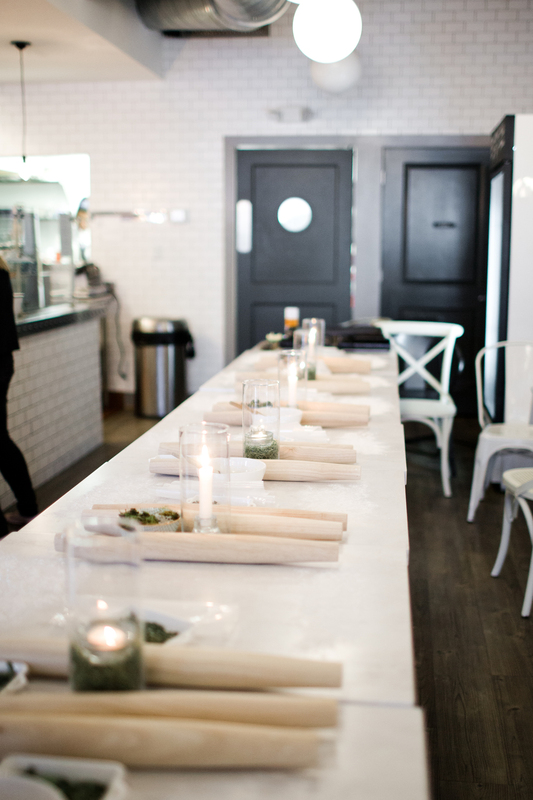 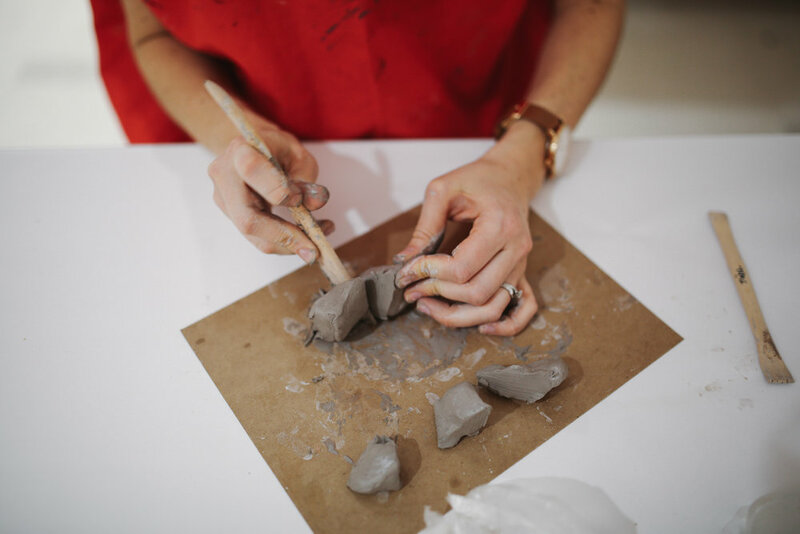 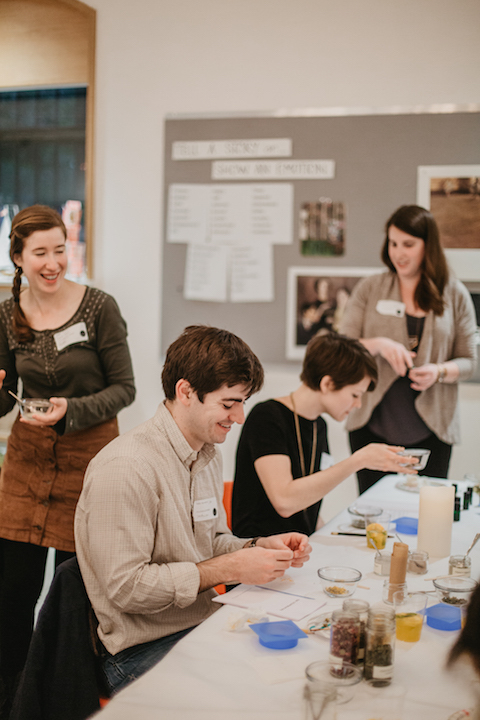 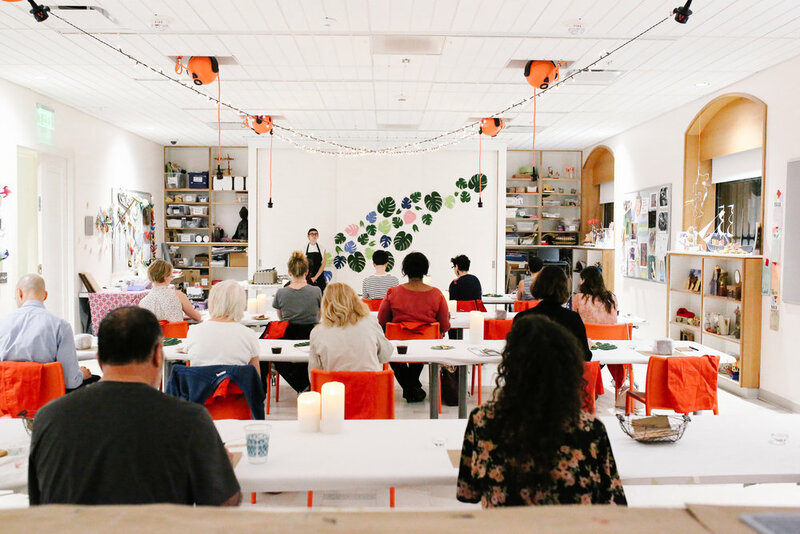 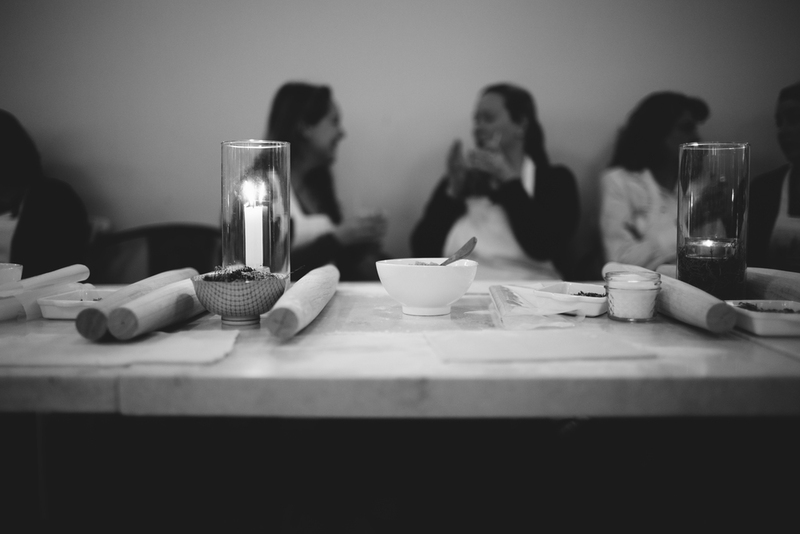 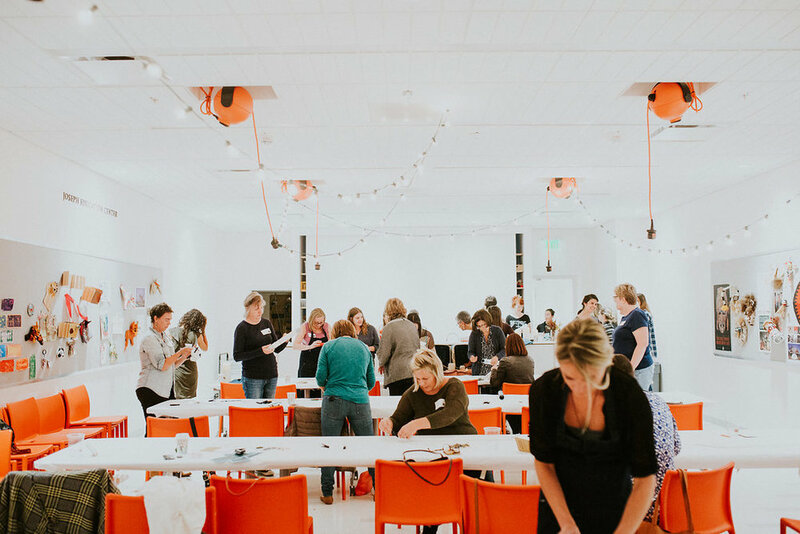 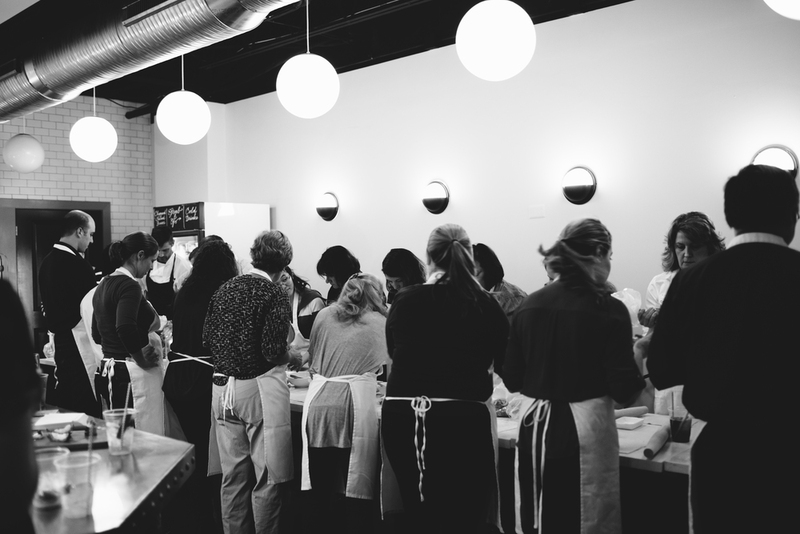 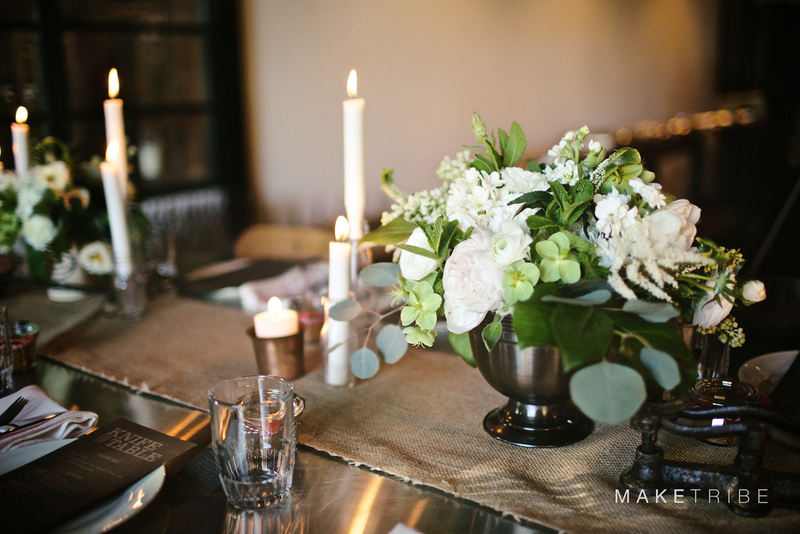 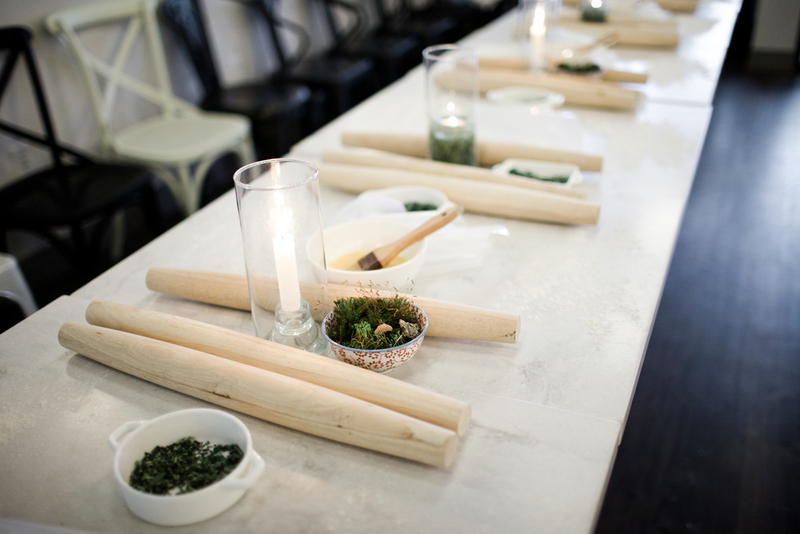 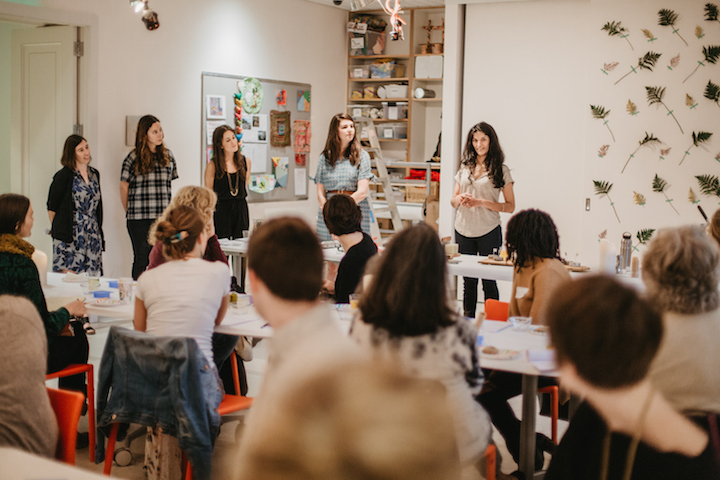 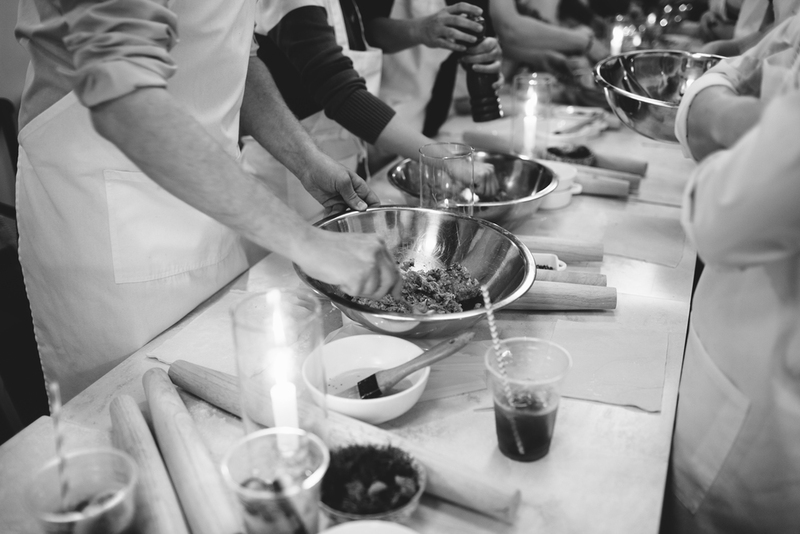 Our first event of 2015 was filled with all the things we love: a hands-on workshop, easy conversation, a thoughtful meal, plenty of wine, and lots of lingering in the soft glow of beeswax candlelight. 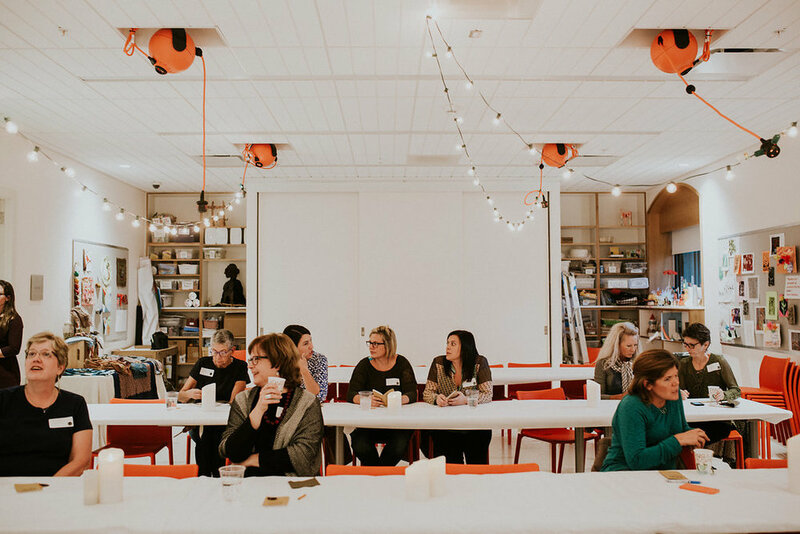 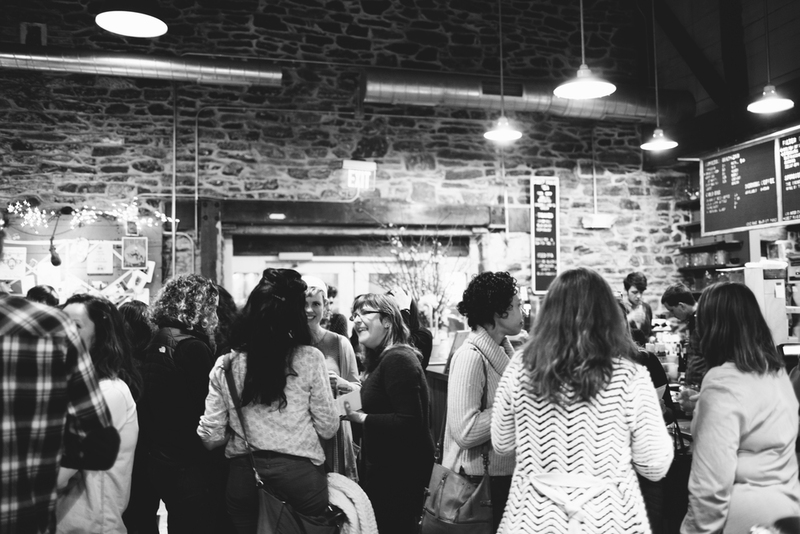 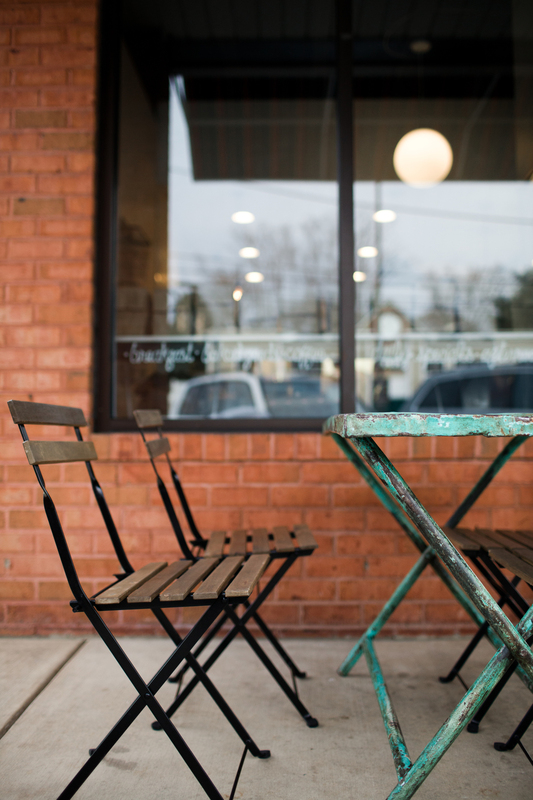 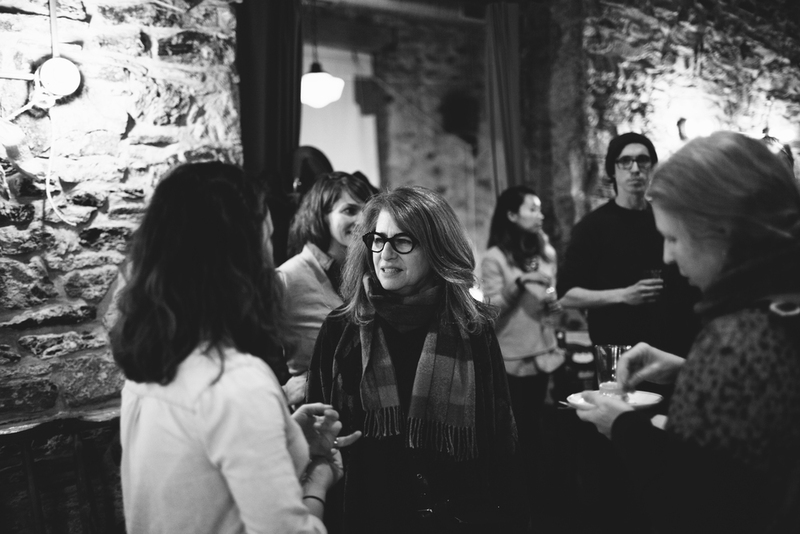 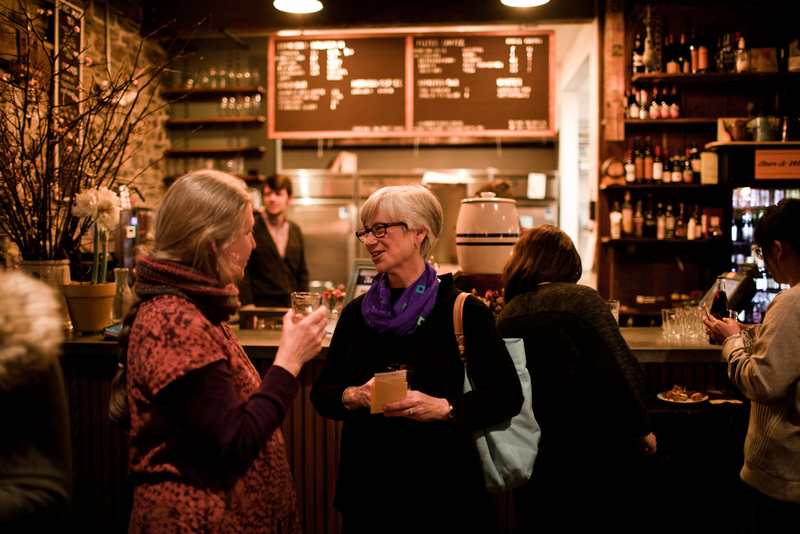 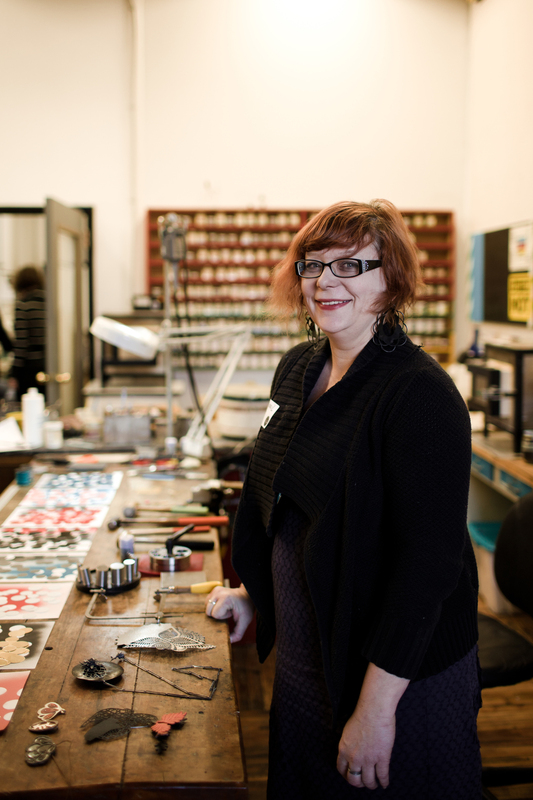 We're oh-so glad to count The American Craft Council as a partner on this event, and thankful to our hosts at Artifact Coffee for being so warm and welcoming on a cold February night. 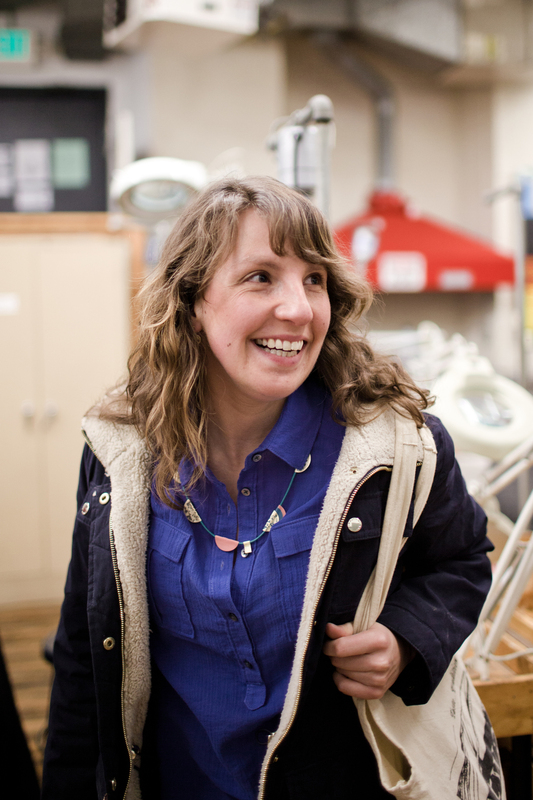 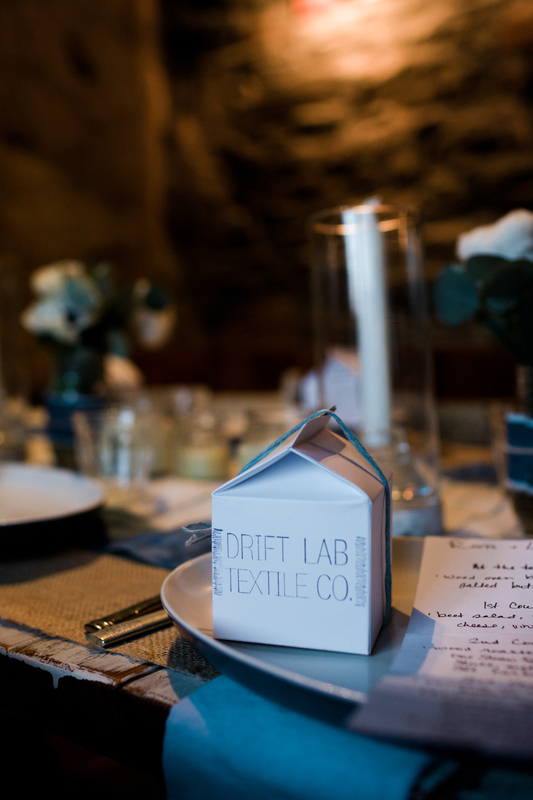 Much gratitude goes to Sarah Pottle of Driftlab Textile Co. for her clear passion and wealth of knowledge on natural plant dyes. 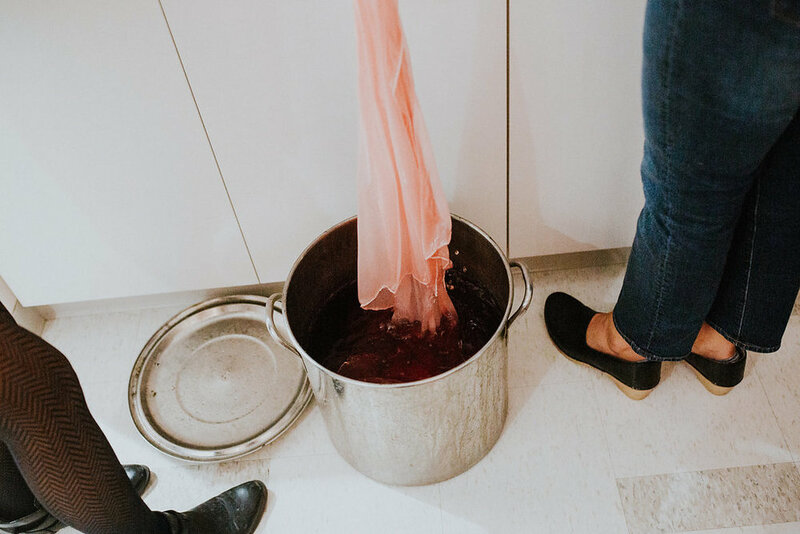 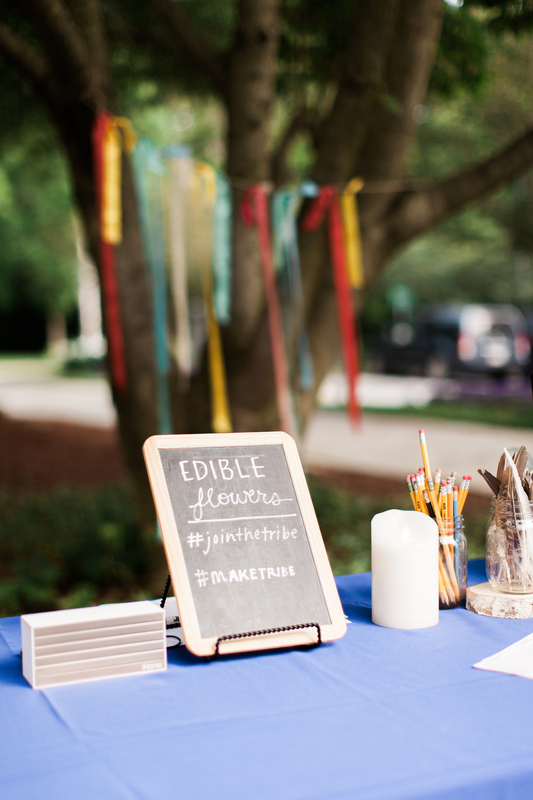 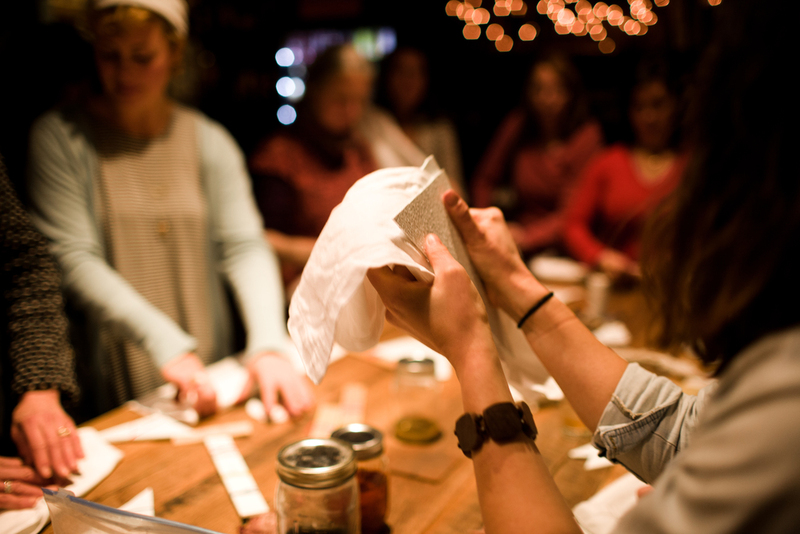 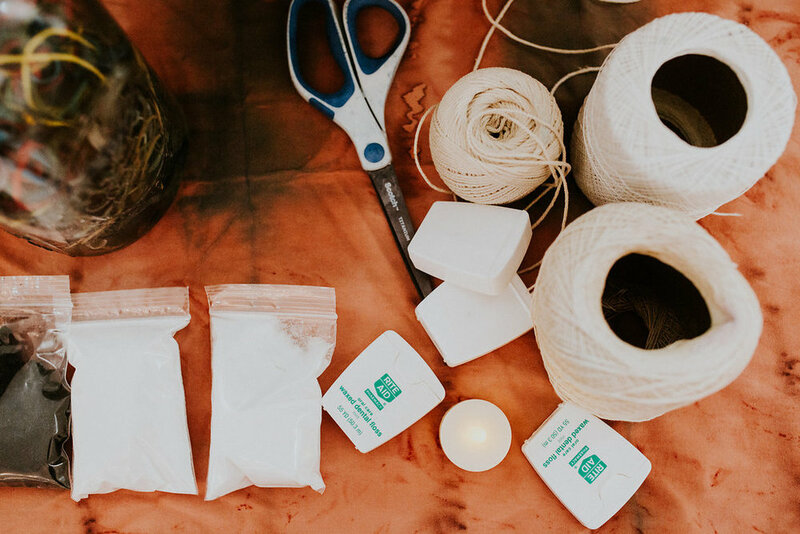 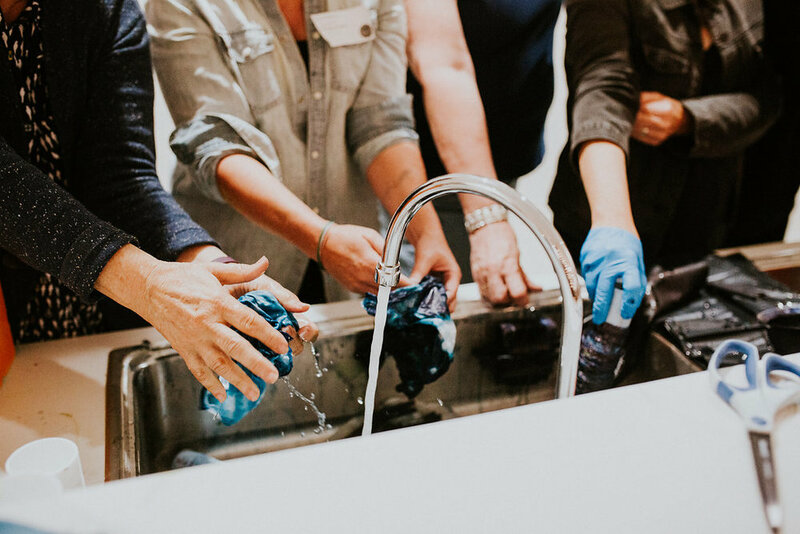 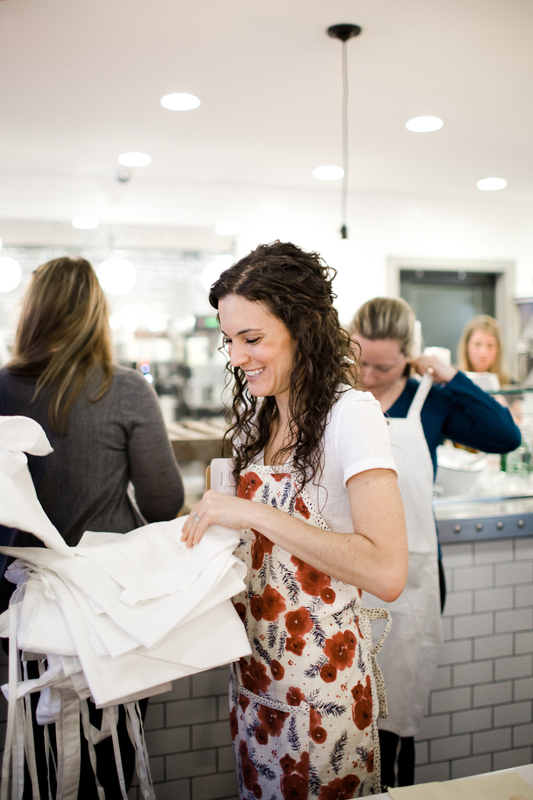 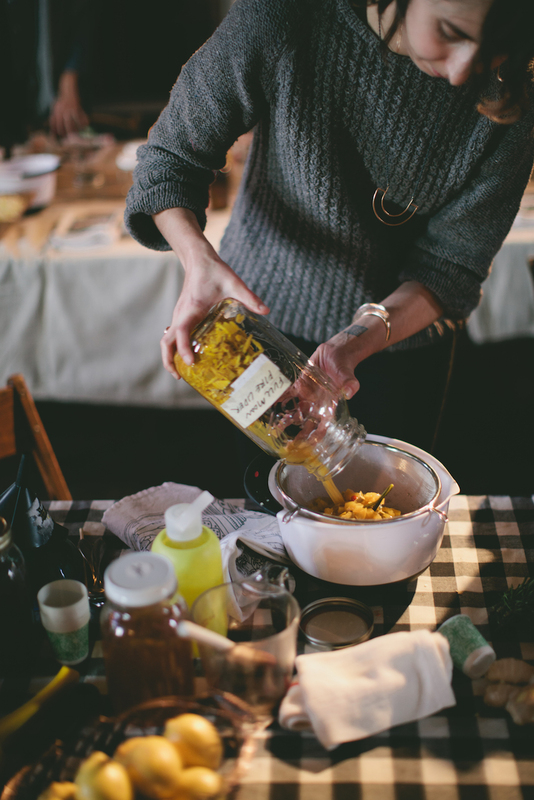 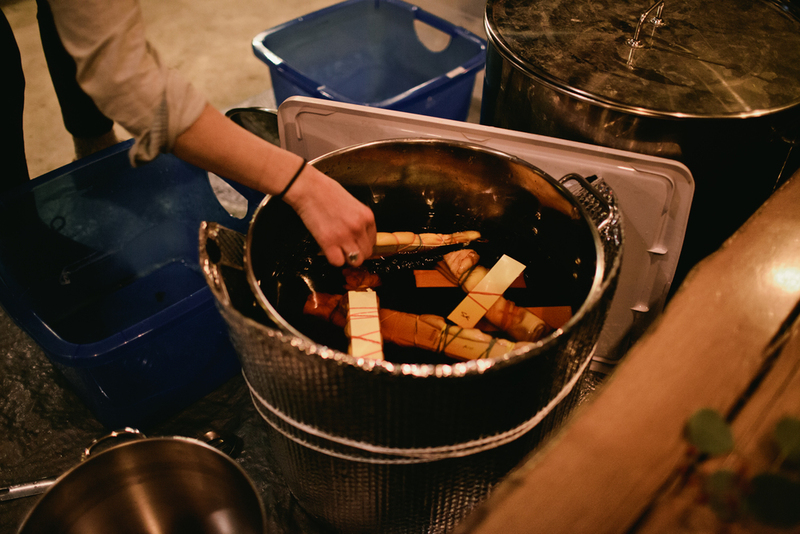 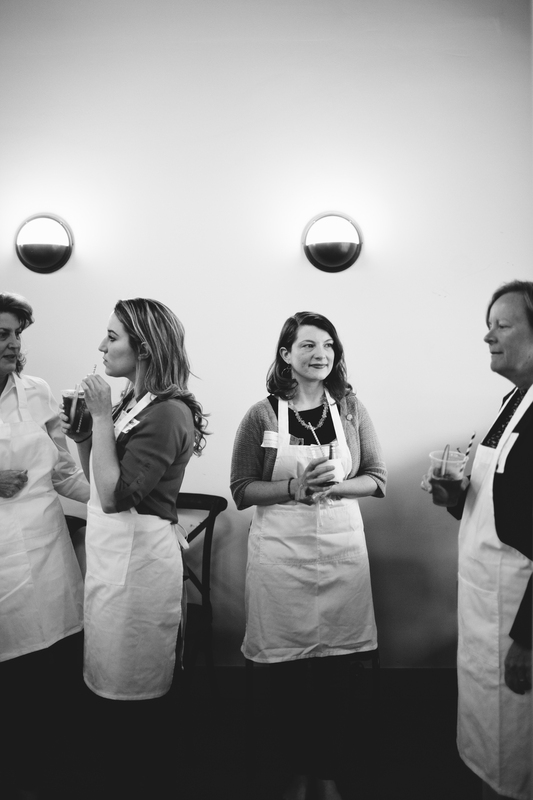 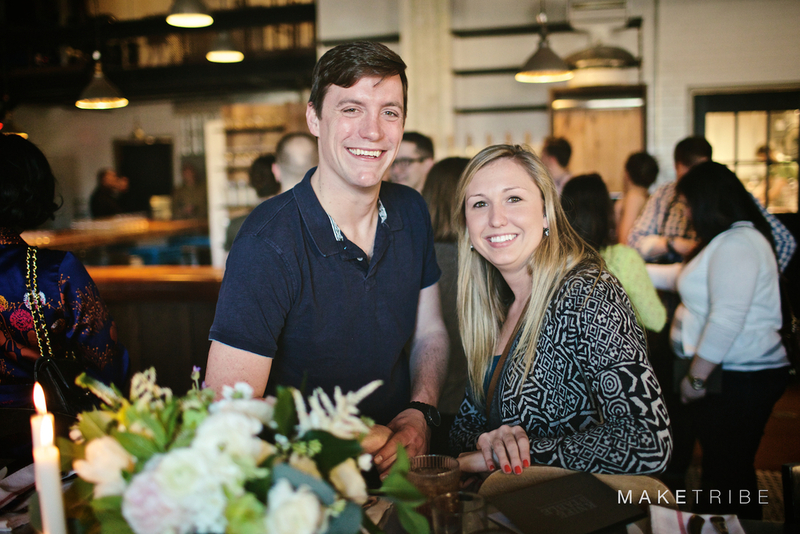 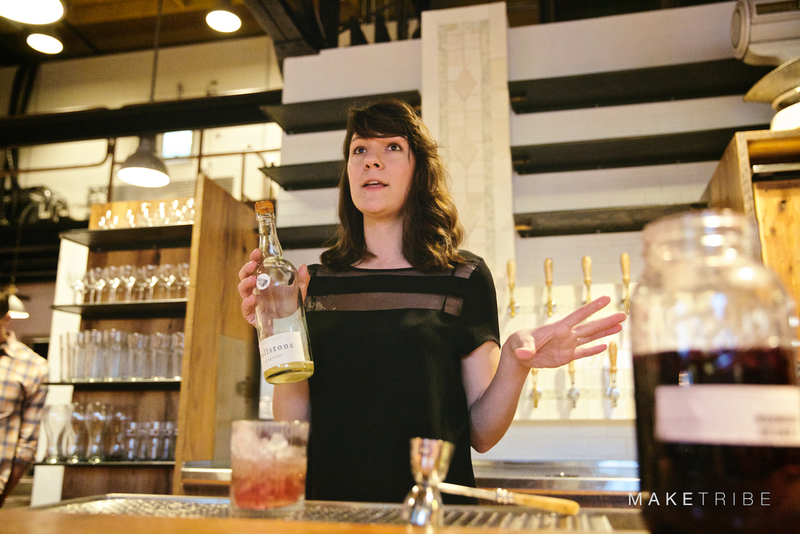 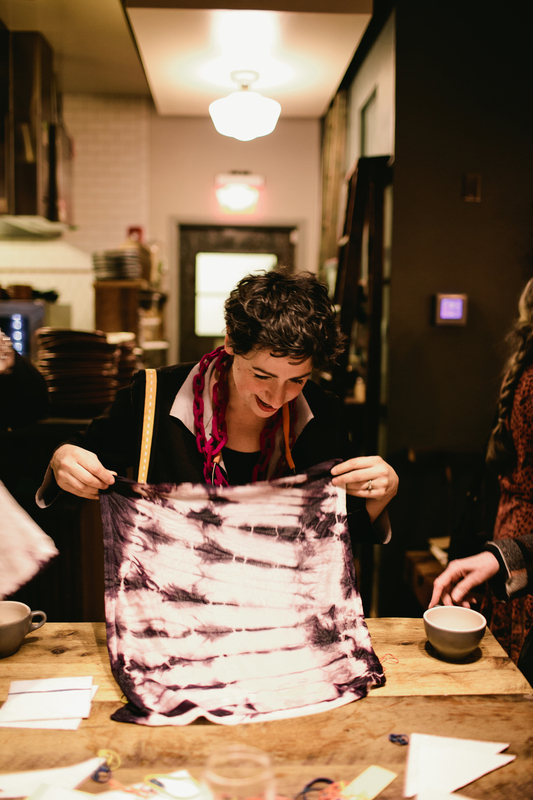 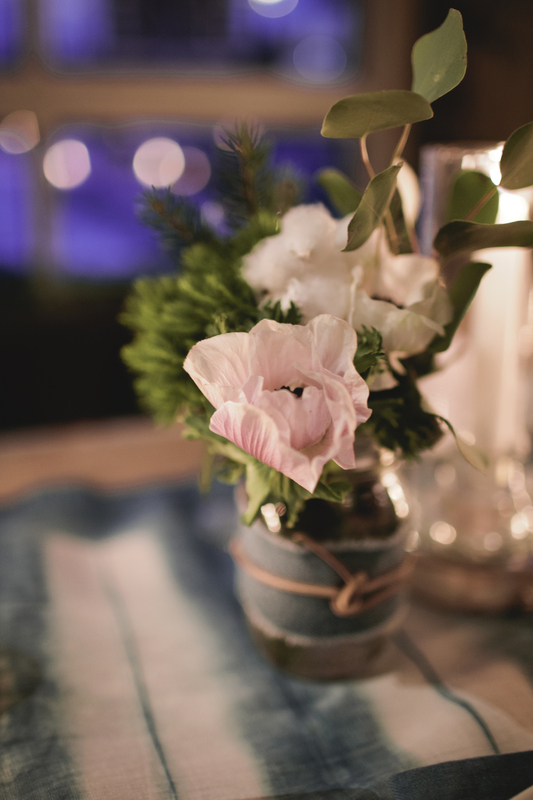 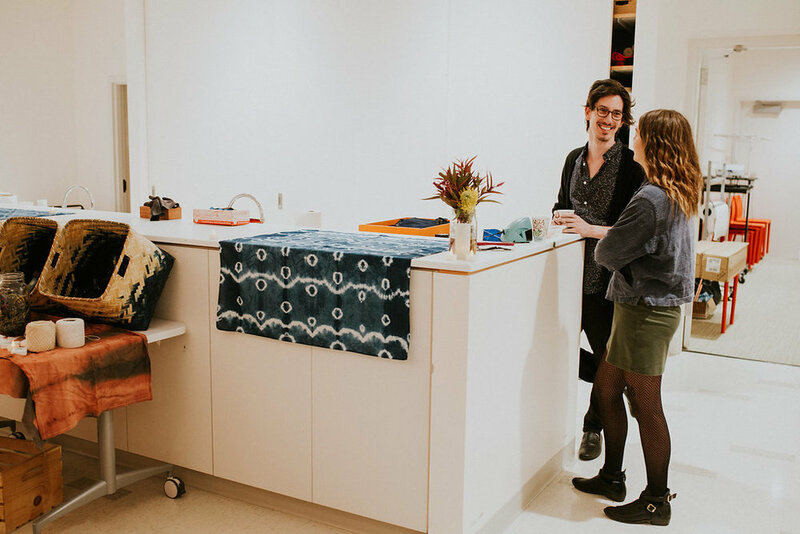 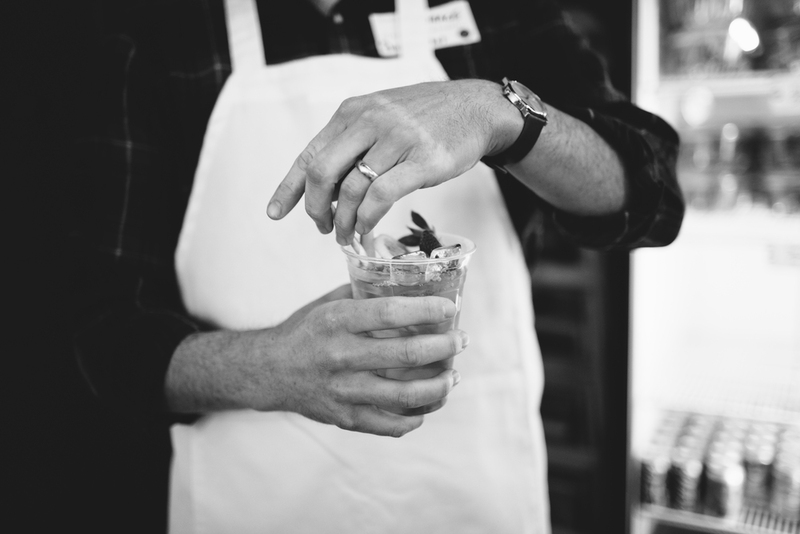 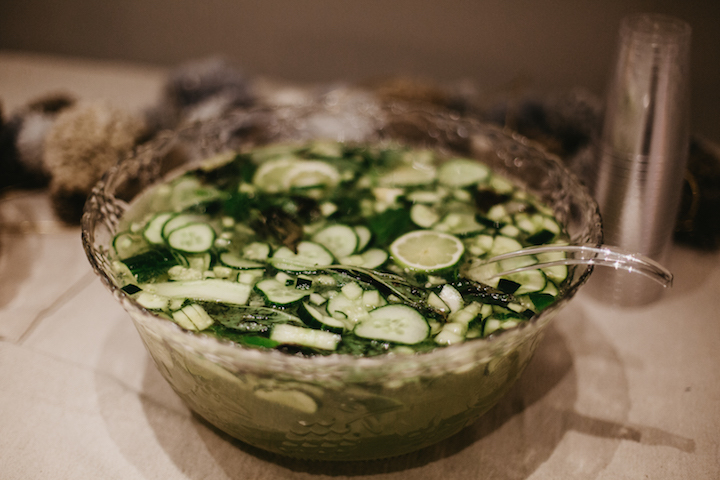 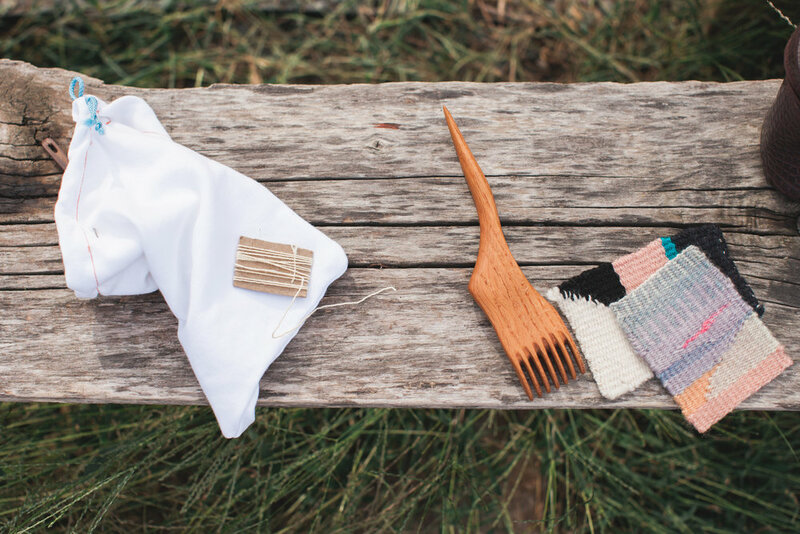 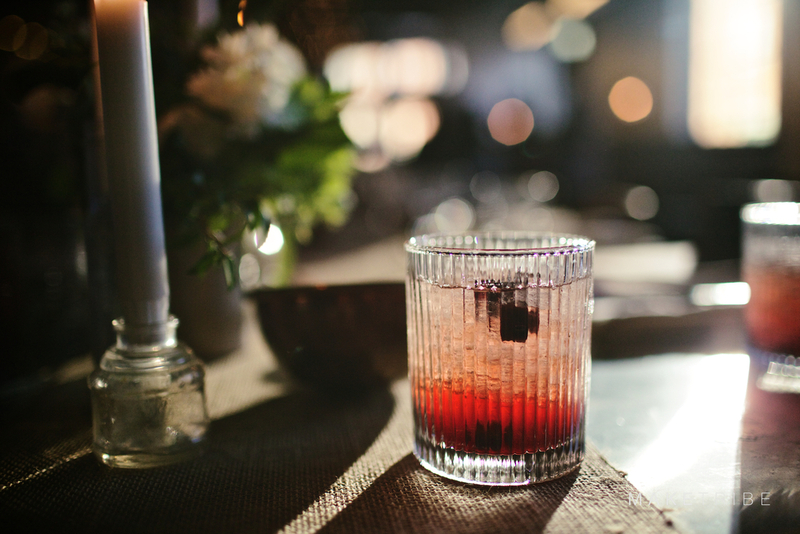 Guests warmed up with a whiskey smash, then dyed Shibori tea towels and received take-home mordant kits to capture their own roots, leaves, and bark. 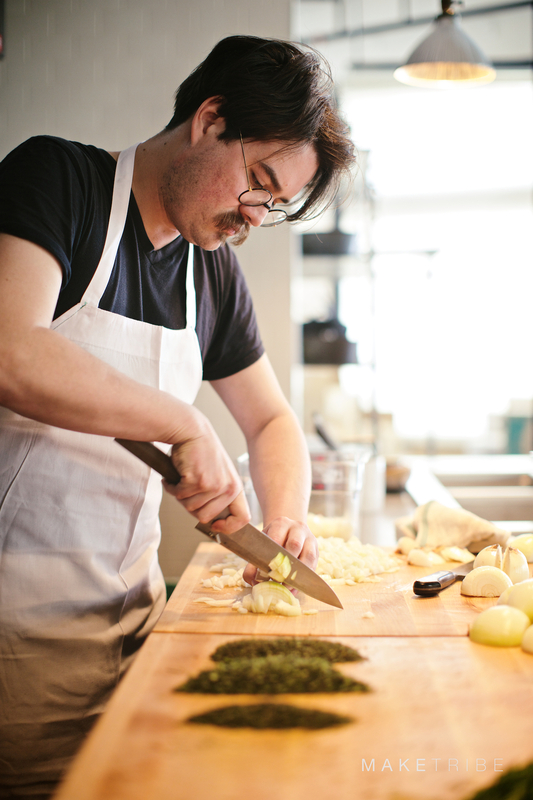 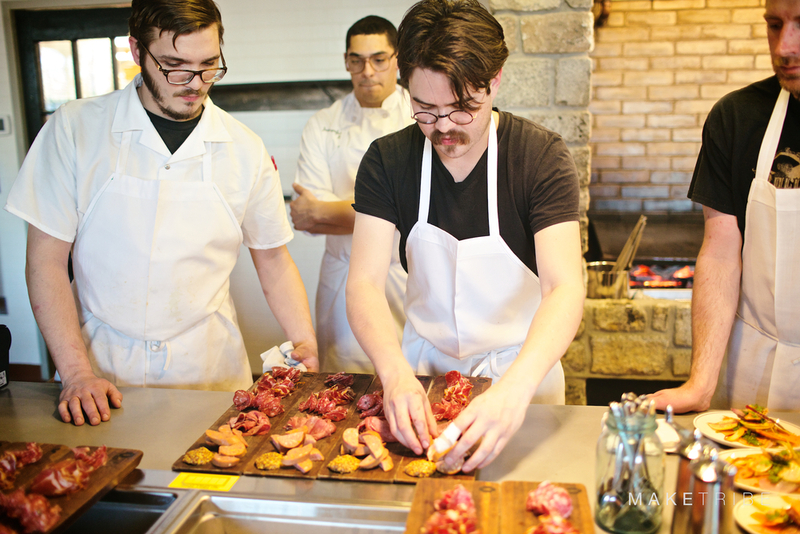 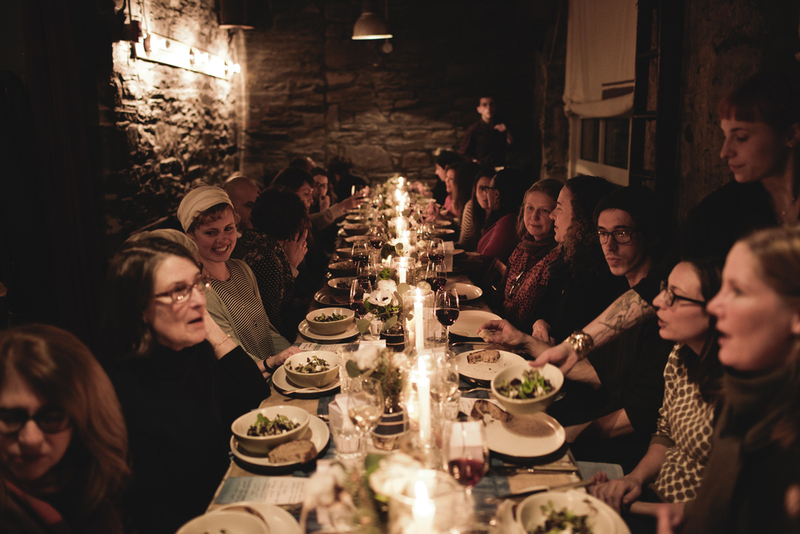 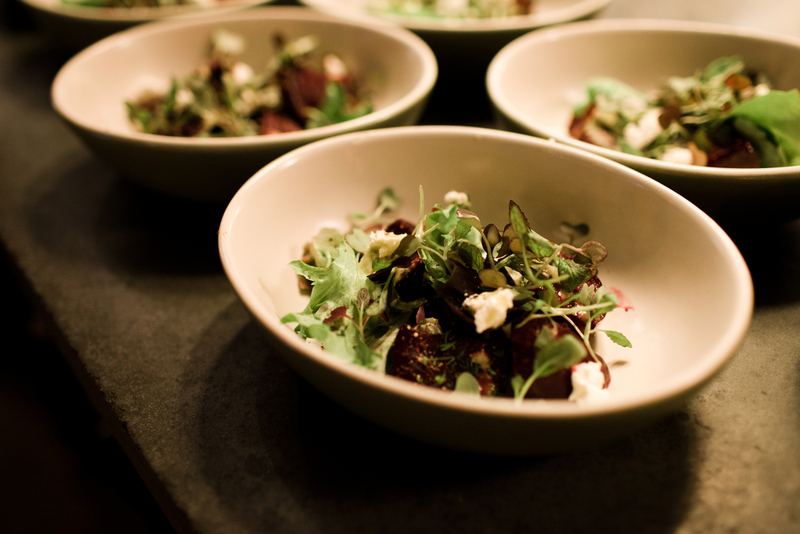 While the dye pots worked their magic, we feasted on a three-course winter supper. 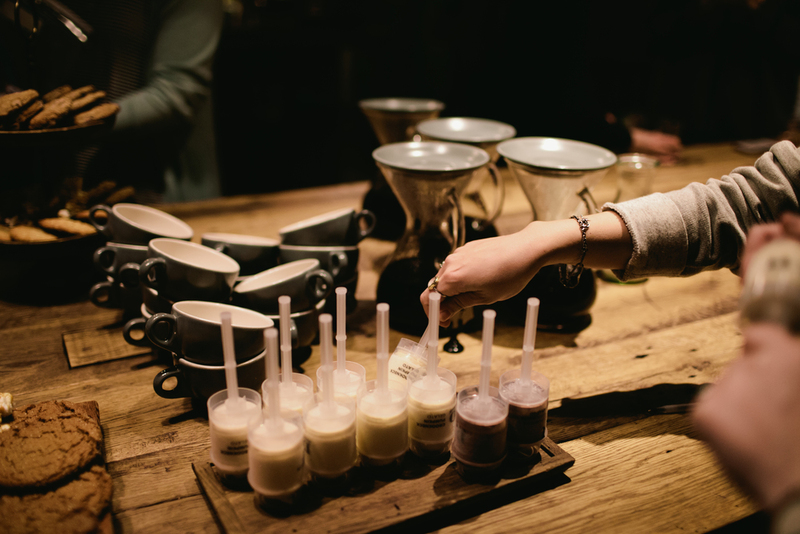 Our friends at Dolcezza Gelato capped off the evening with darling push-pops. 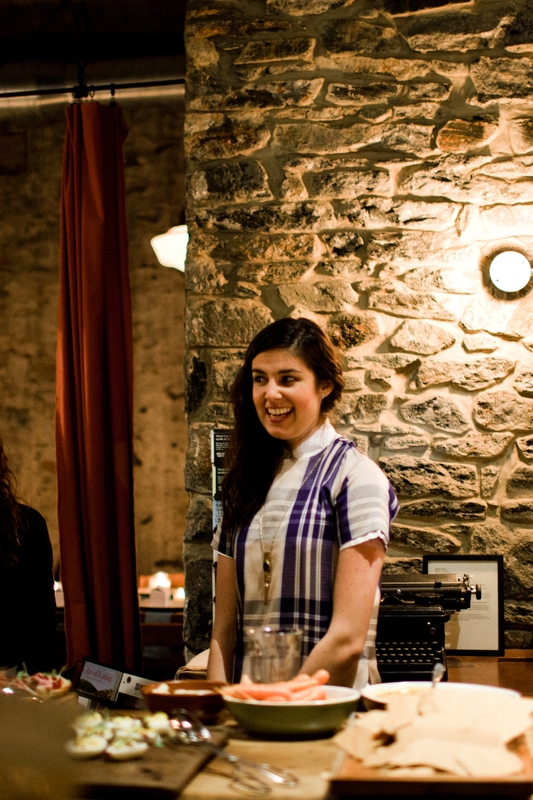 Yeah, it was a good night. 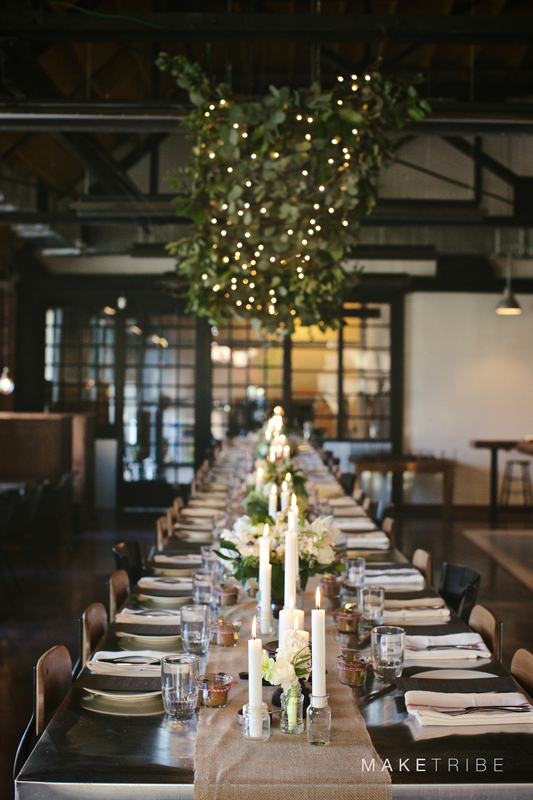 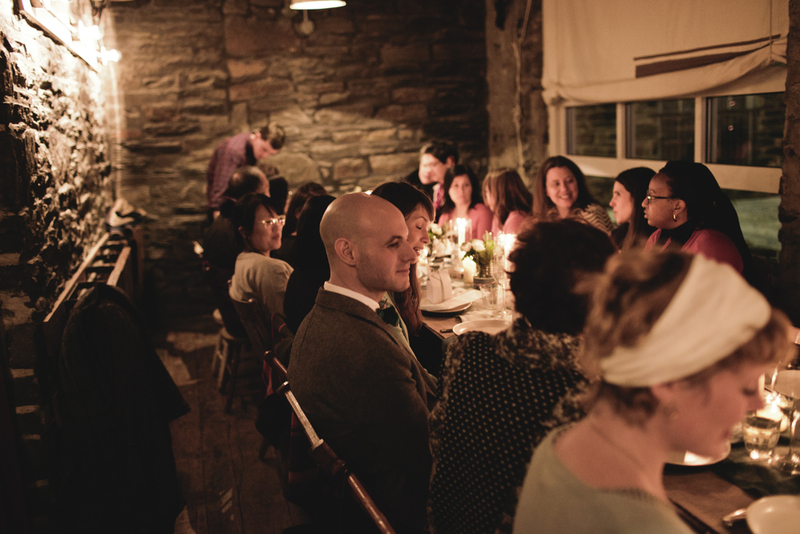 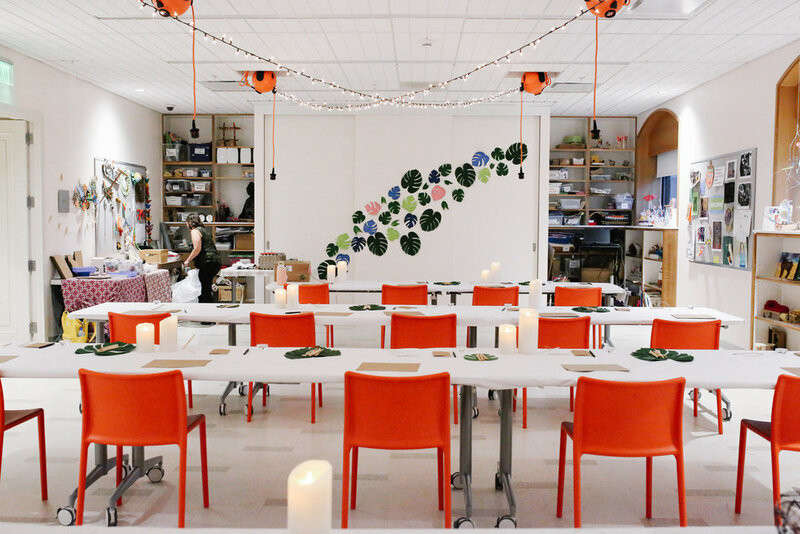 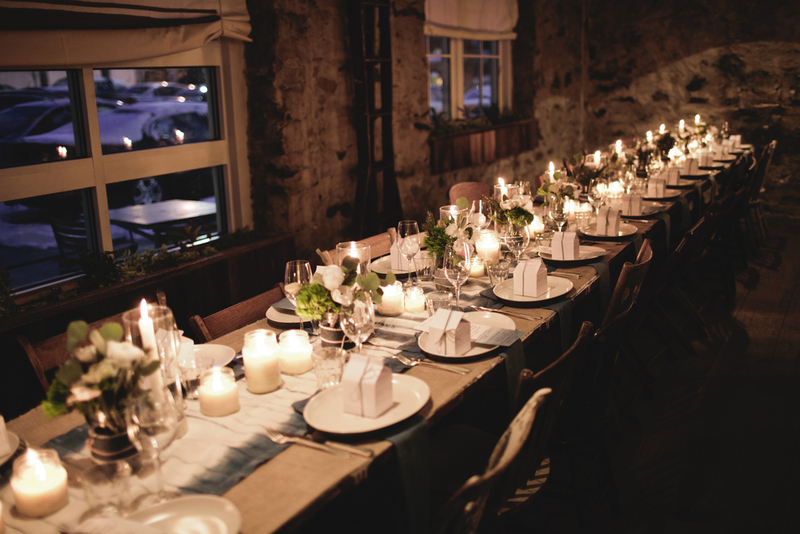 Tables were set and candles were lit at Parts & Labor for our first Skill Supper. 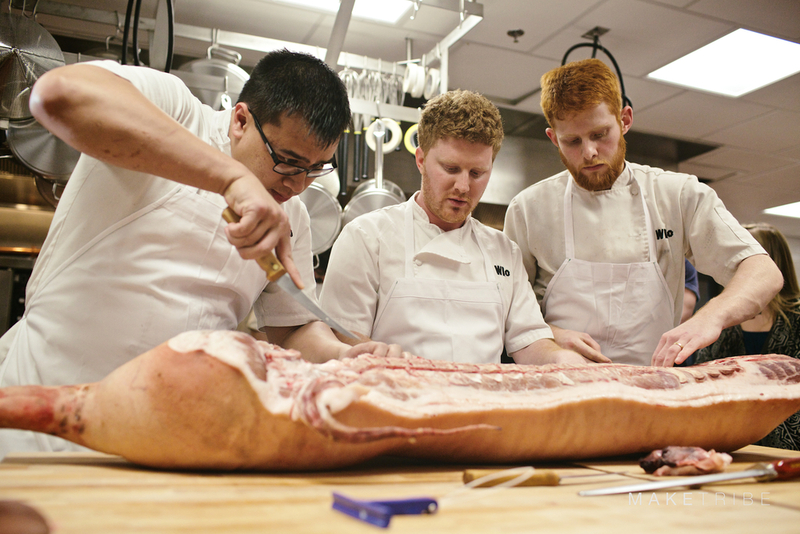 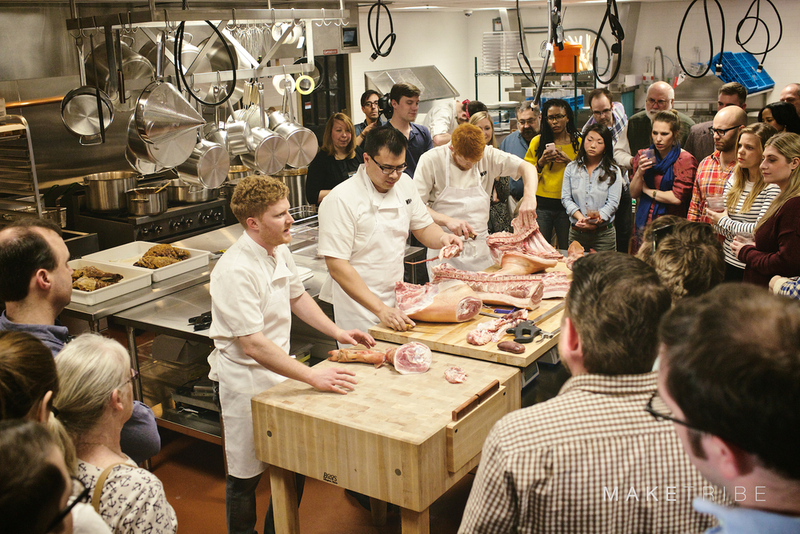 George Marsh, head butcher, led a thorough lesson on seam butchery and then plied guests with a delectable three-course supper. 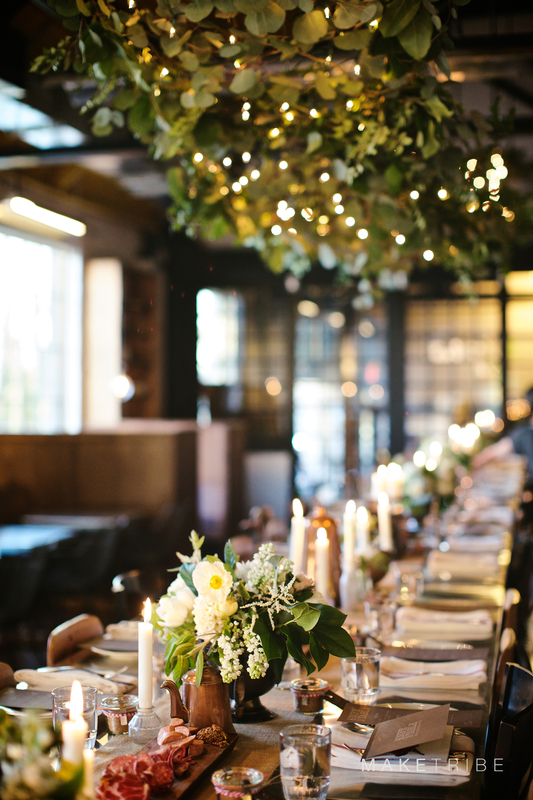 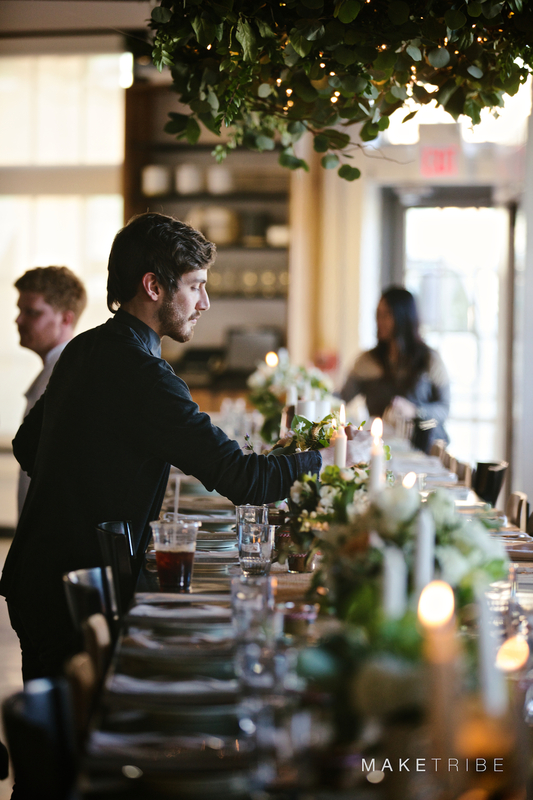 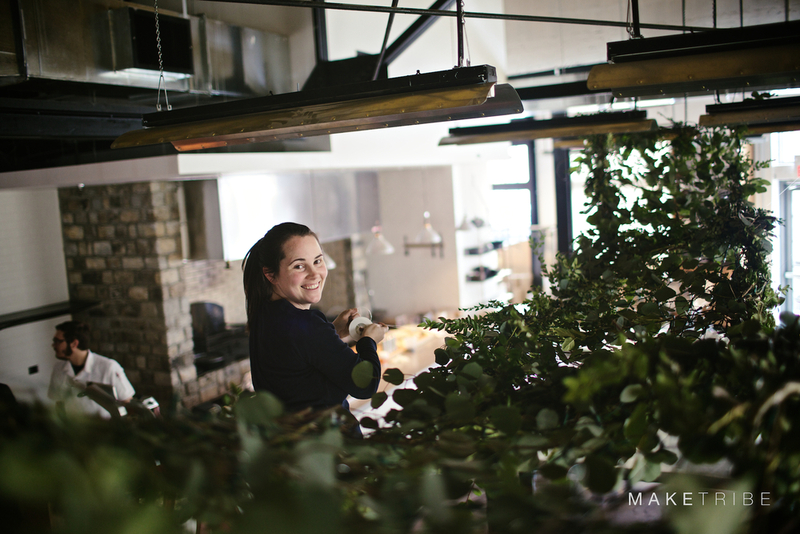 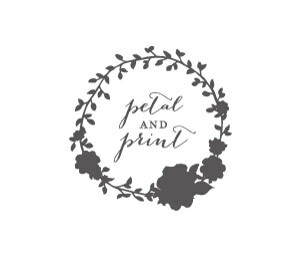 Stephanie of Shoo-Fly served up spirits, Esther & Harper set the scene and Petal and Print turned the whole place into a floral wonderland. 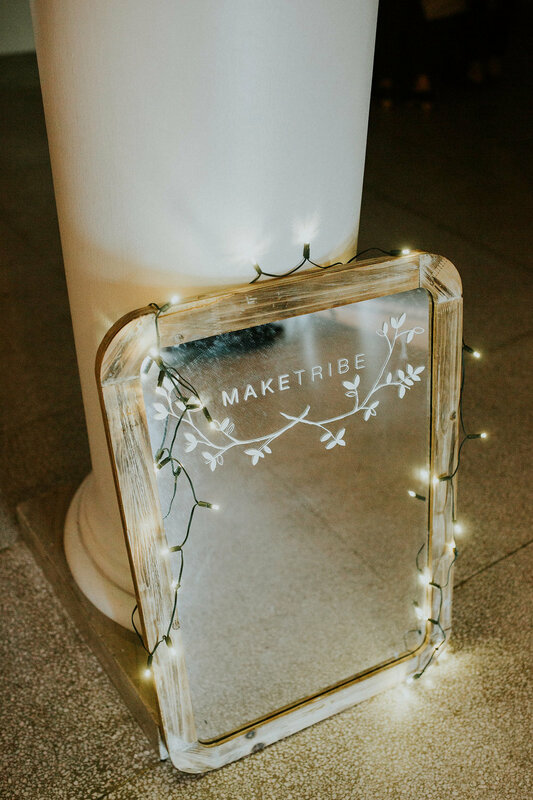 See the action in the event video from Shine Creative below.